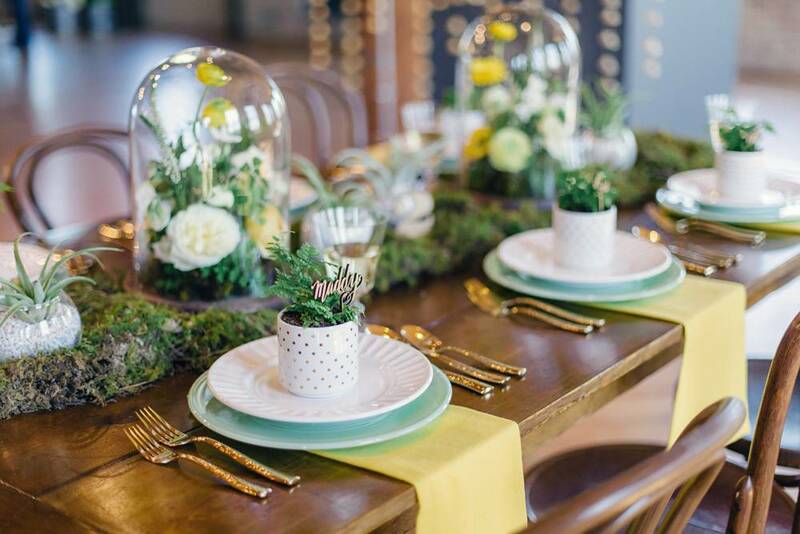 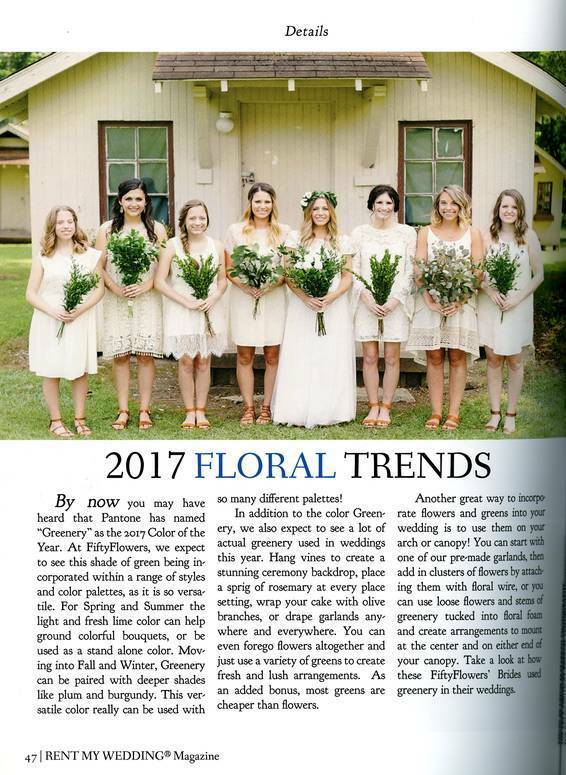 "Our CEO shares her 2018 Wedding Floral Trends in this feature. 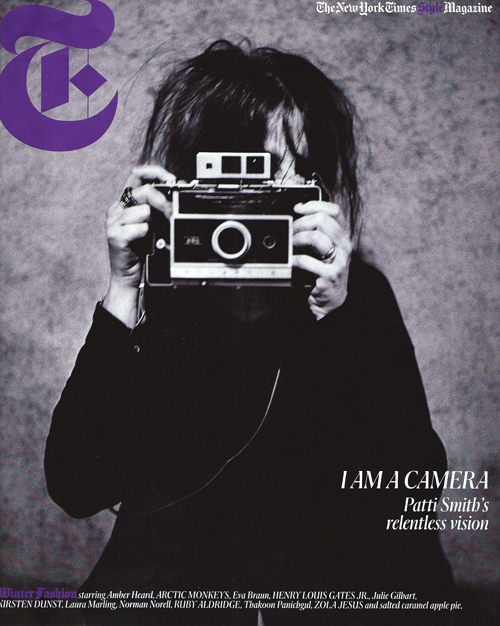 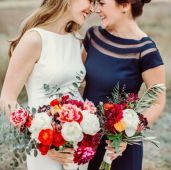 Check it out!" 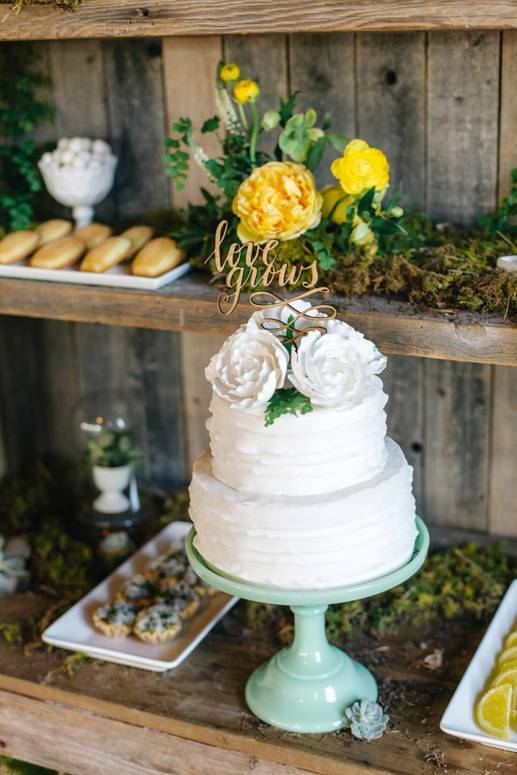 A mixture of FiftyFlowers luscious greenery was the focal point in this bridal shower, which paired beautifully with the roses! 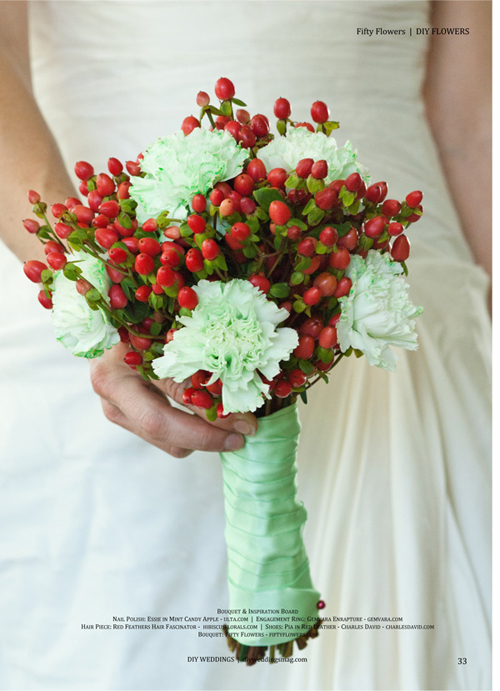 Brighten up your winter wedding by using snow-white flowers with fresh greenery. 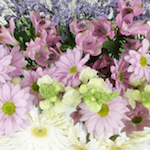 All three DIY arrangements are simply beautiful and easy to recreate. 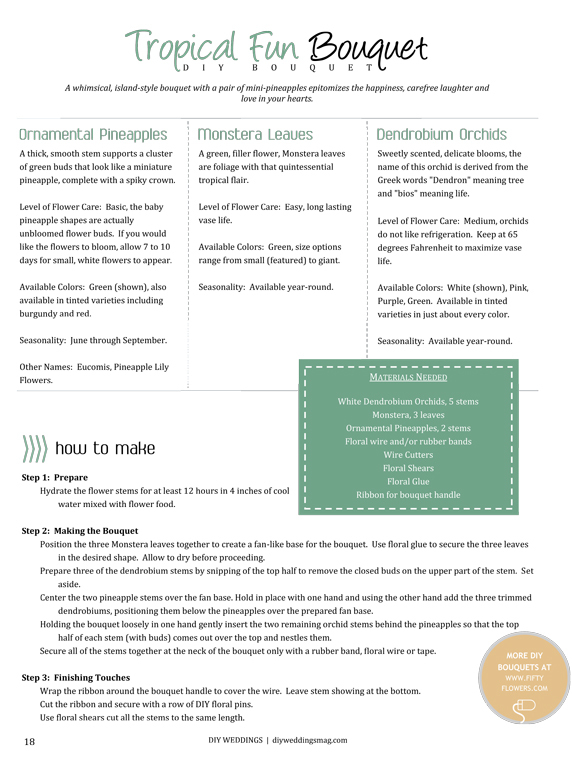 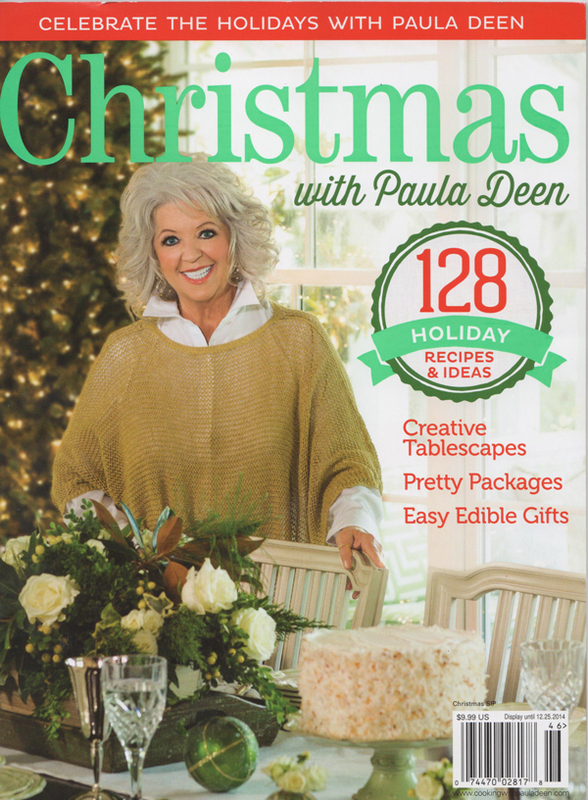 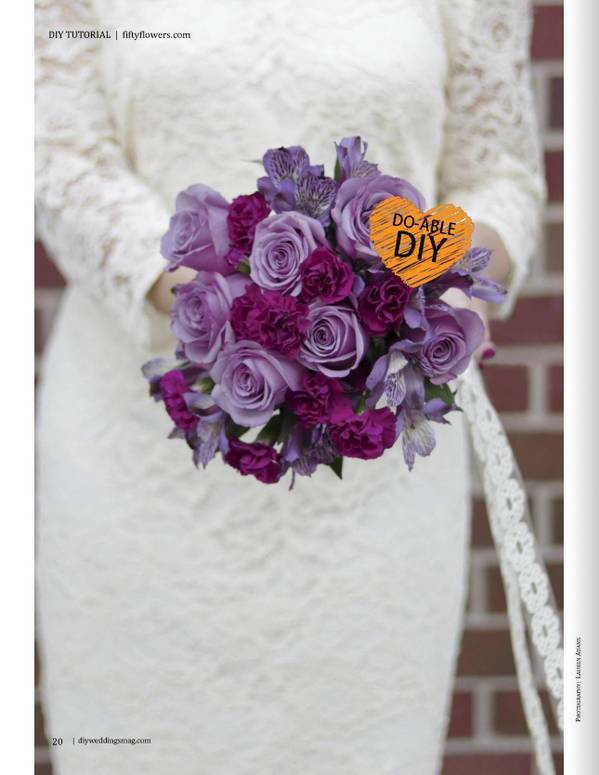 This Fall issue features three beautiful DIY bouquets with simple step-by-step instructions. 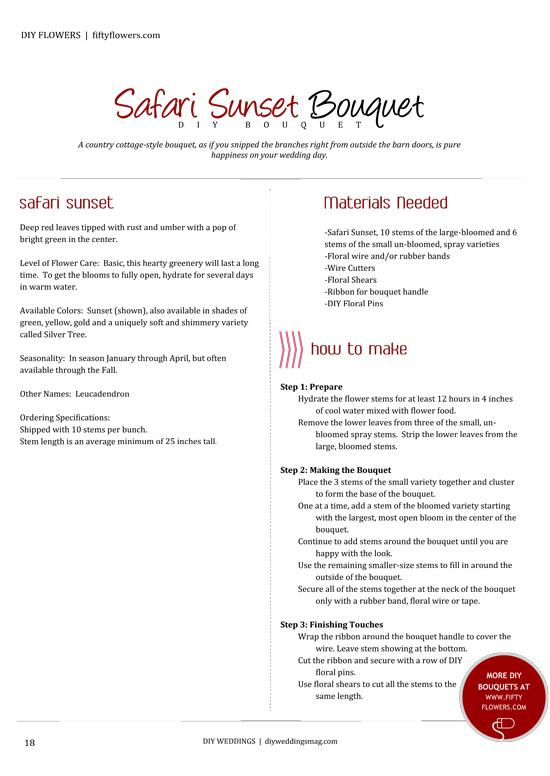 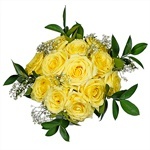 "Order flowers ahead of time to be delivered to your destination the day you arrive. 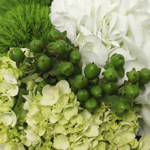 A mix of white flowers, like these from FiftyFlowers.com, is always a safe choice and works well with the natural greenery that you’ll find this time of year." 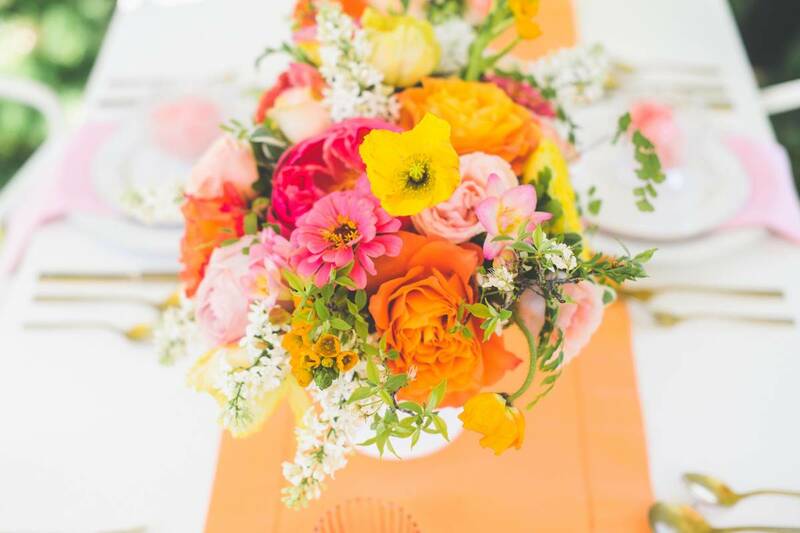 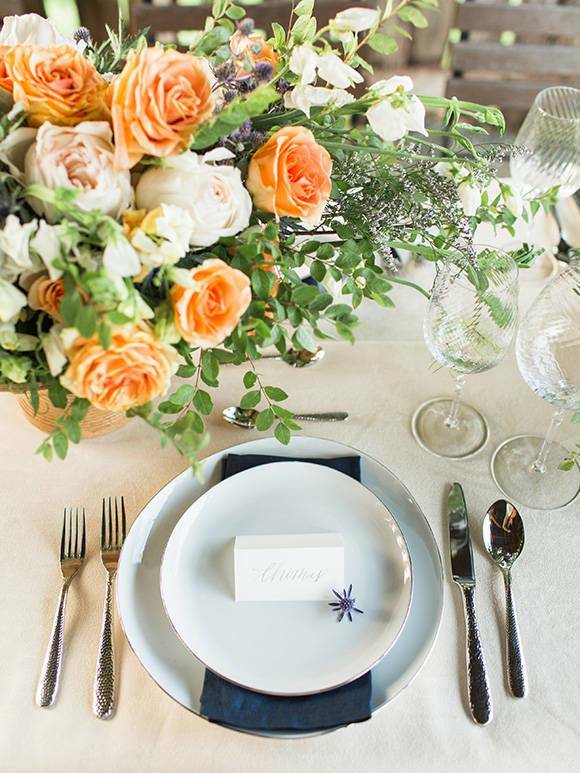 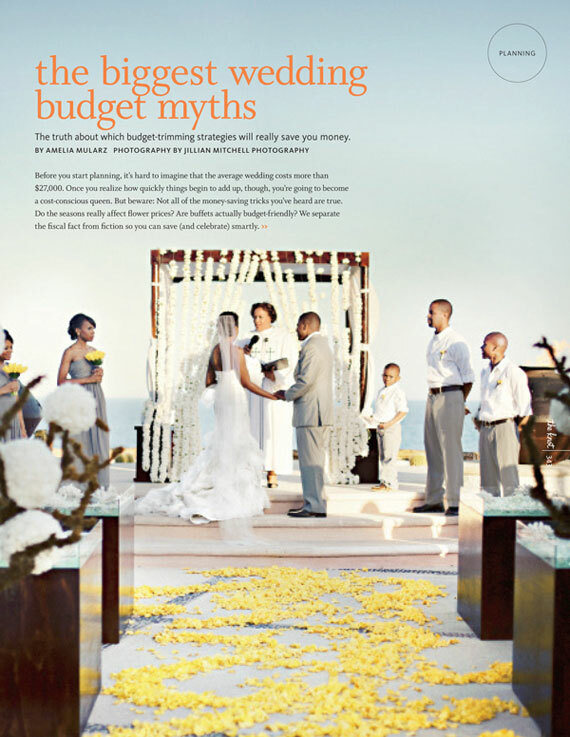 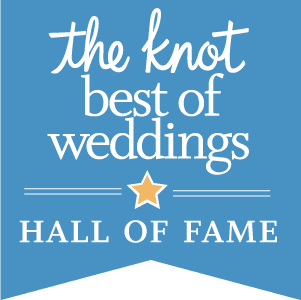 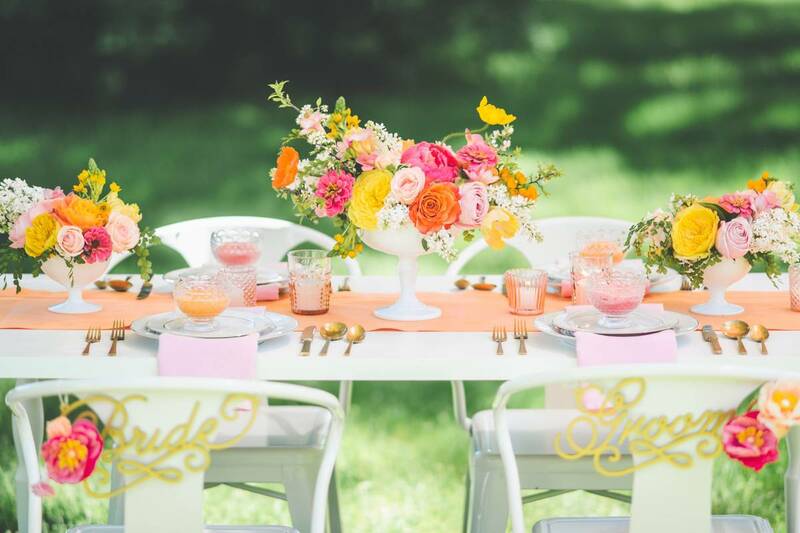 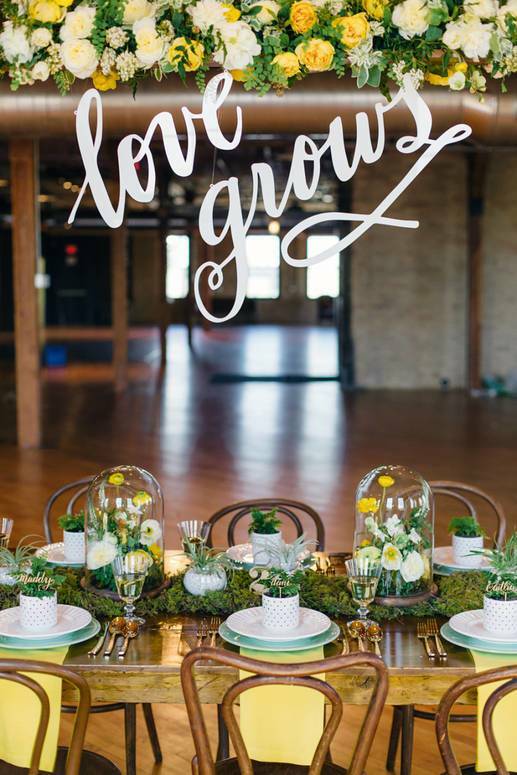 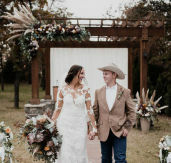 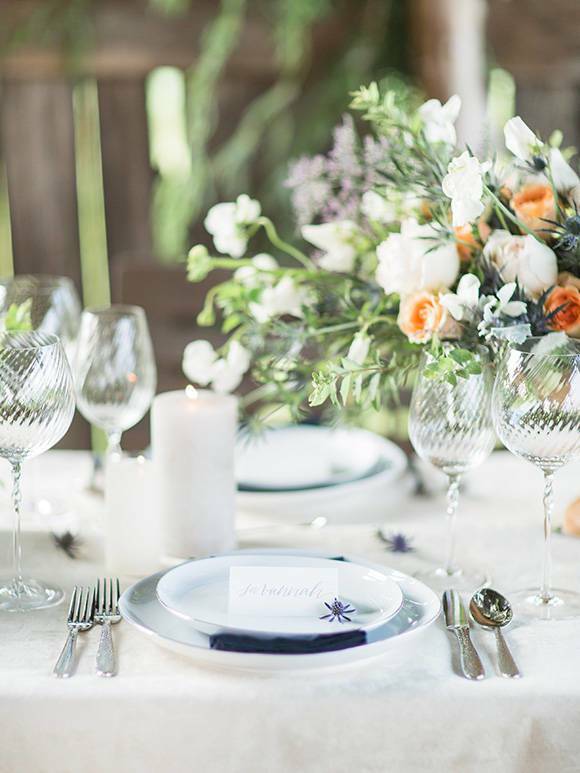 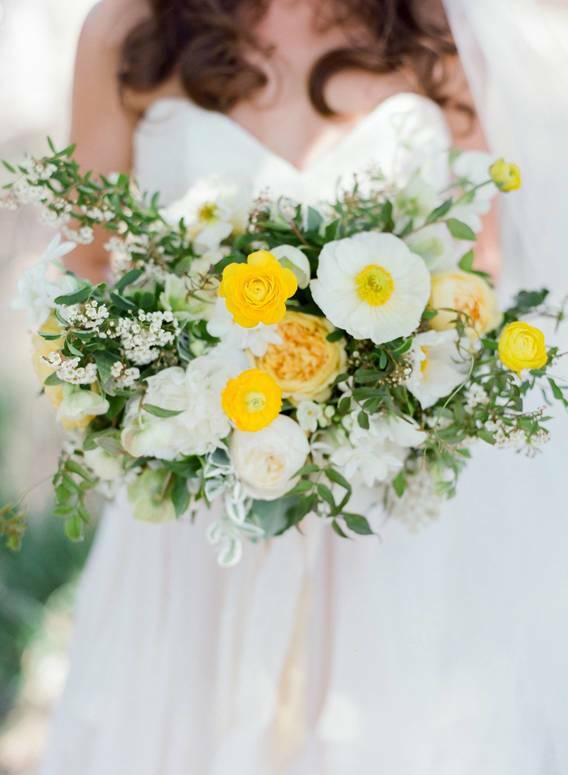 "The Biggest Wedding Budget Myths" The CEO of FiftyFlowers, Liza Roeser Atwood, is quoted de-bunking the seasonal savings on flowers myth. 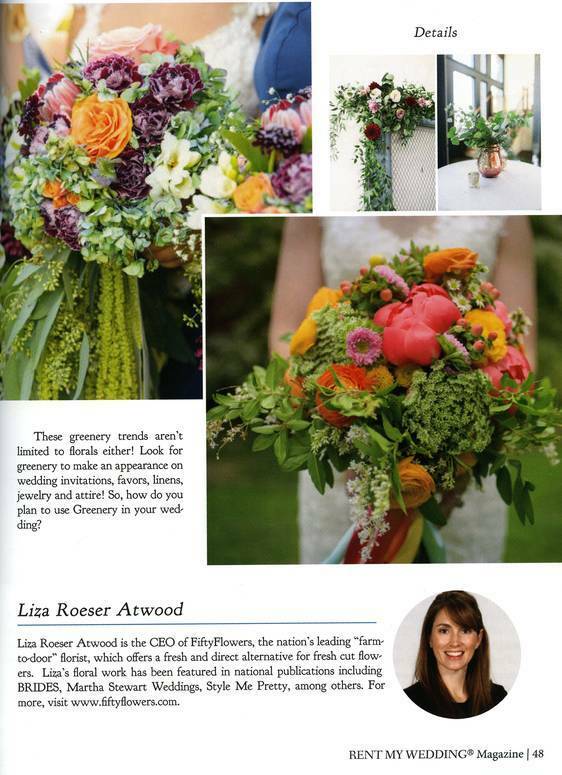 "It's true that flowers that are in-season and available locally will generally be more cost-effective than importing that same variety," says Liza Roeser Atwood of FiftyFlowers.com. 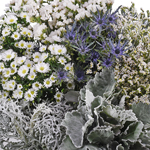 "However," she adds (and this is where the myth part comes in), "some varieties are grown year-round on commercial flower farms near the equator, so their costs don't fluctuate. 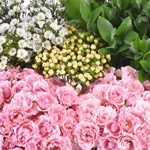 One could say that those flowers are never out-of-season." 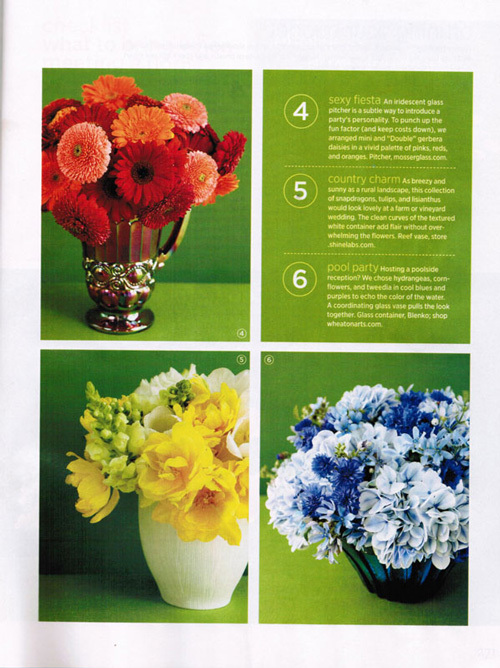 "Welcome Spring by spending time among beautiful blooms while learning the basics of putting together a gorgeous arrangement." 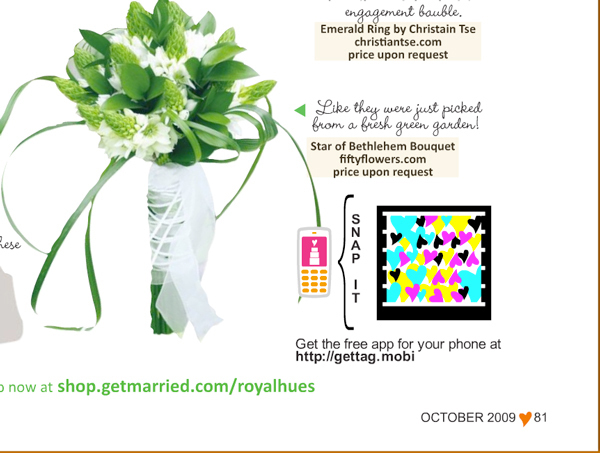 Flowers provided by FiftyFlowers.com! 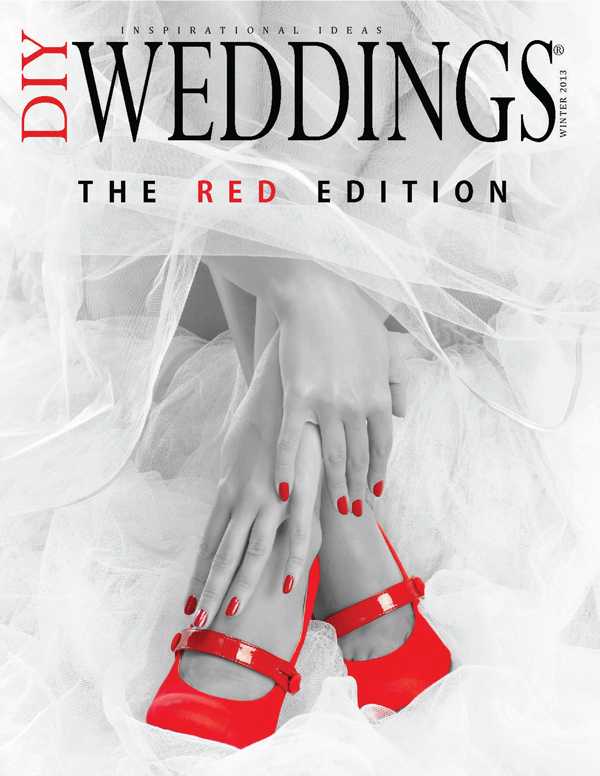 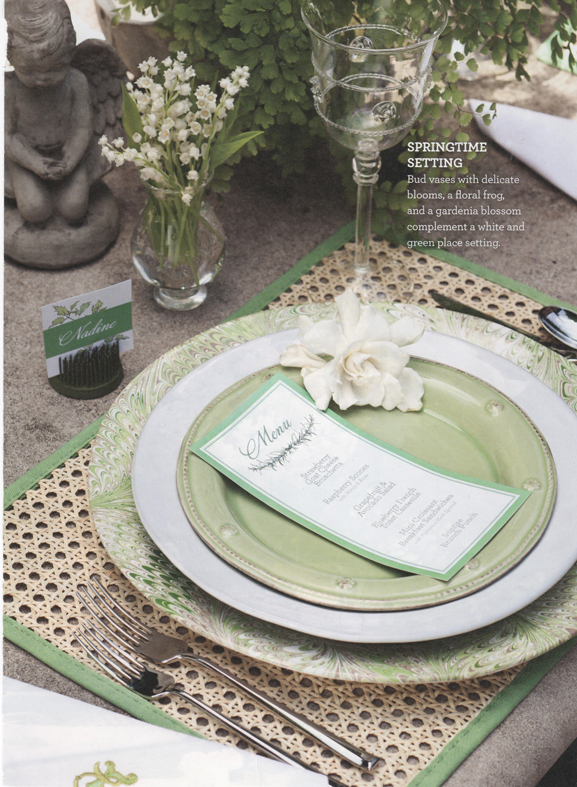 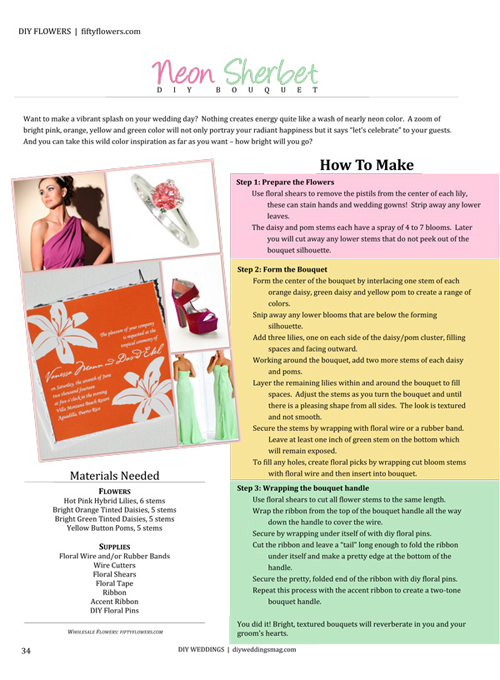 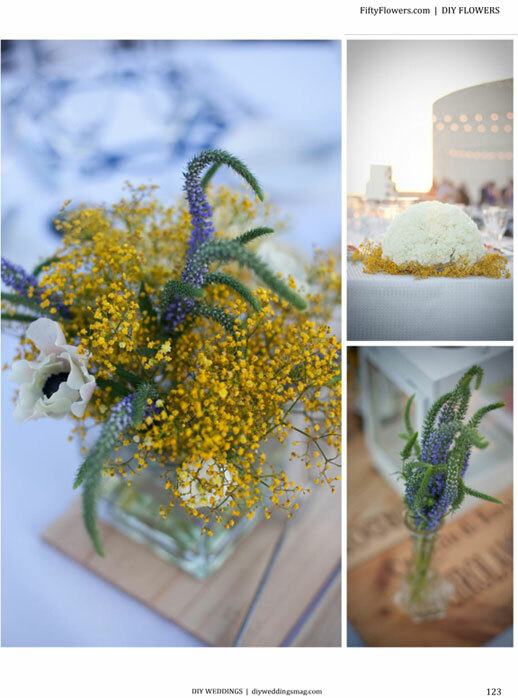 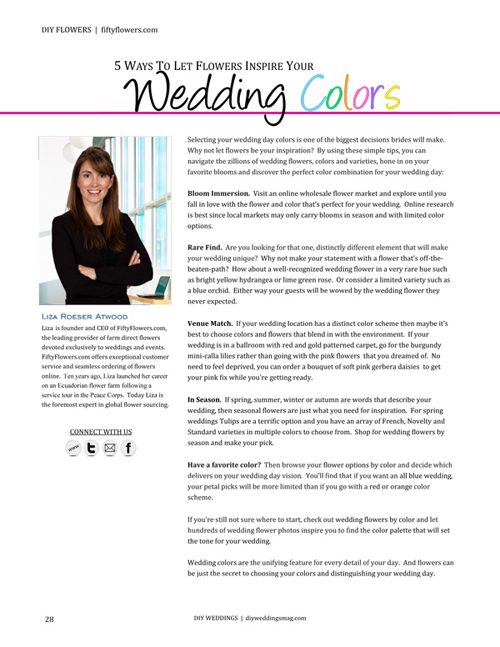 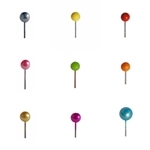 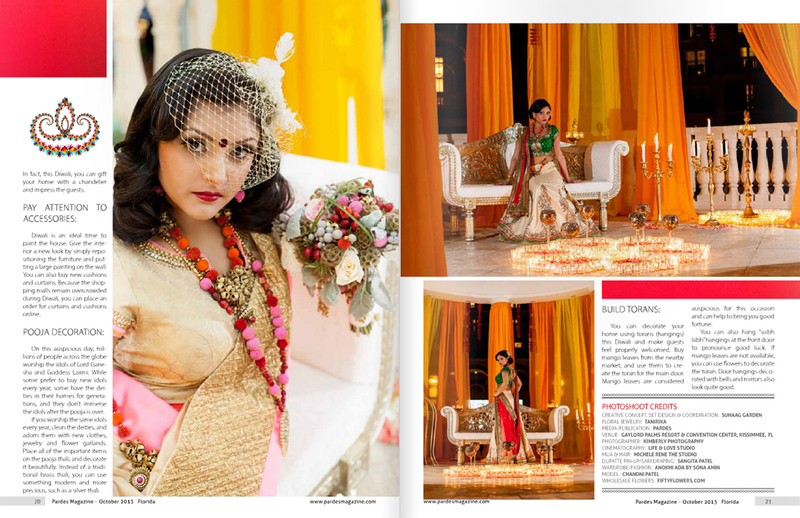 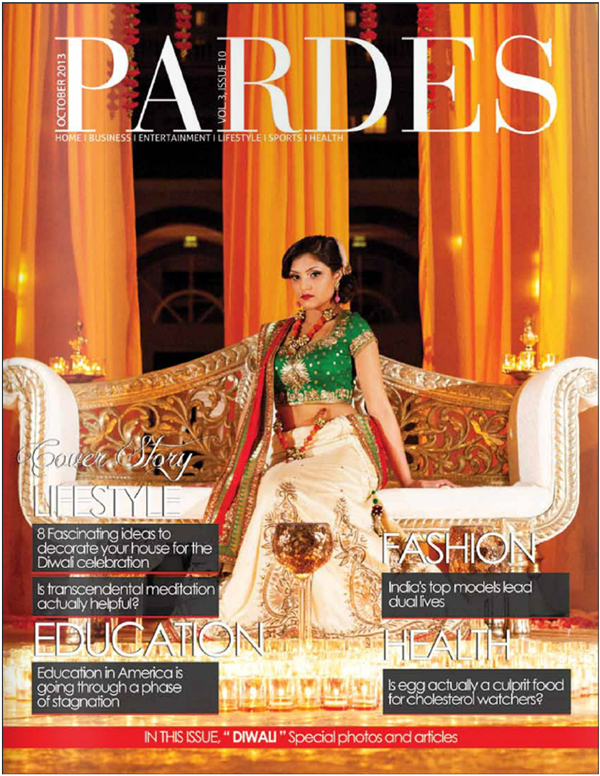 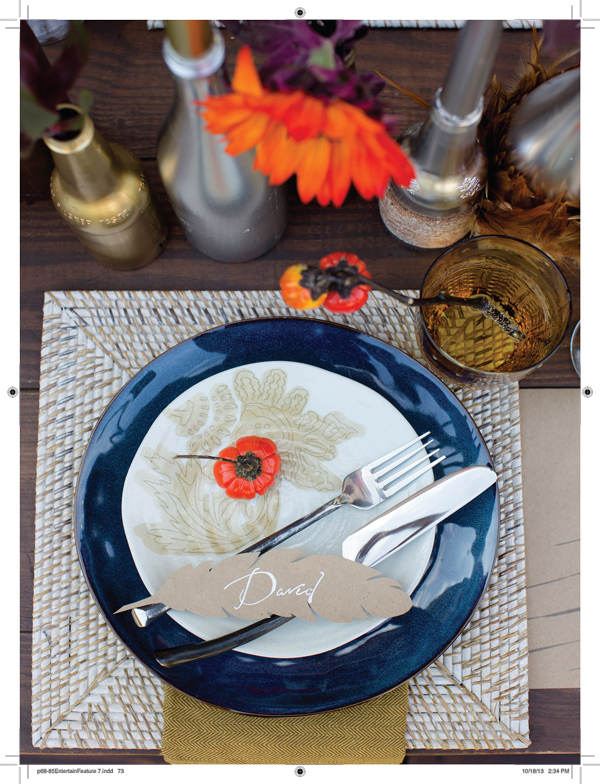 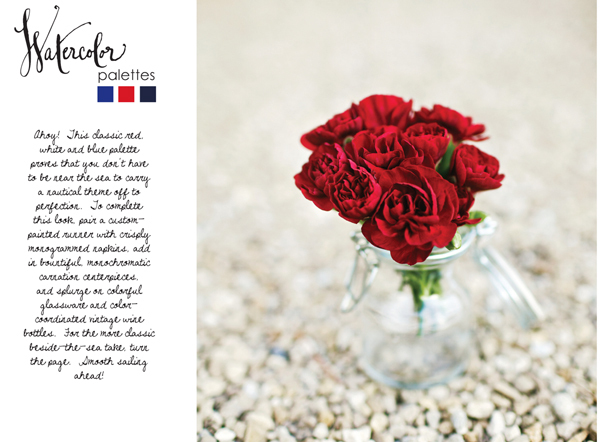 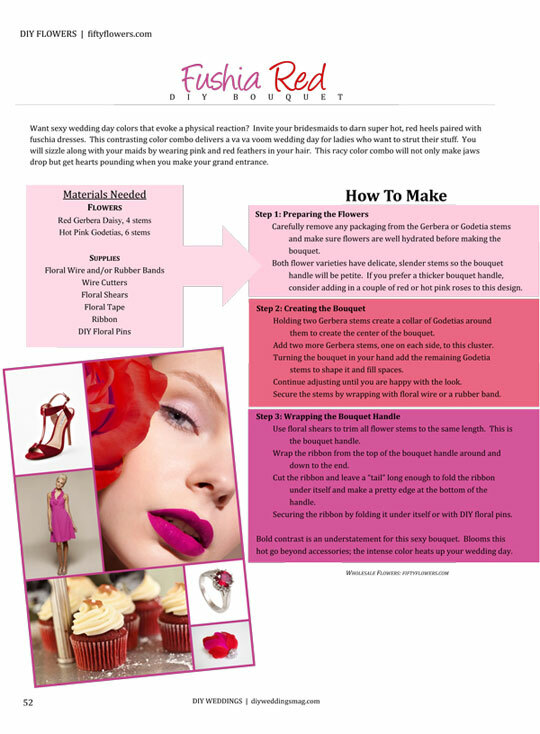 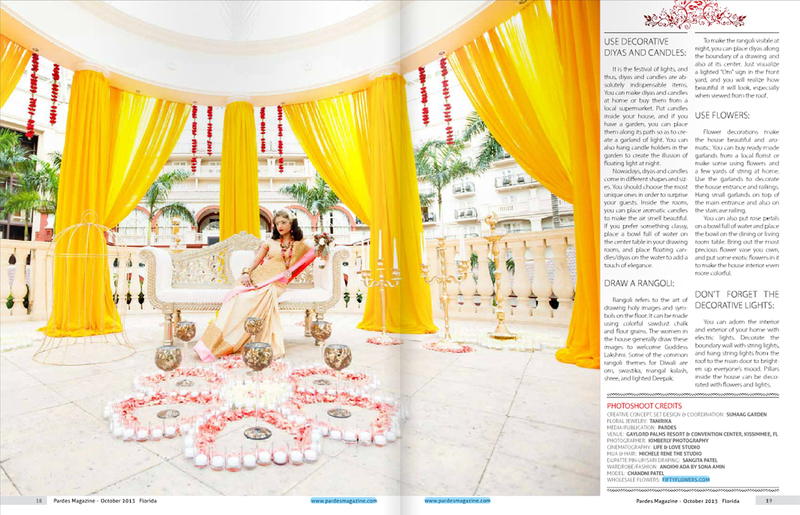 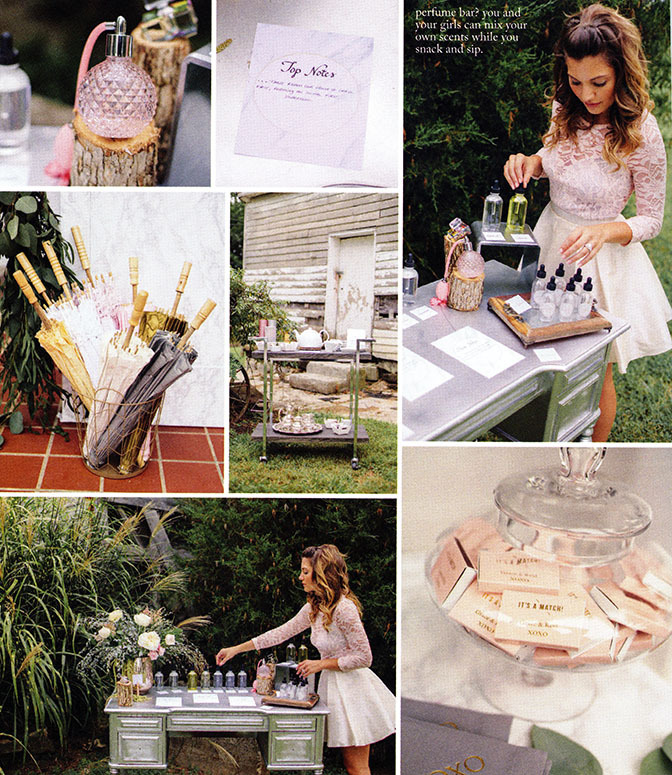 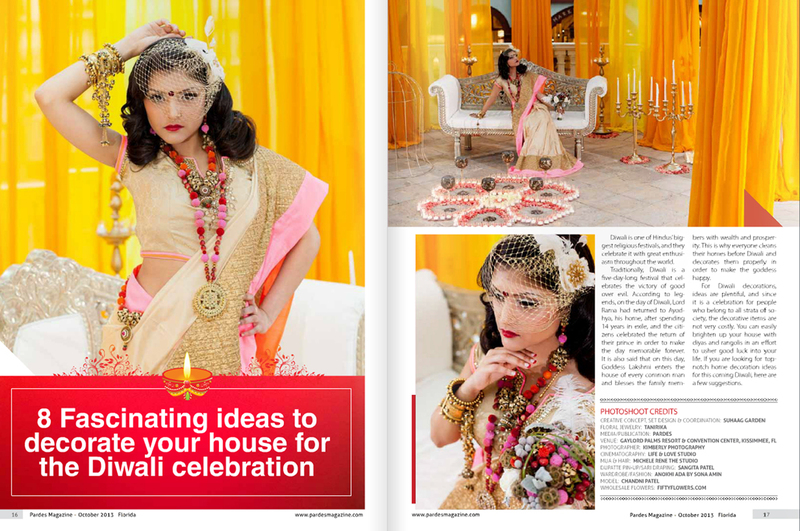 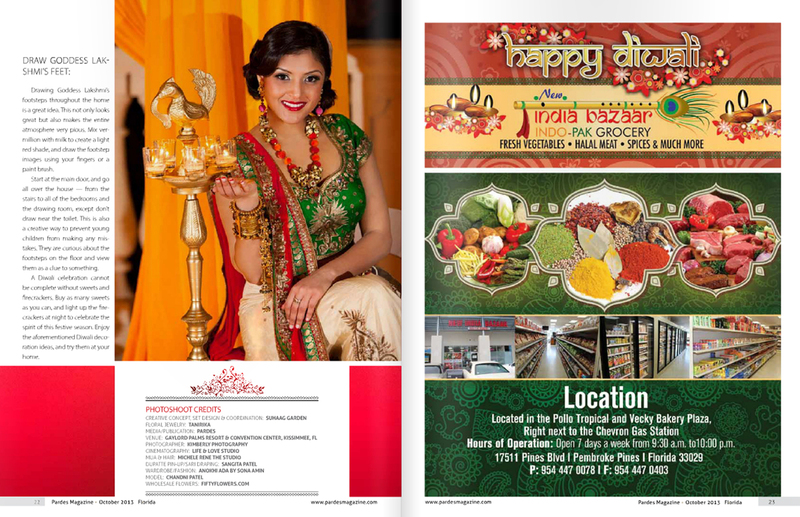 "Wedding colors are the unifying feature for every detail of your day. 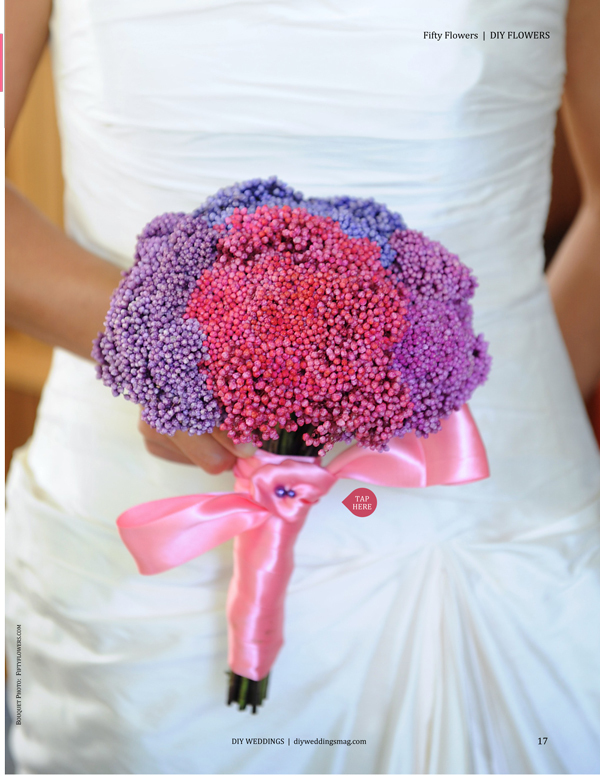 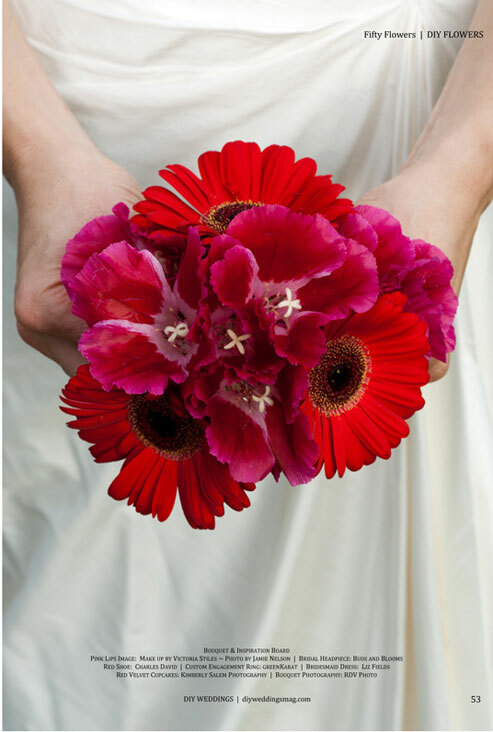 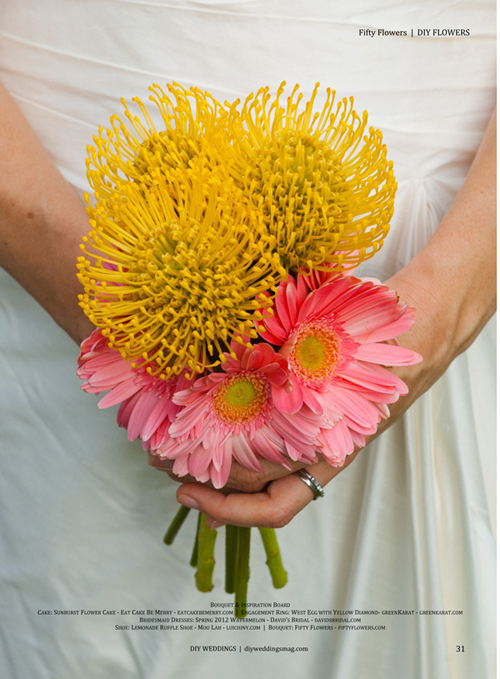 And flowers can be just the secret to choosing your colors and distinguishing your wedding day." 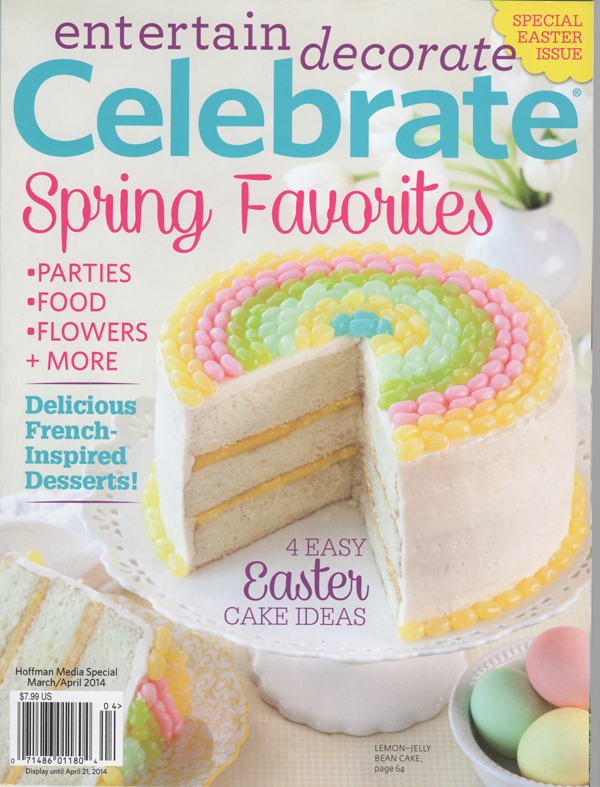 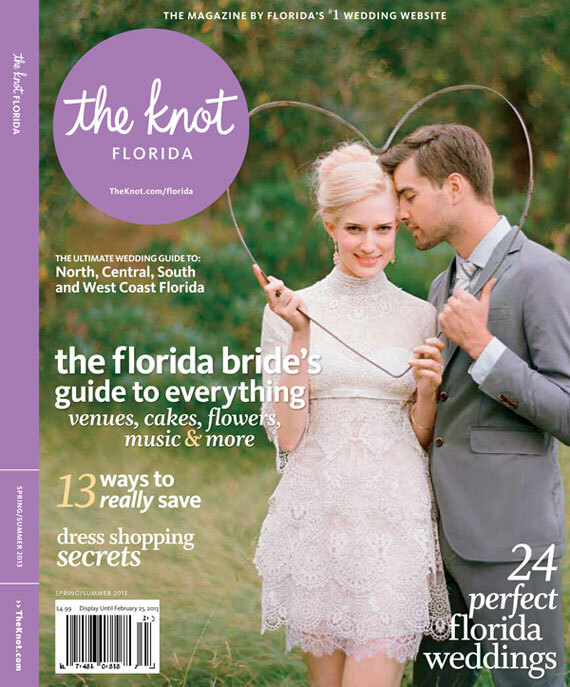 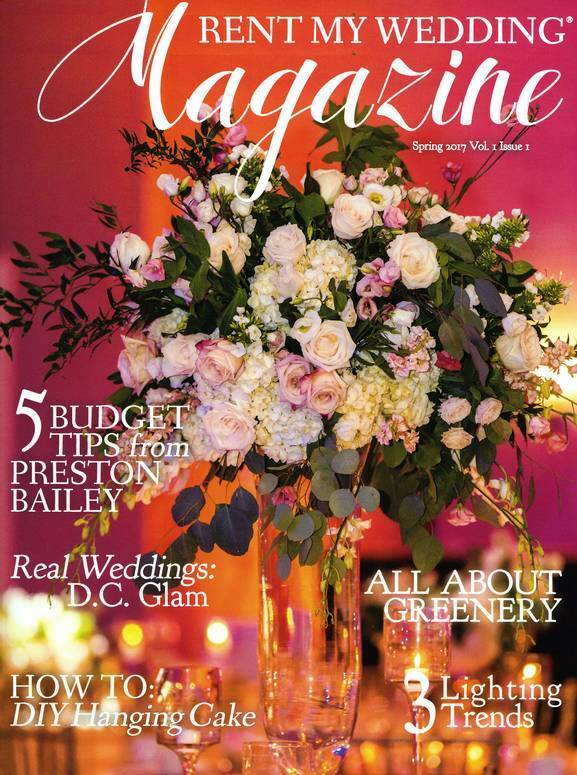 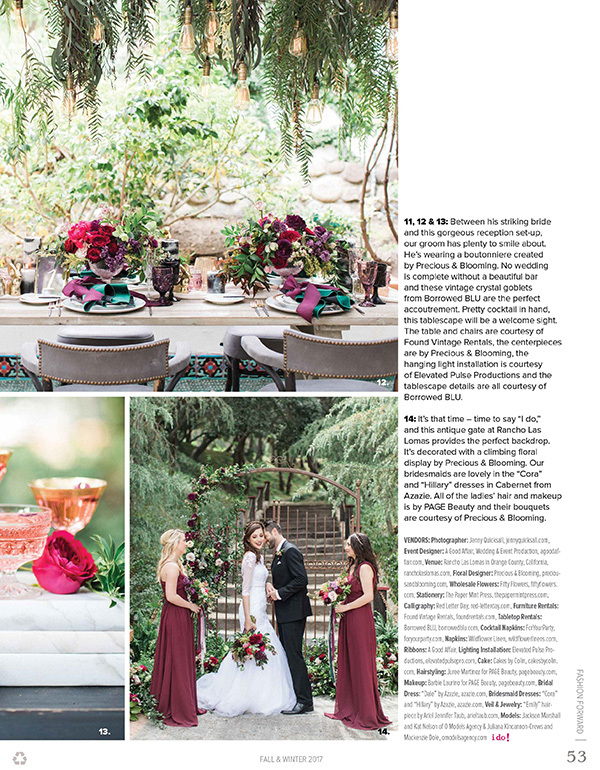 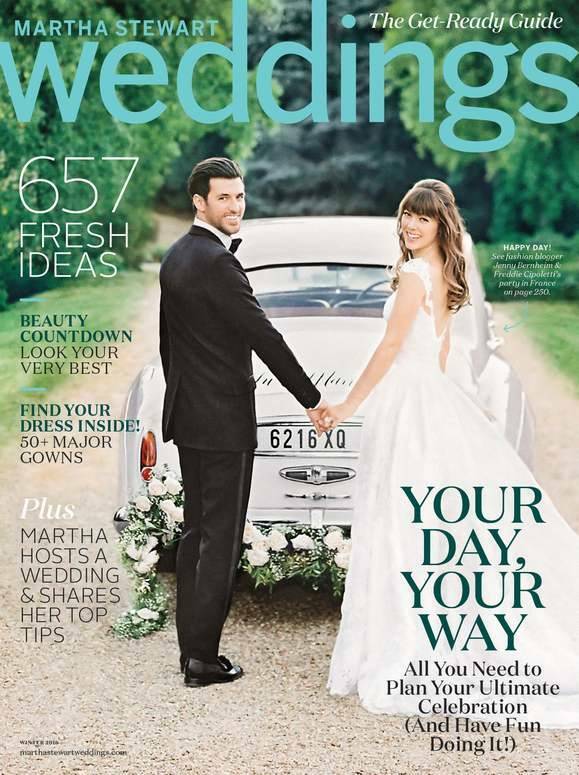 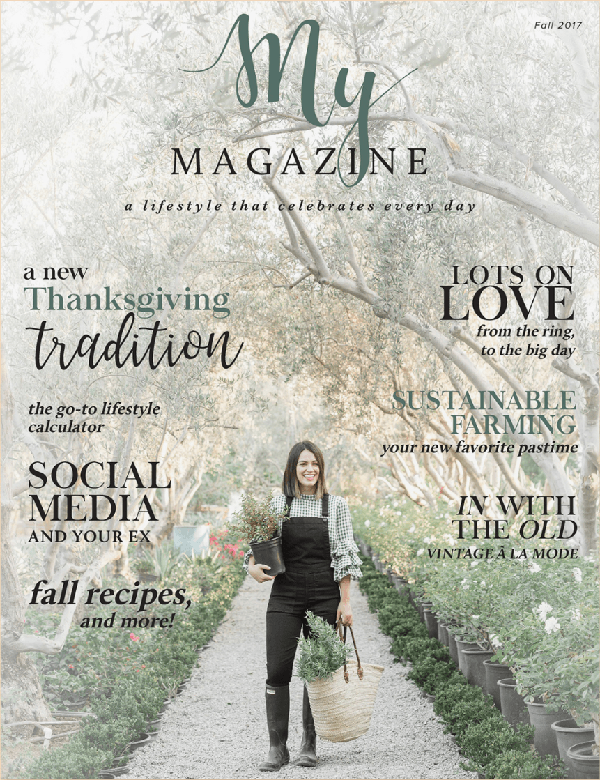 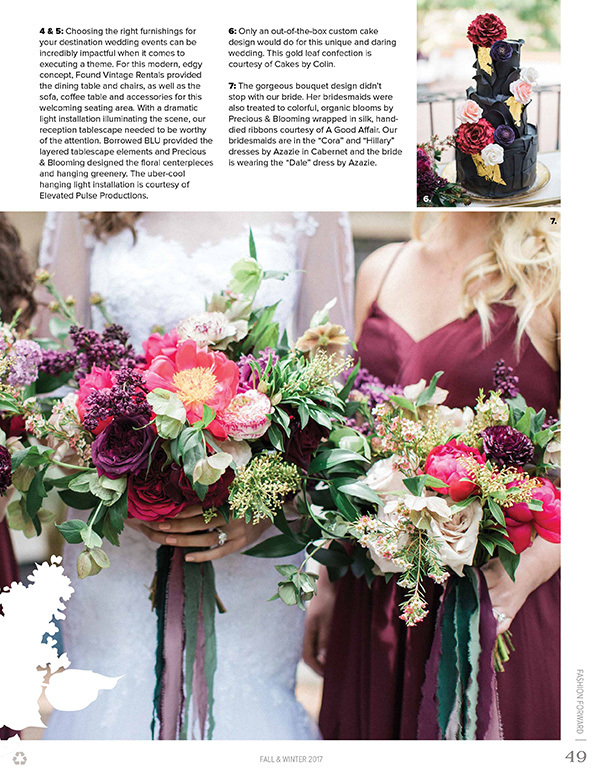 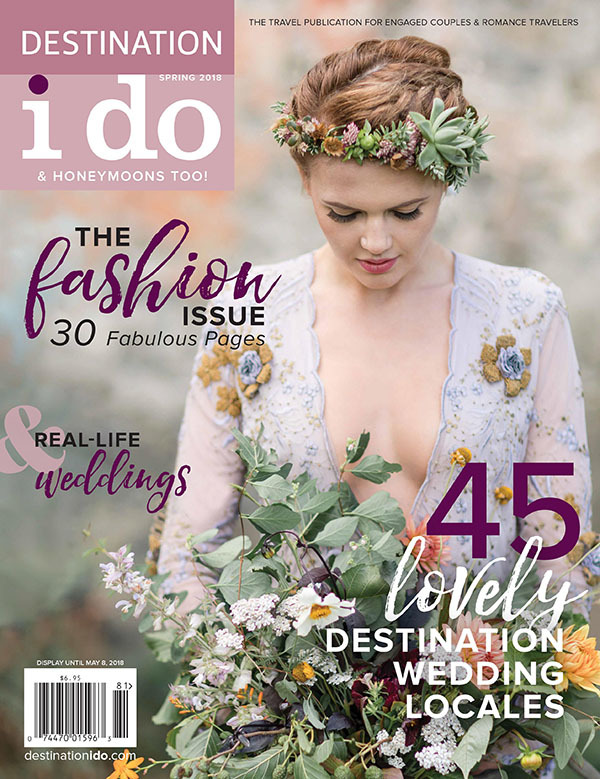 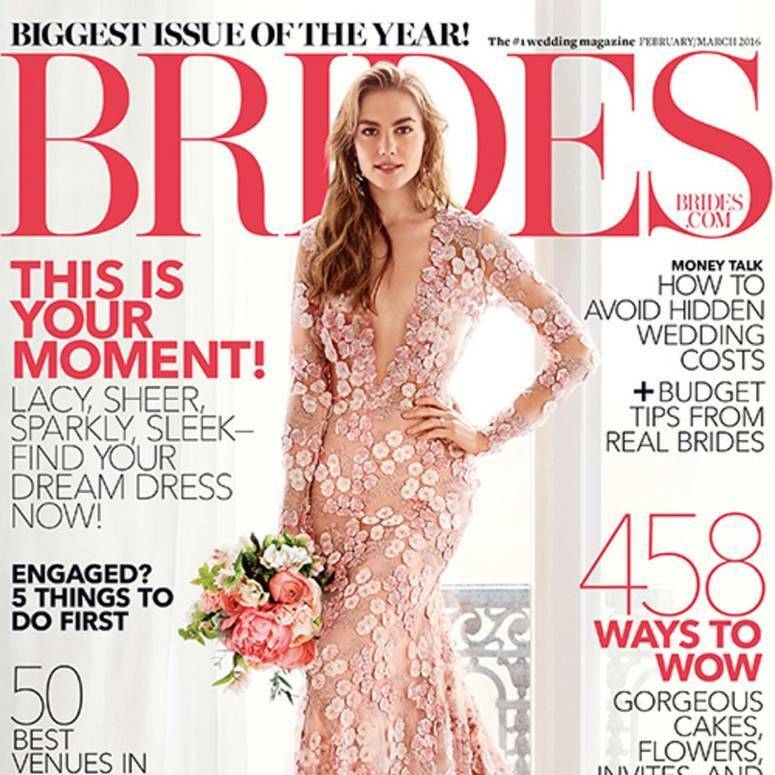 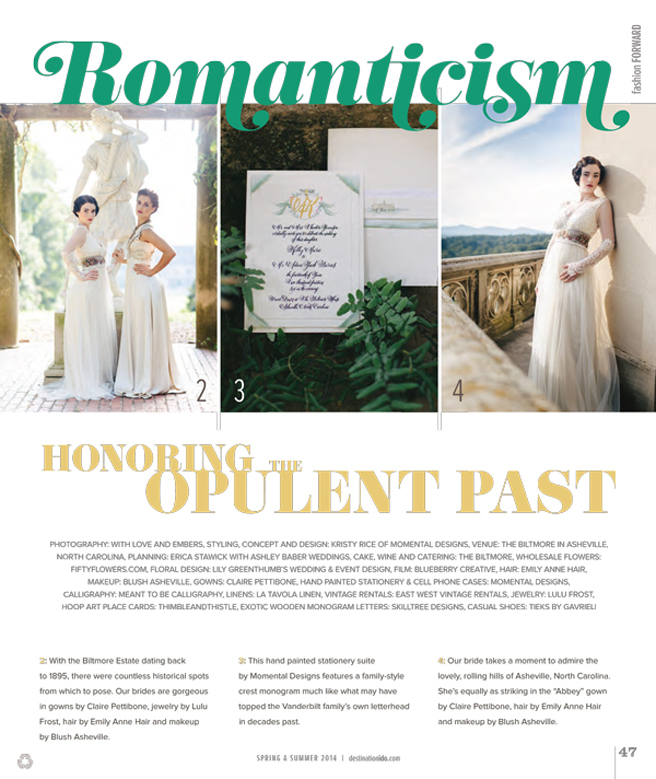 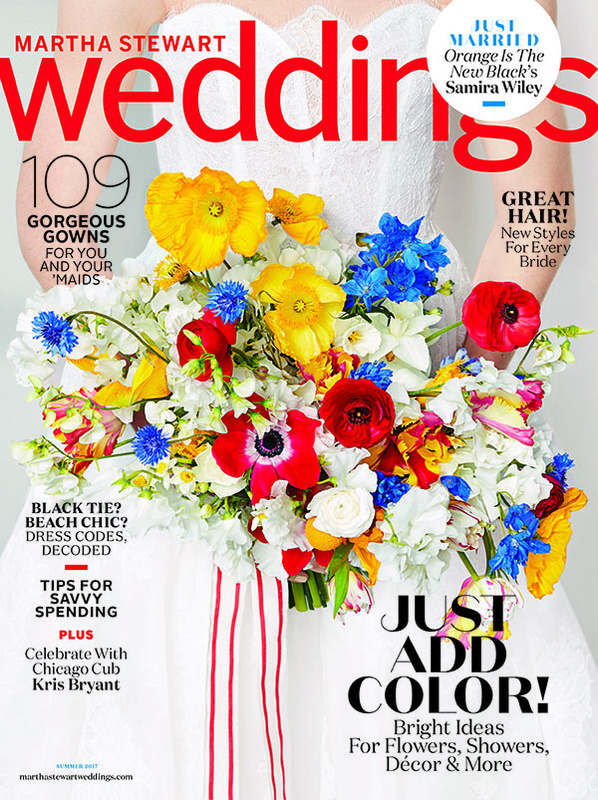 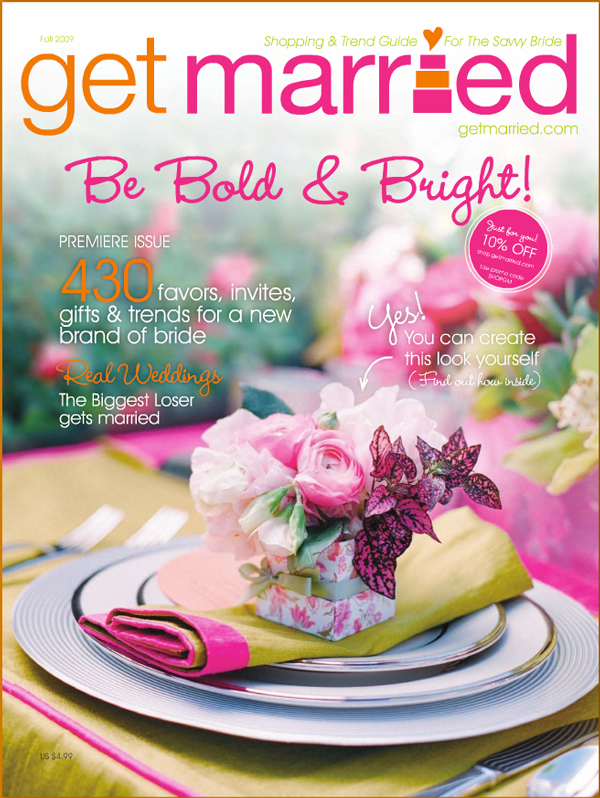 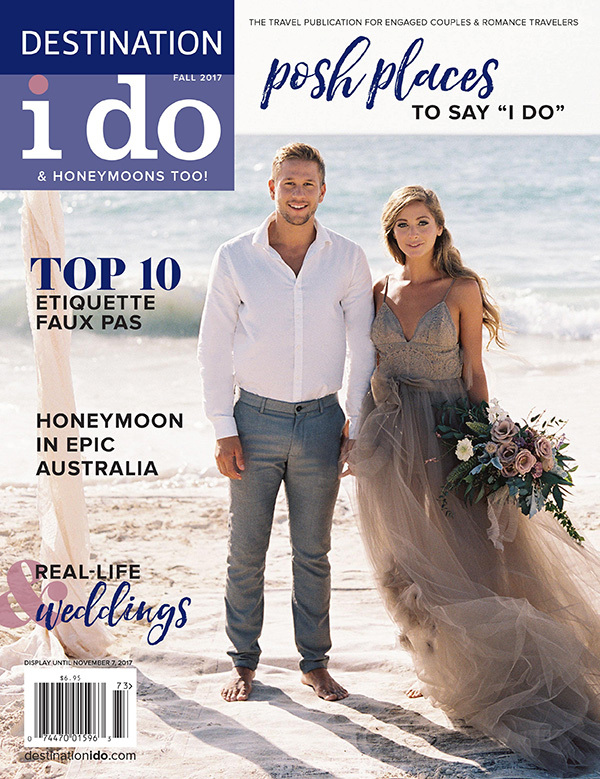 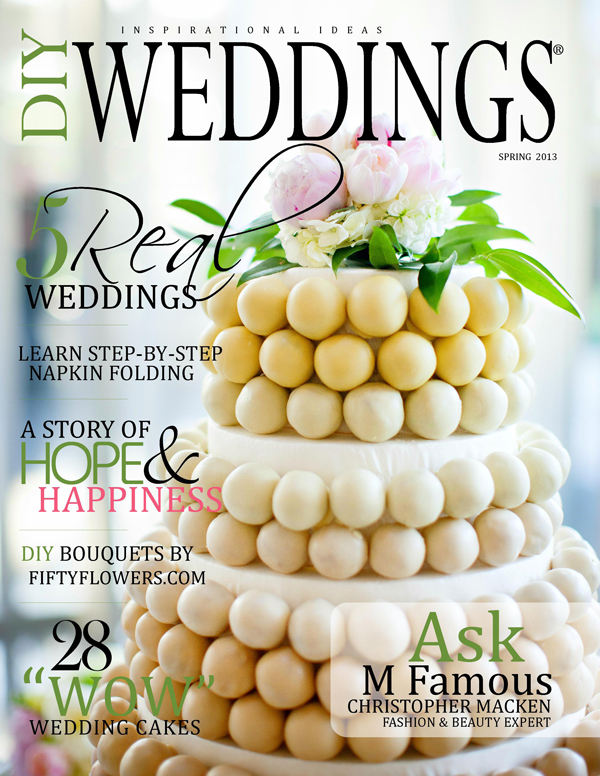 This issue features 3 DIY Wedding Bouquets by FiftyFlowers, plus an interview with Liza Roeser Atwood, the CEO of FiftyFlowers, entitled, "5 Ways to Let Flowers Inspire Your Wedding Colors." 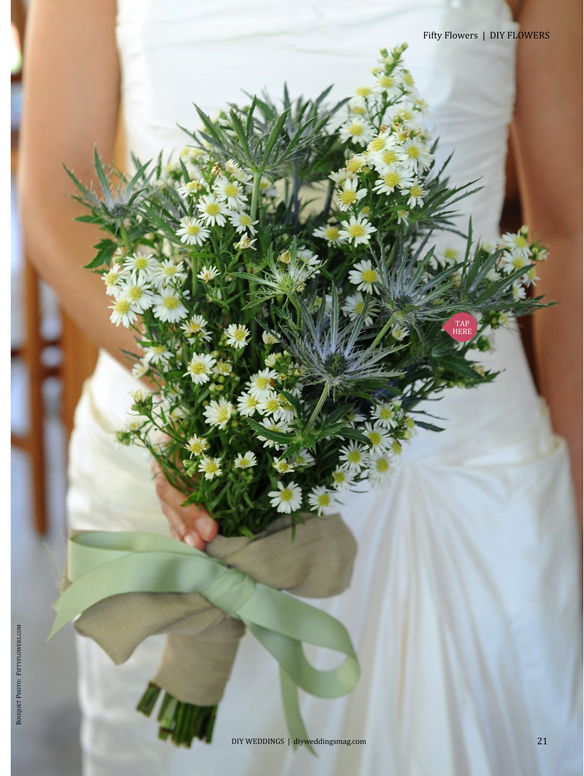 "Star of Bethlehem bouquet – Like they were just picked from a fresh green garden!" 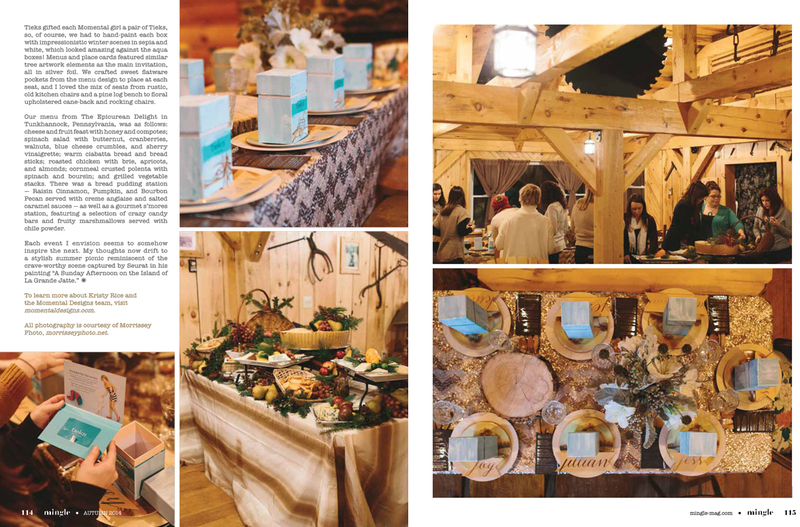 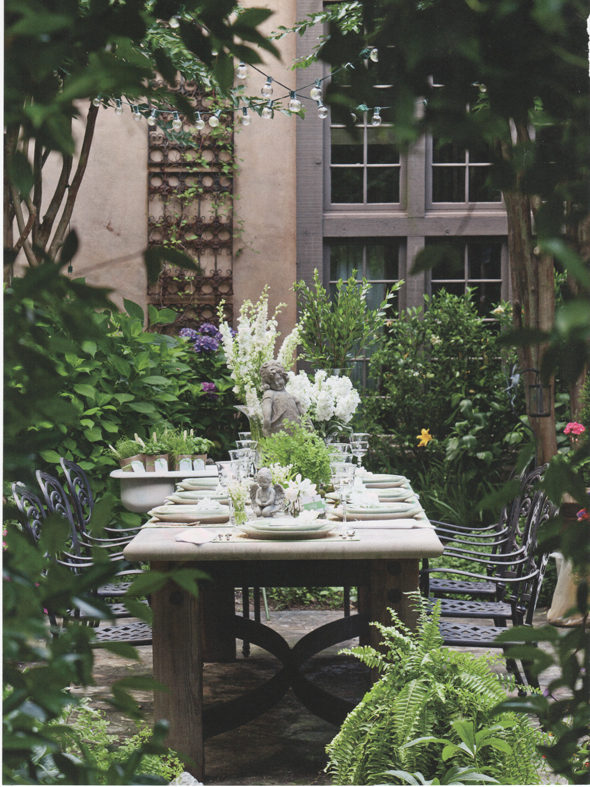 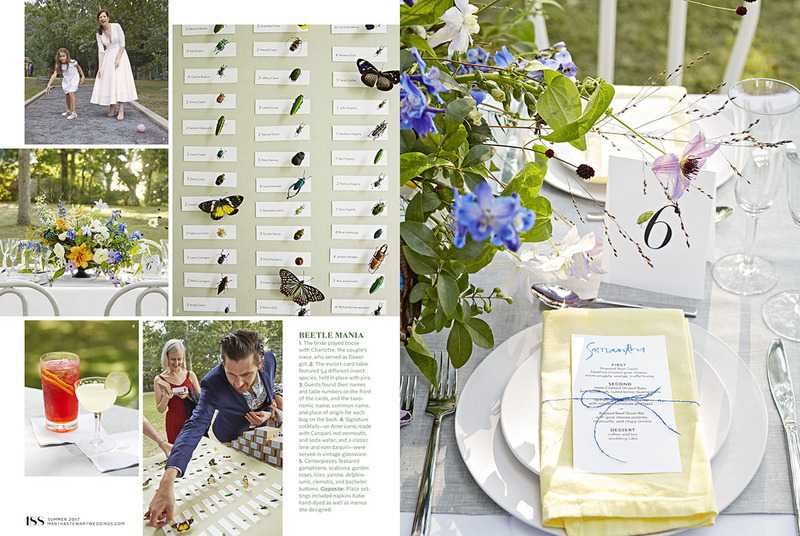 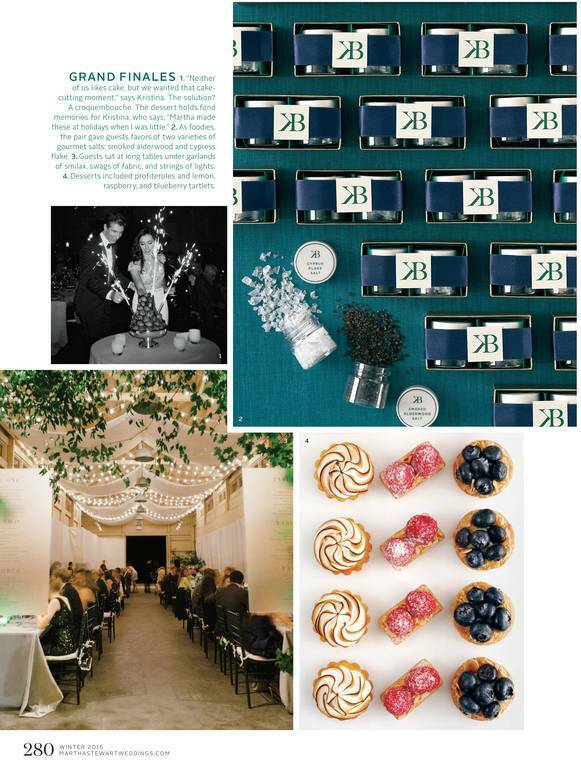 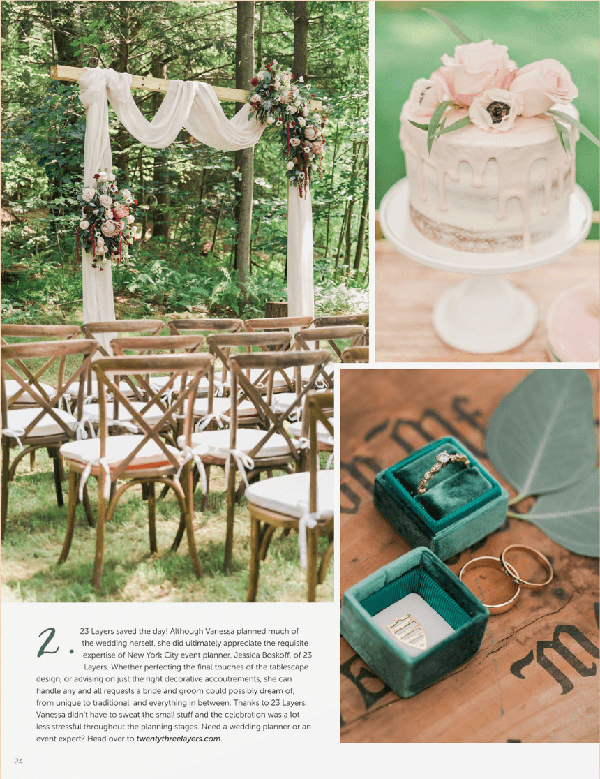 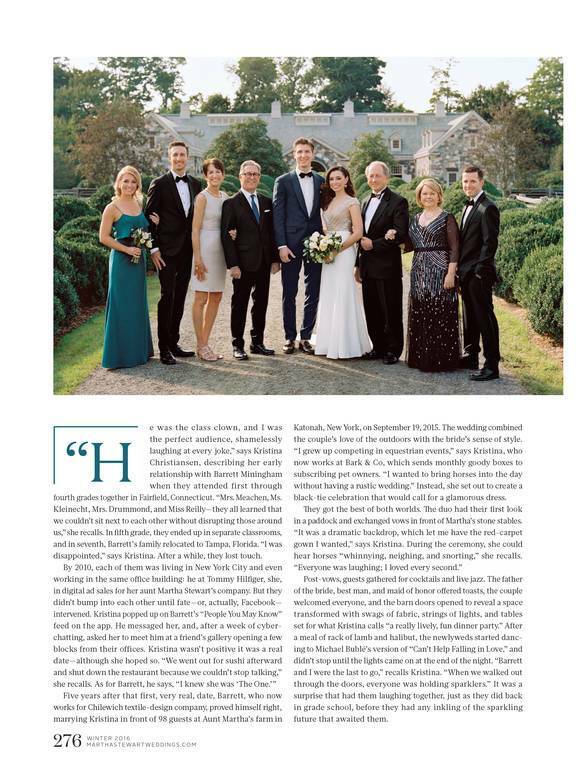 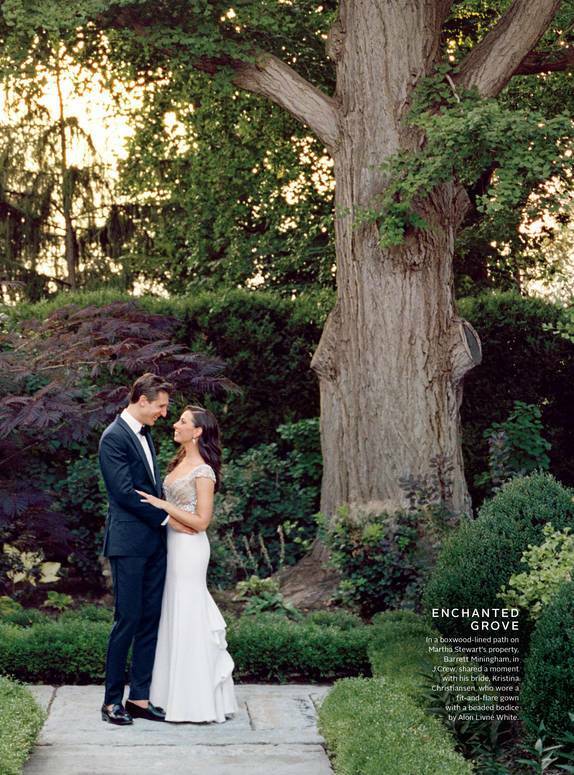 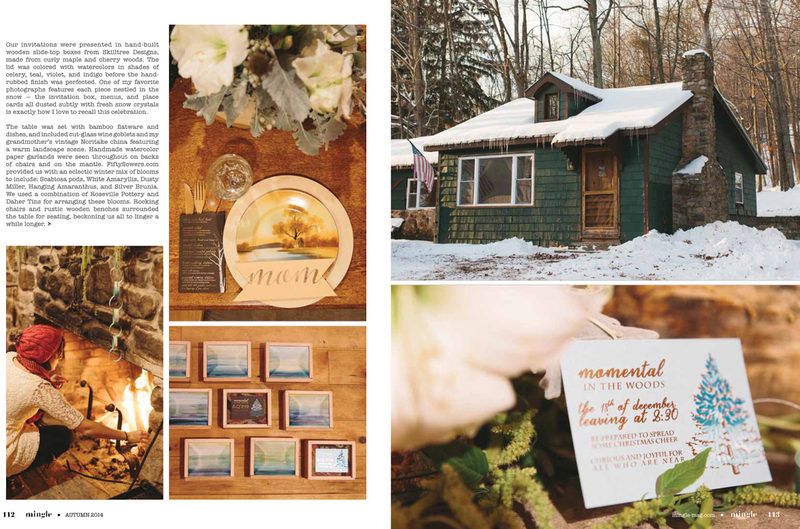 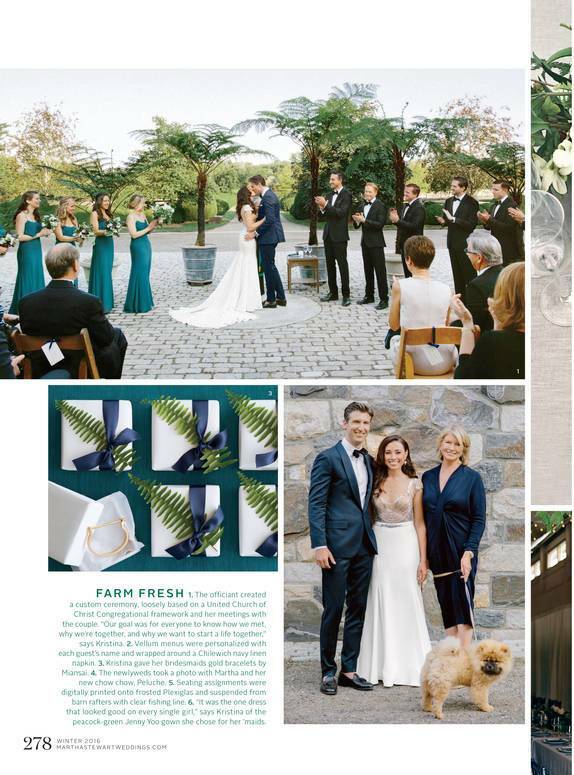 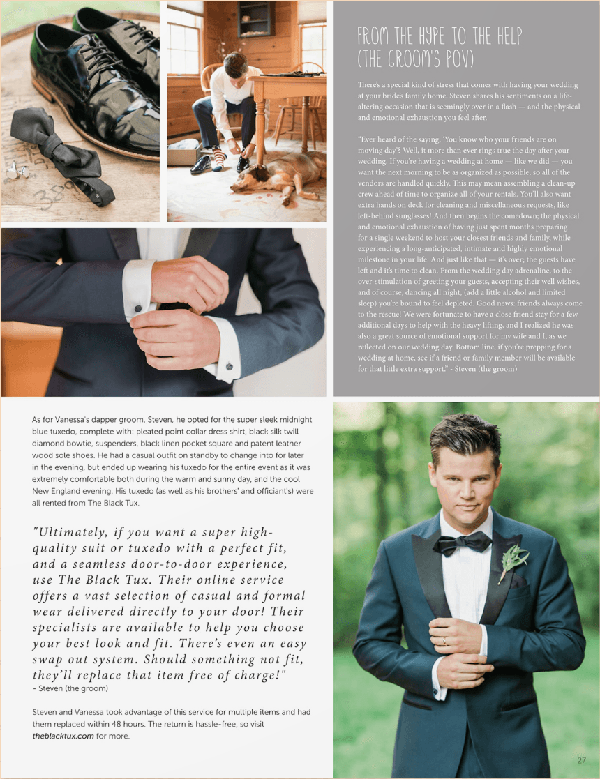 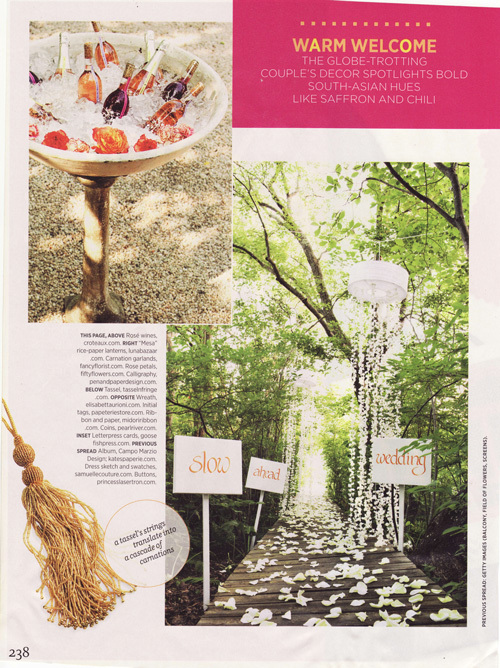 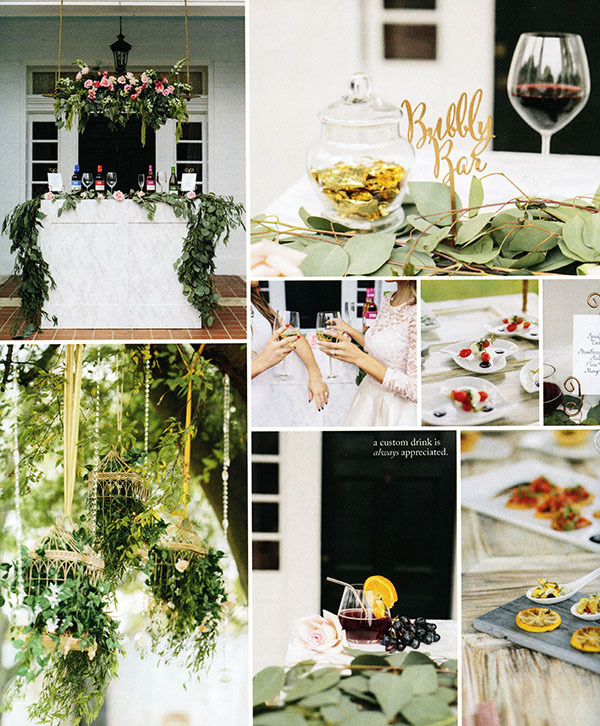 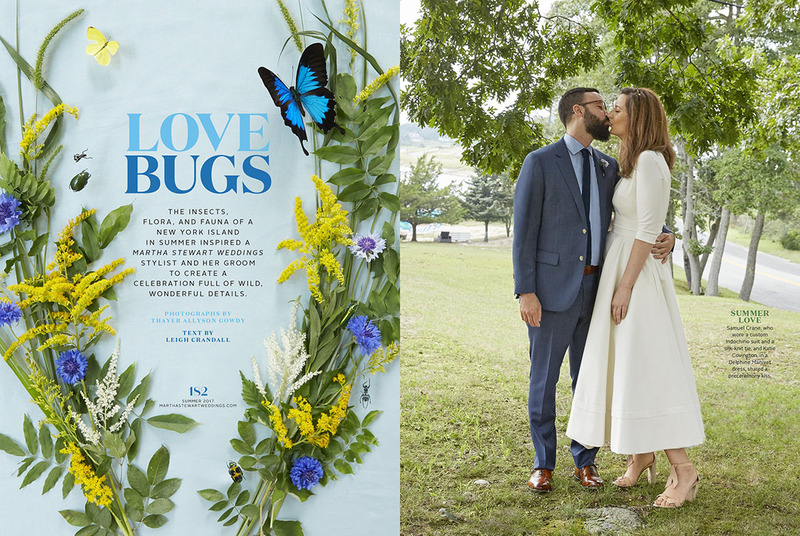 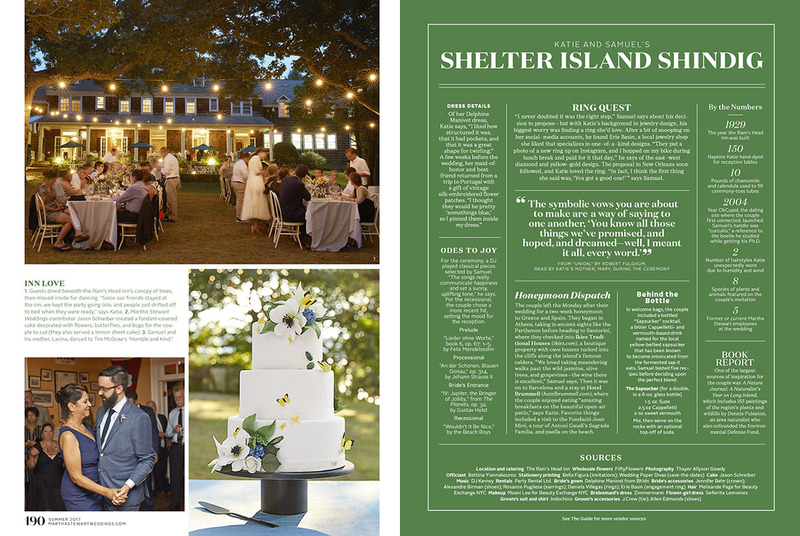 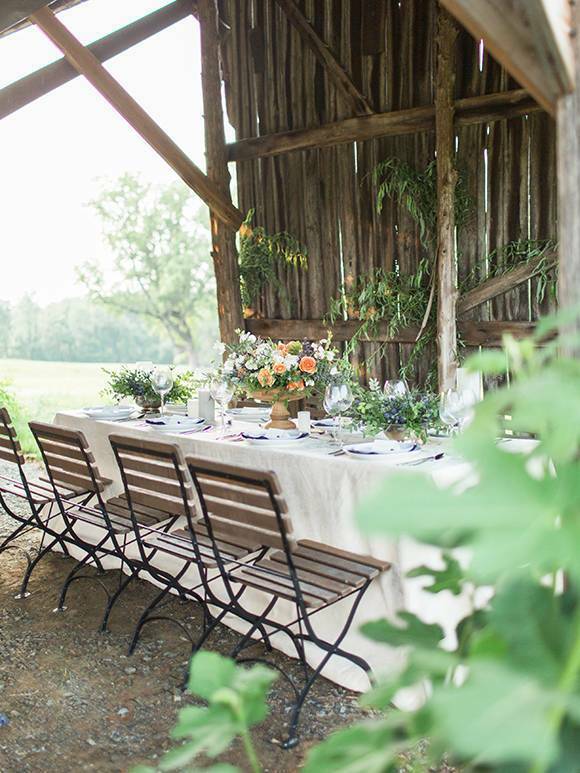 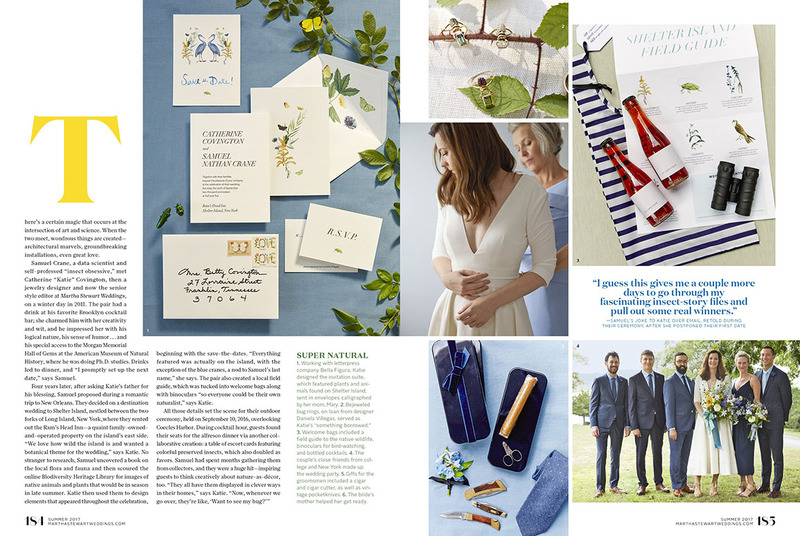 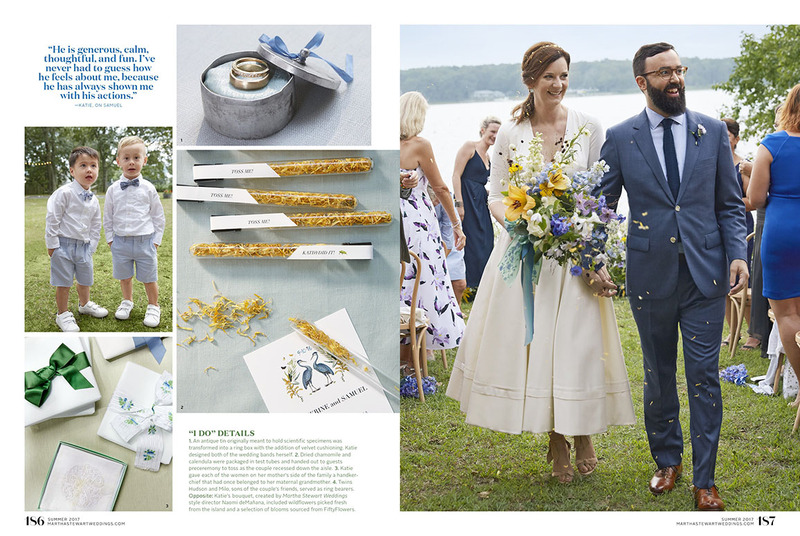 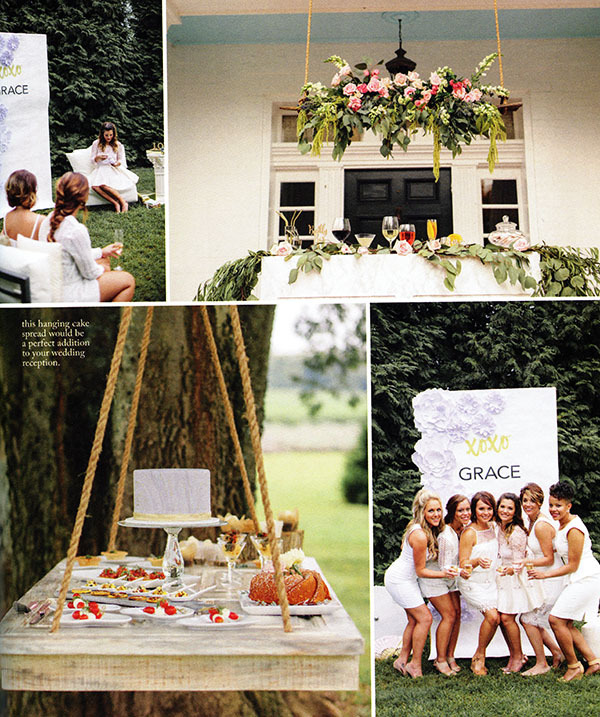 "The insects, flora and fauna of New York Island in the summer inspired a Martha Stewart Weddings Stylist and her groom to create a celebration full of wild, wonderful details." 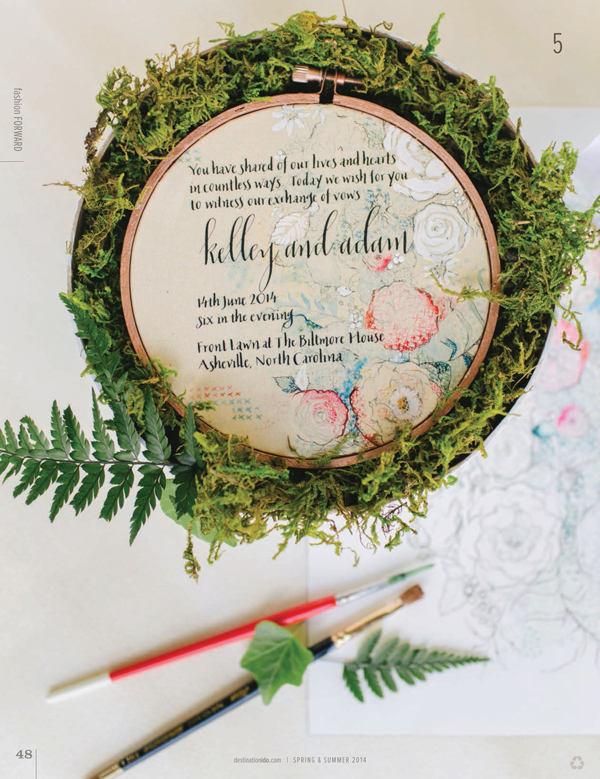 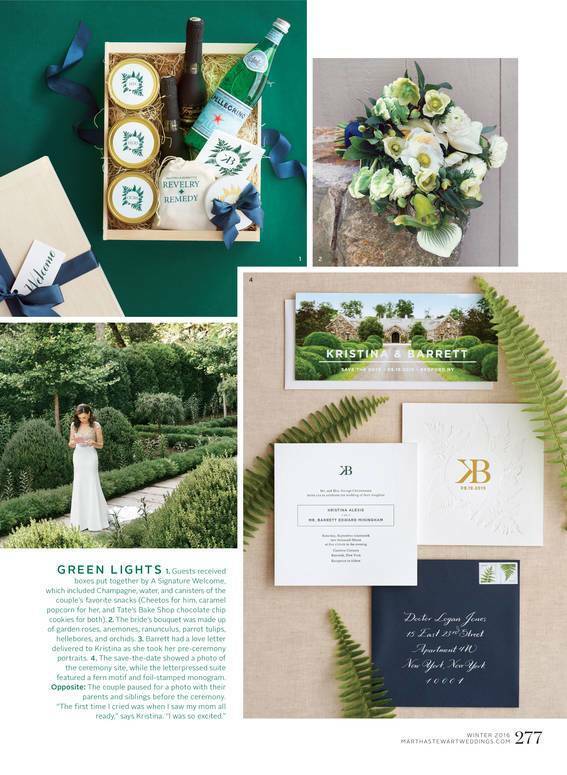 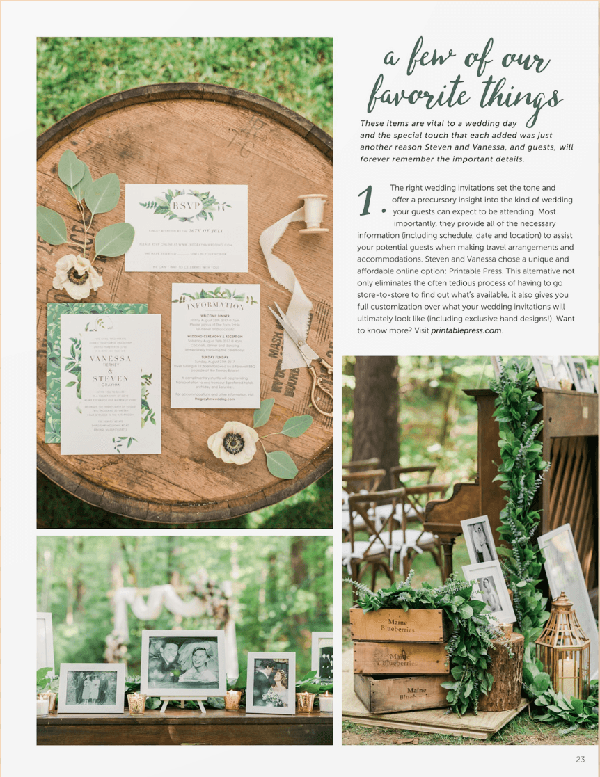 Pantone named “Greenery” as the 2017 Color of the Year, and since then Brides have been incorporating actual greenery into their style and theme. 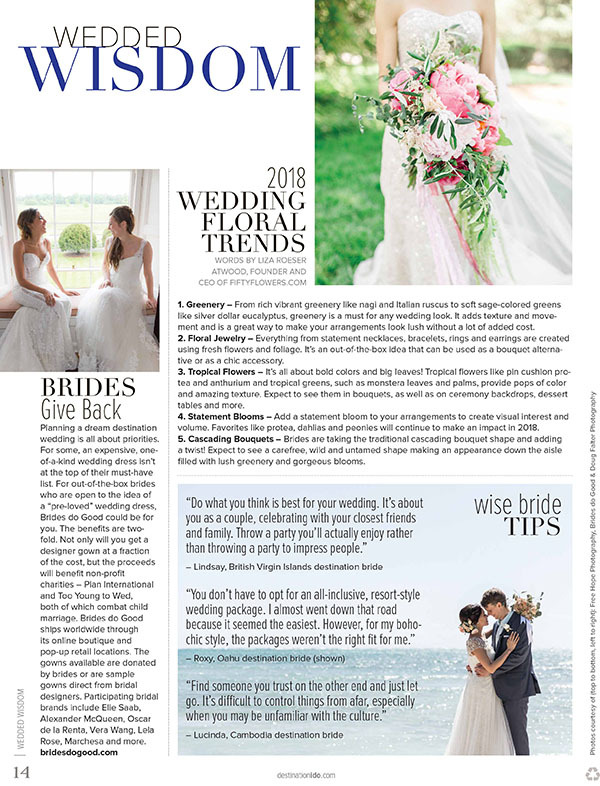 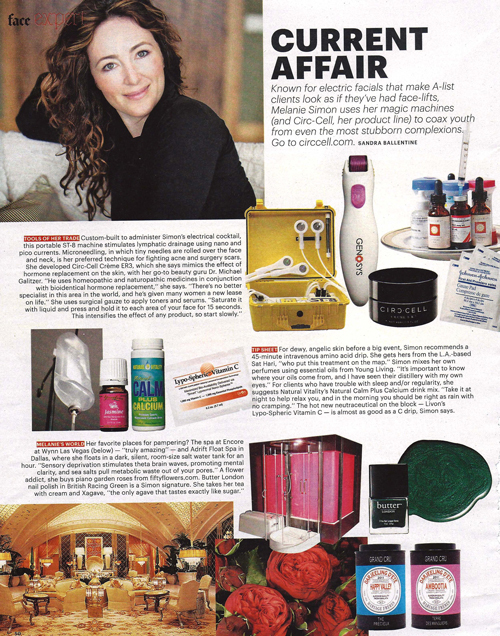 See what our CEO has to say about this trend! 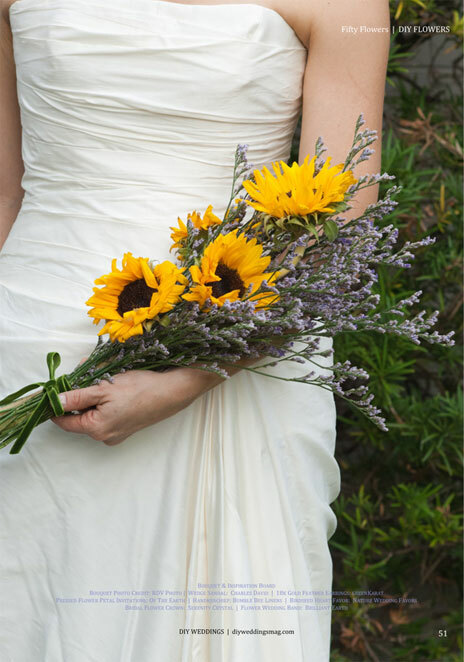 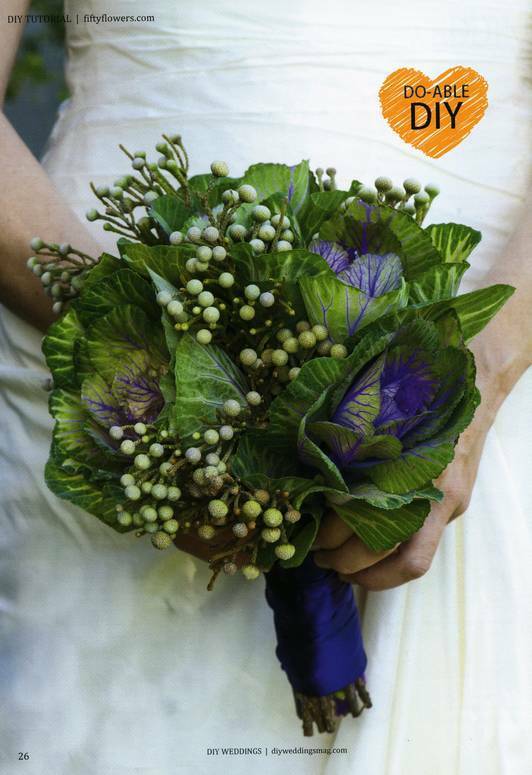 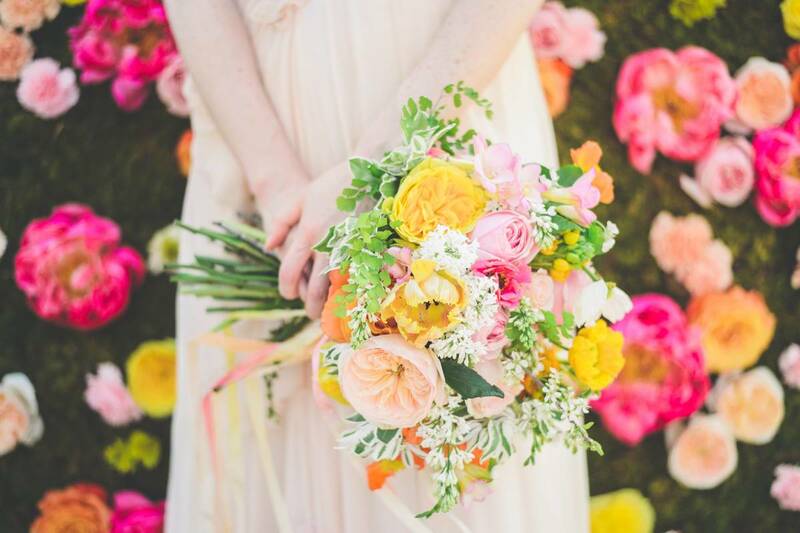 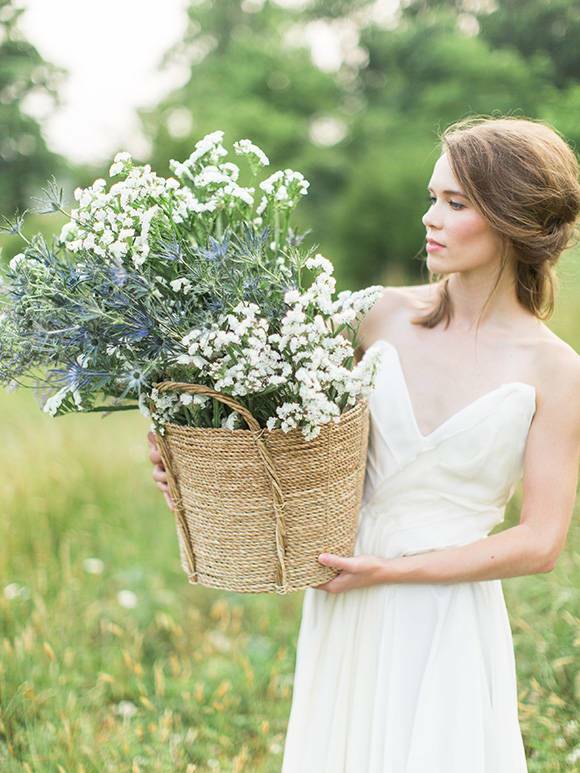 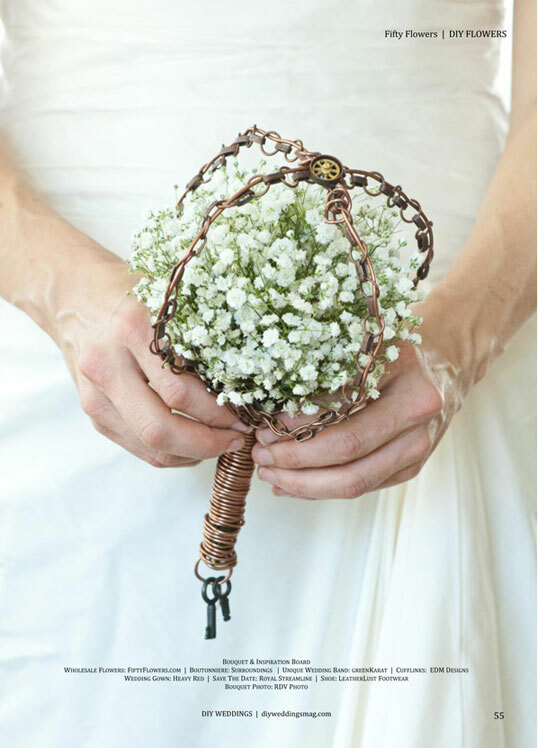 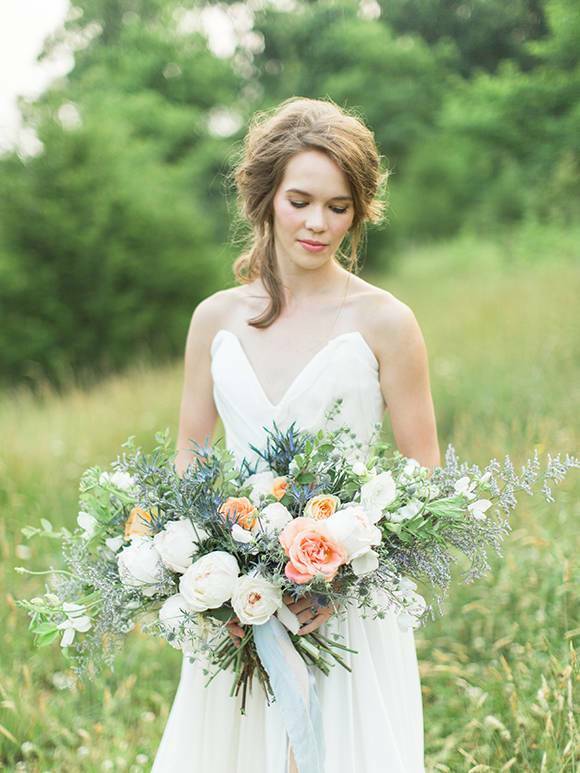 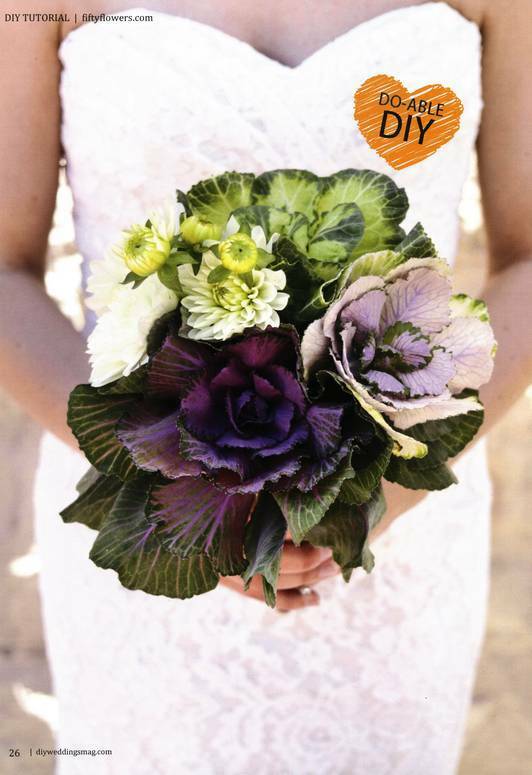 DIY Weddings features three DIY bouquets that are earthy, vibrant and full of texture! 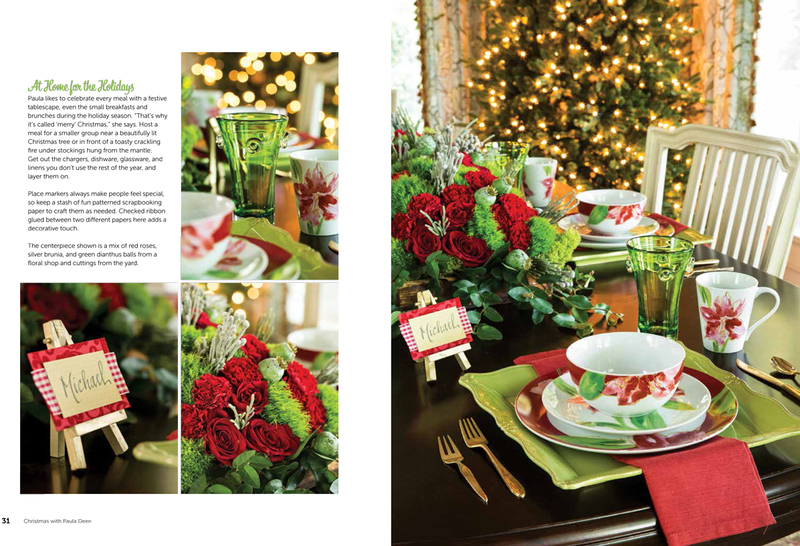 "Set a table outside adorned with beautiful blooms that capture nature's glory. 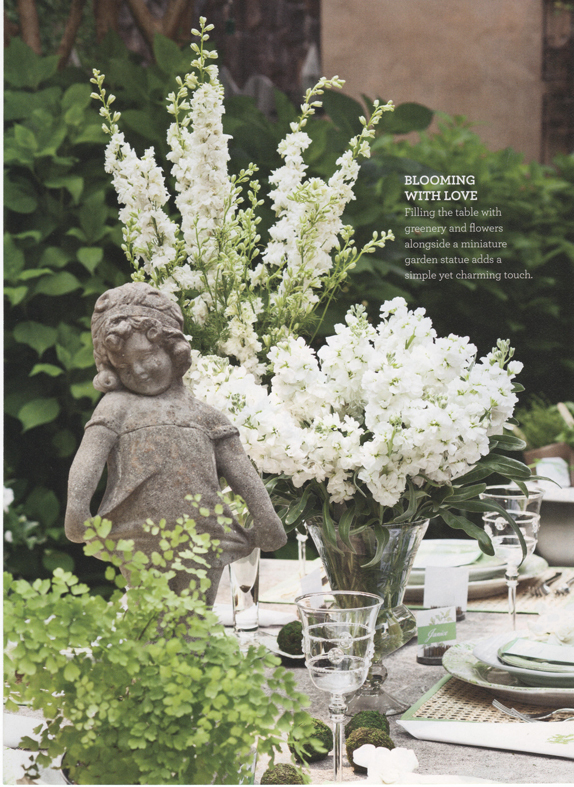 Gardenias, lily of the valley, and stock are stunning against greenery that fills a spring garden. 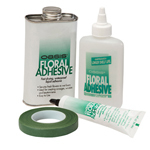 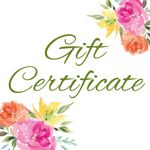 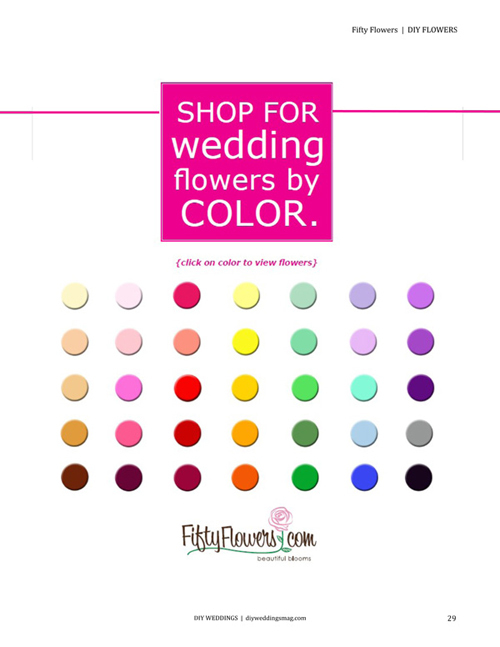 Florists like FiftyFlowers.com are great places to purchase lovely blossoms." 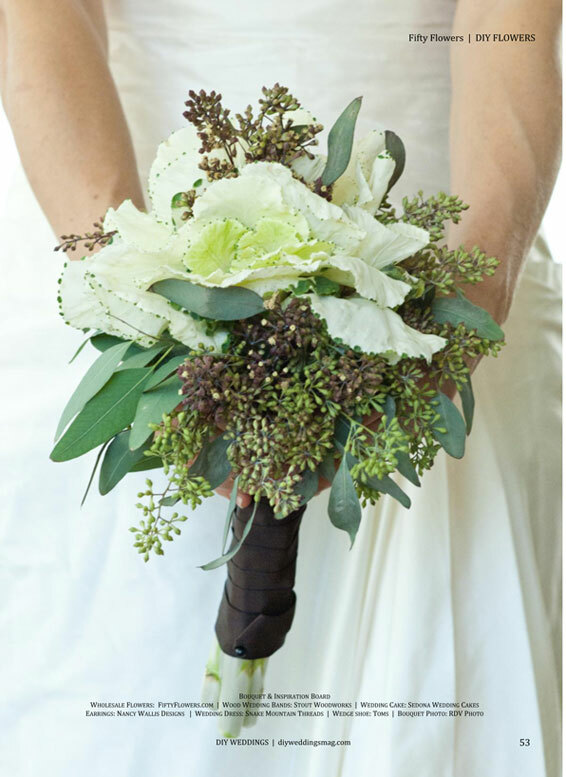 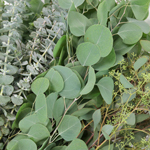 "FiftyFlowers.com provided us with an eclectic winter mix of blooms to include: Scabiosa pods, White Amaryllis, Dusty Miller, Hanging Amaranthus, and Silver Brunia." 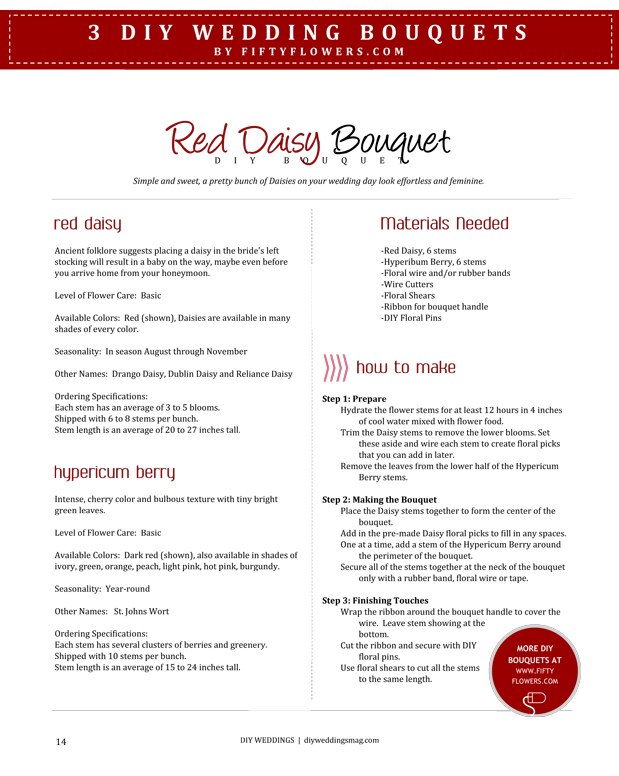 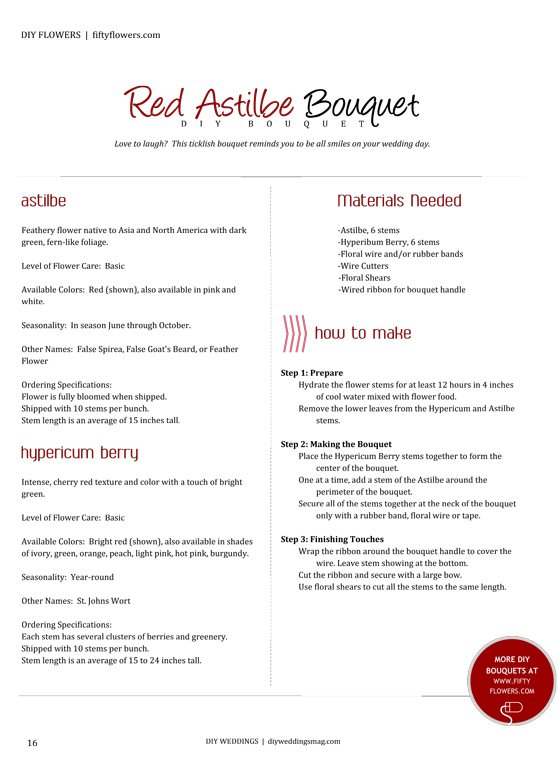 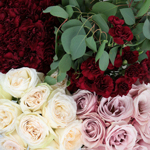 Winter reds take over with 3 DIY bouquets by FiftyFlowers. 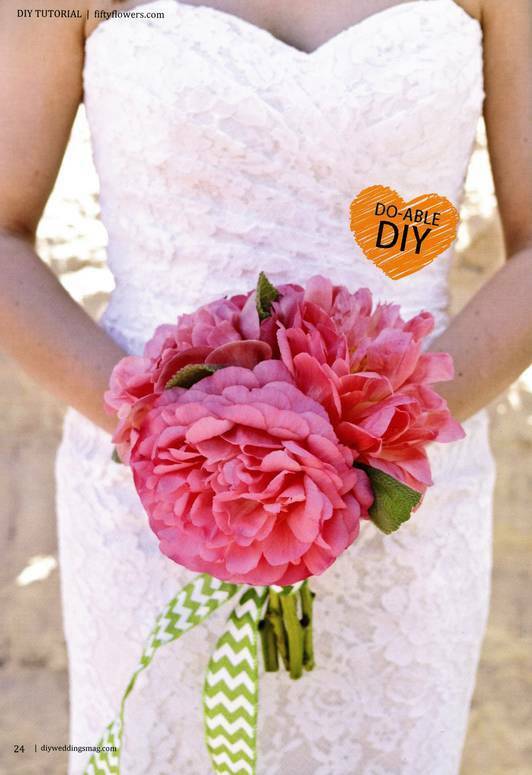 Peonies, Freesia and Hydrangeas… 3 DIY bouquets perfect for Summer! 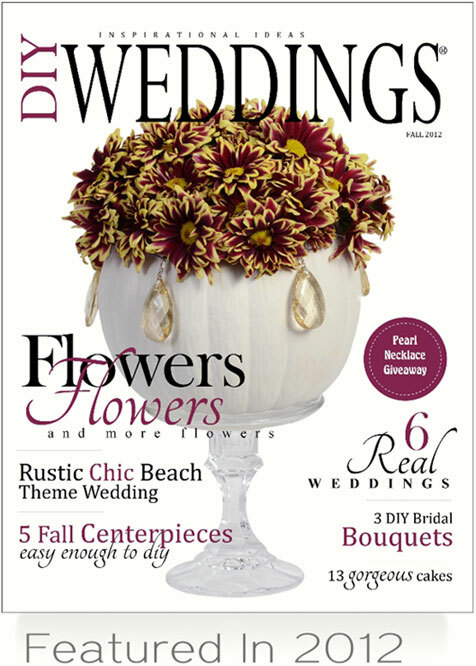 Fabulous Fall Wedding Flowers from FiftyFlowers.com. 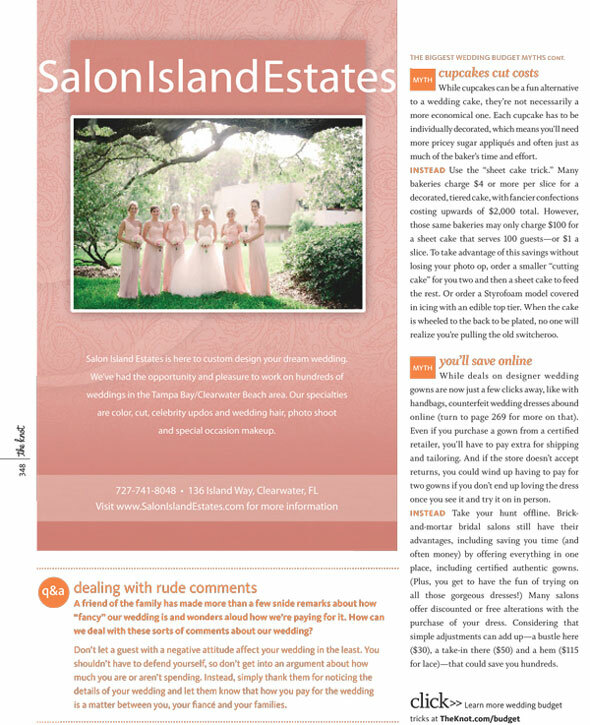 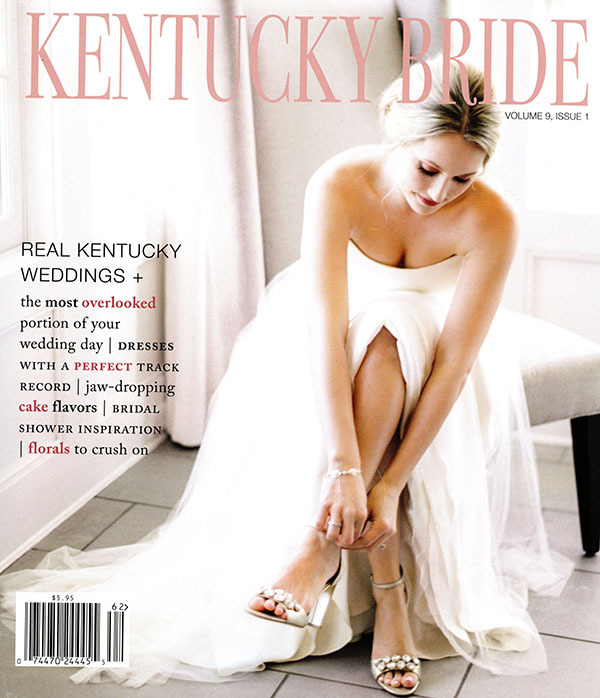 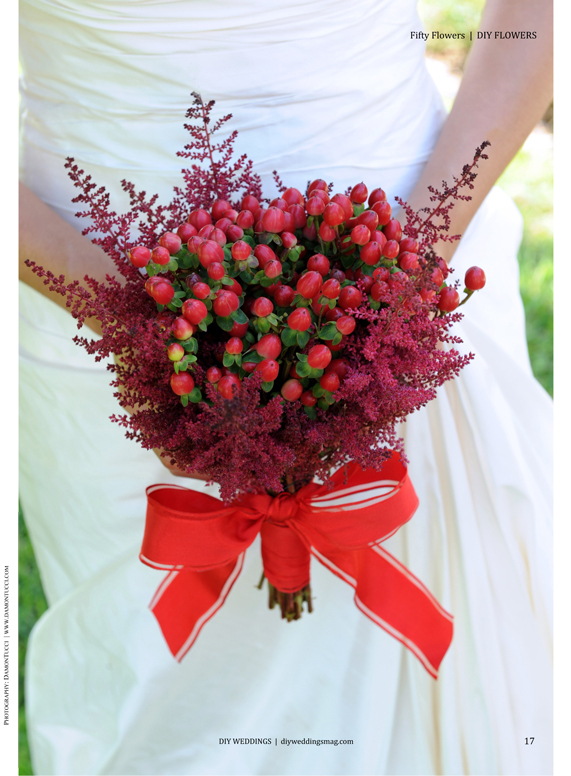 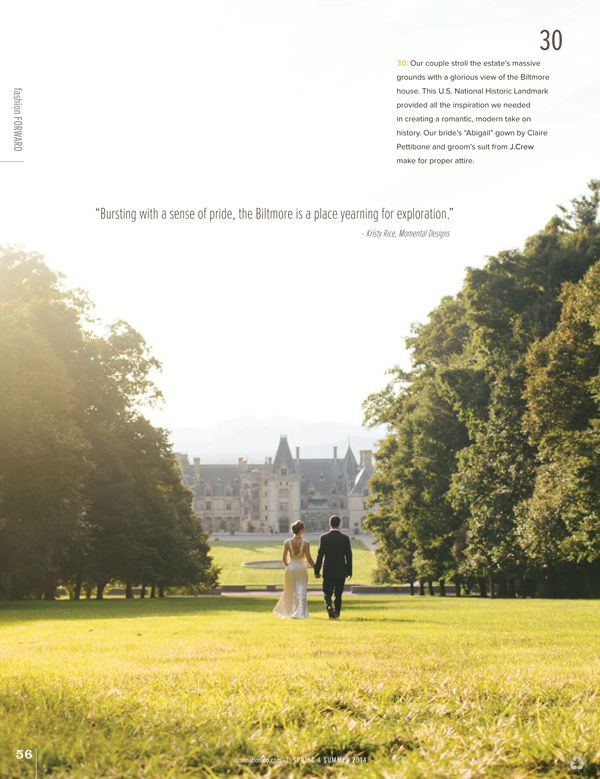 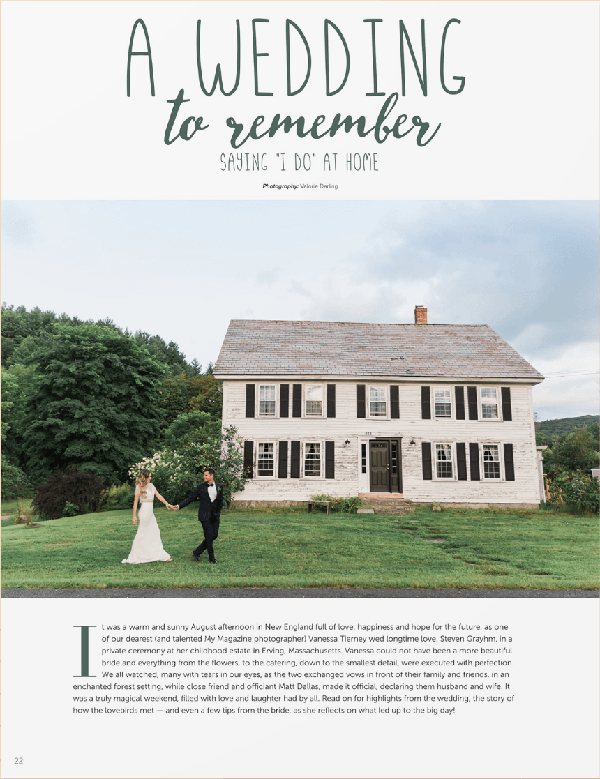 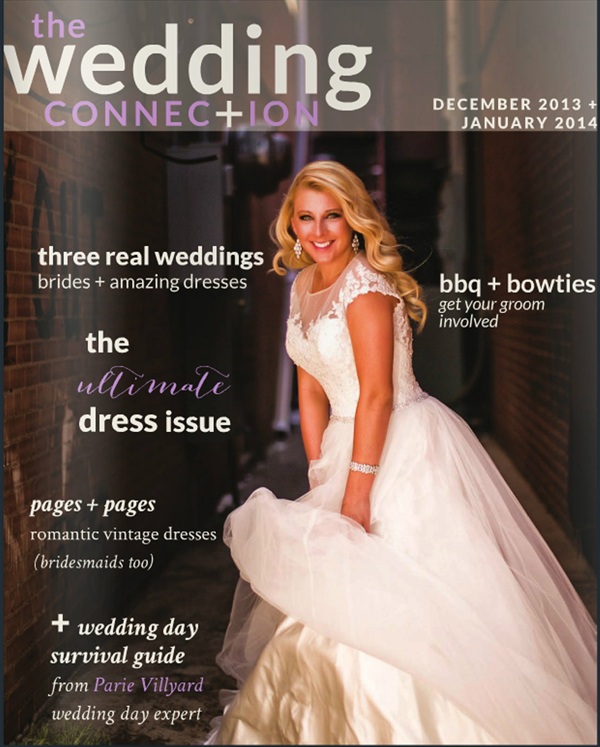 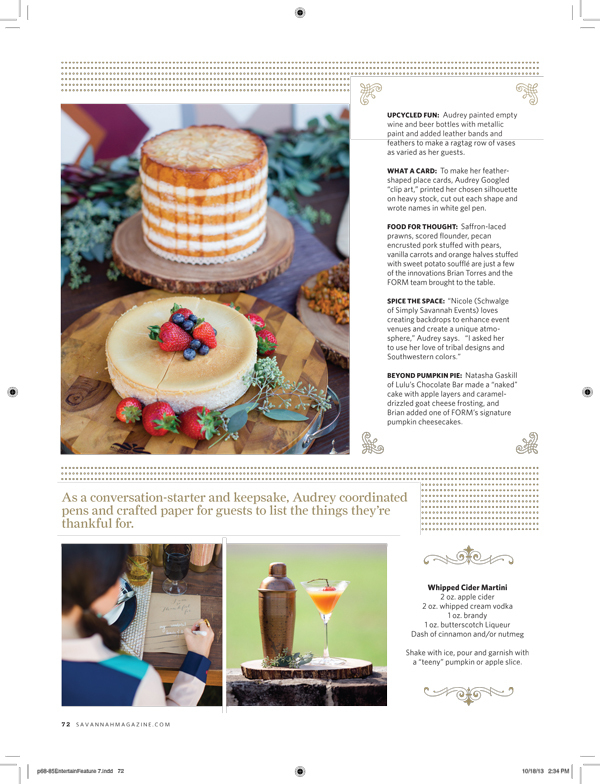 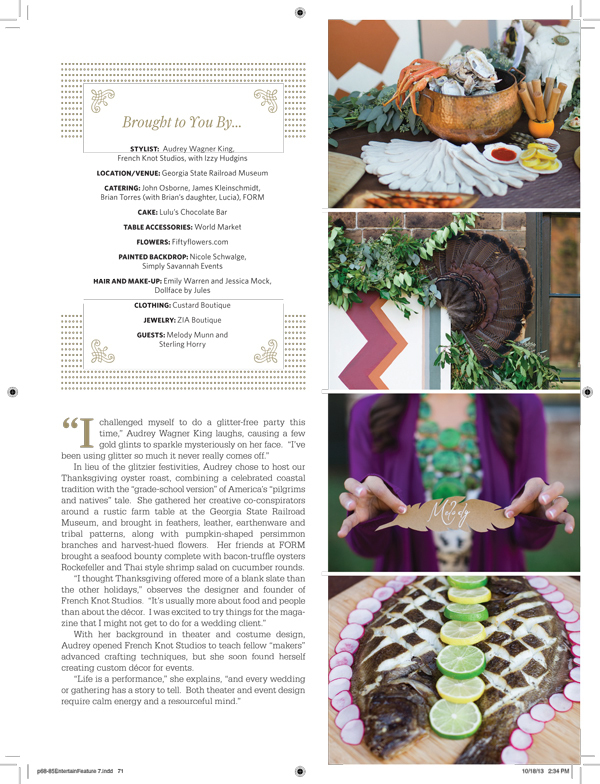 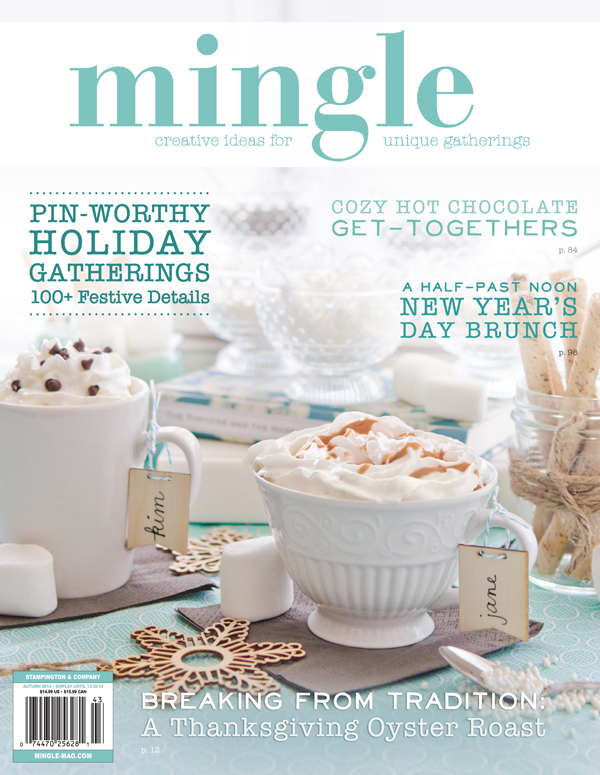 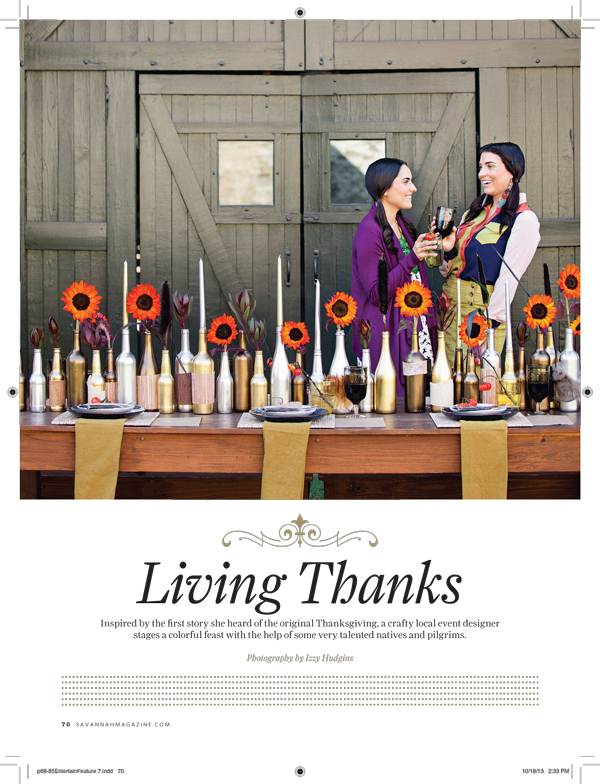 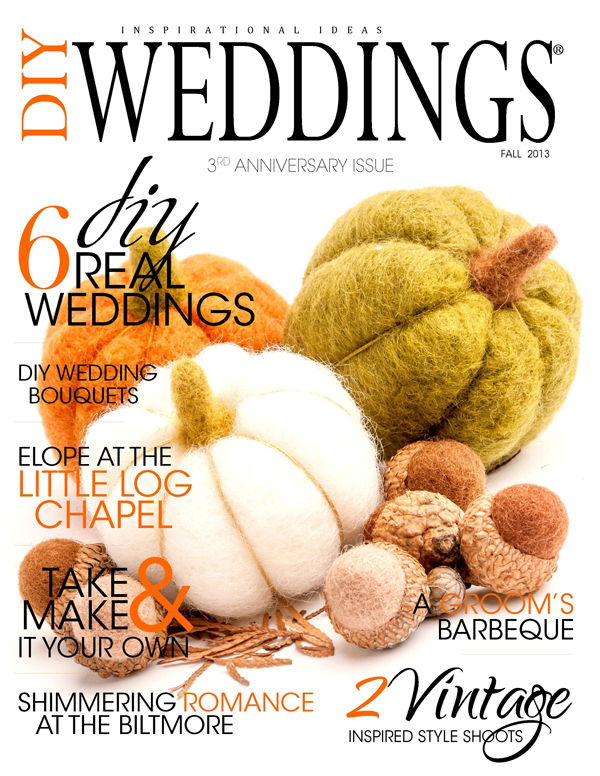 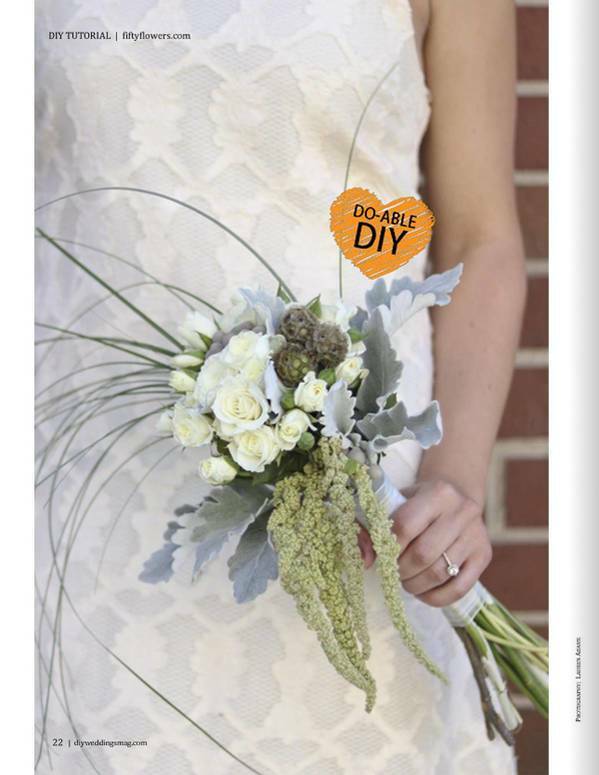 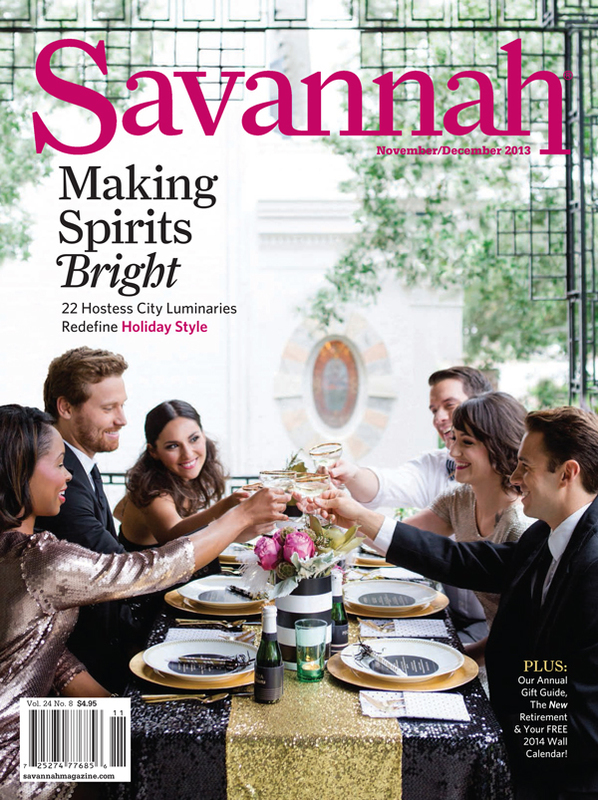 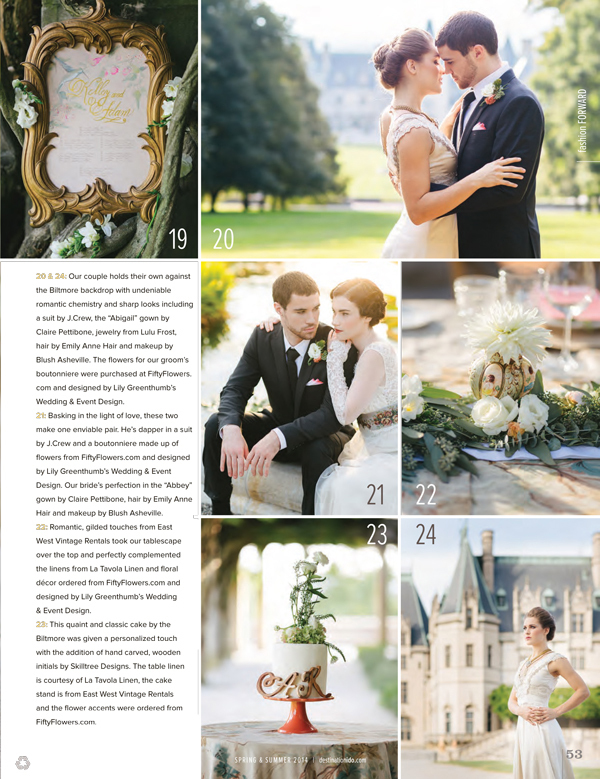 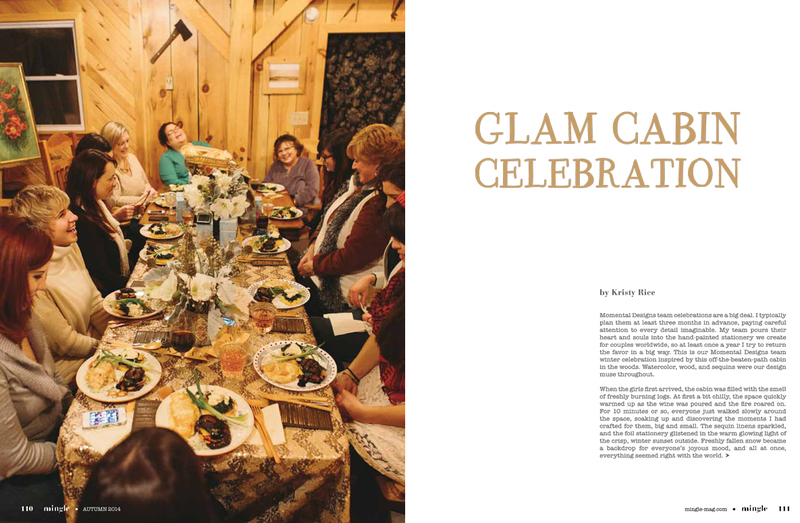 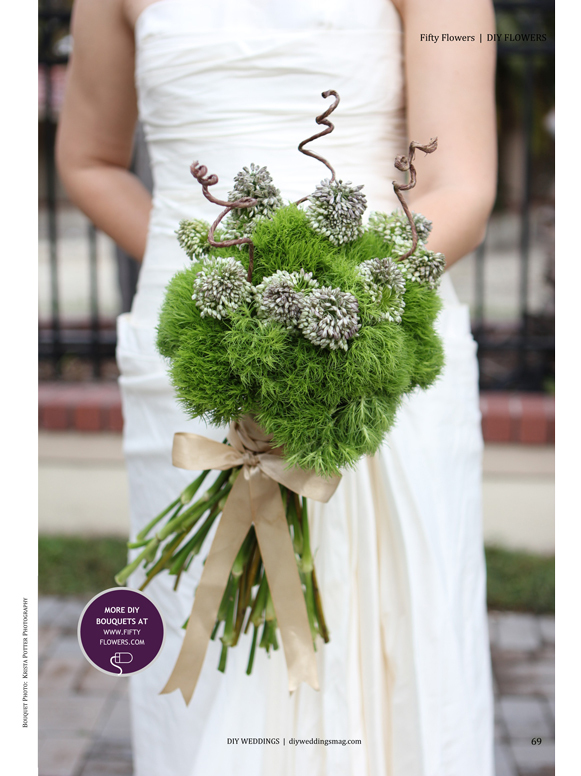 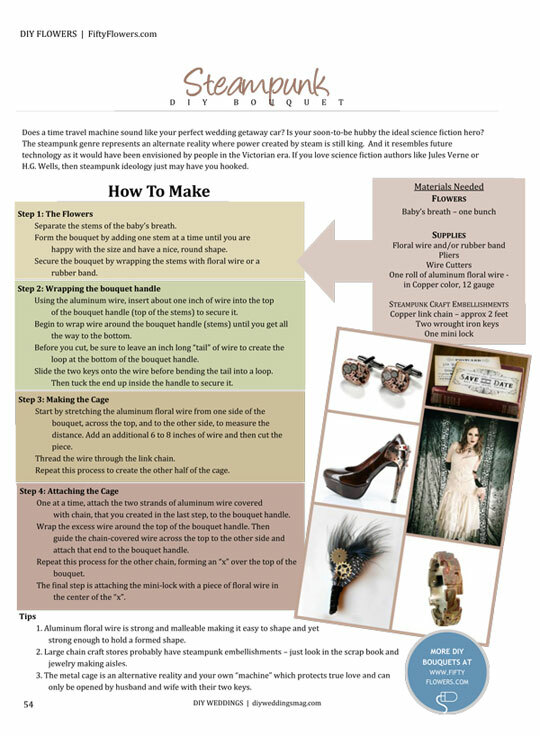 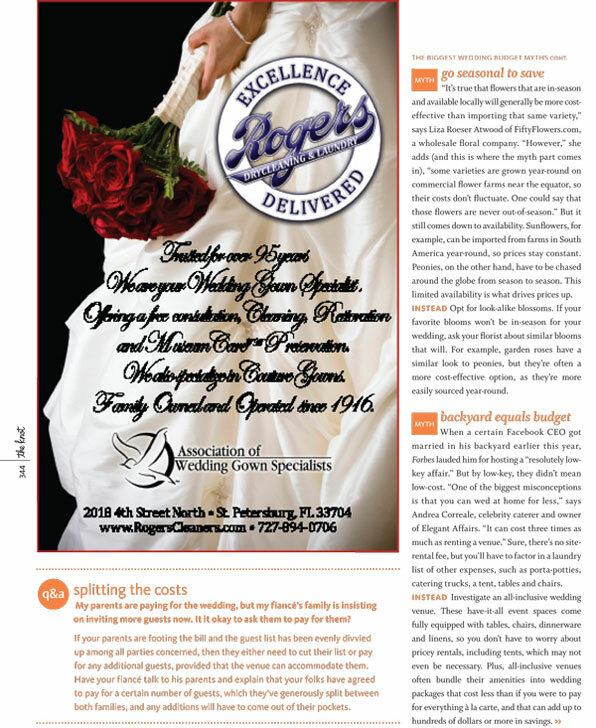 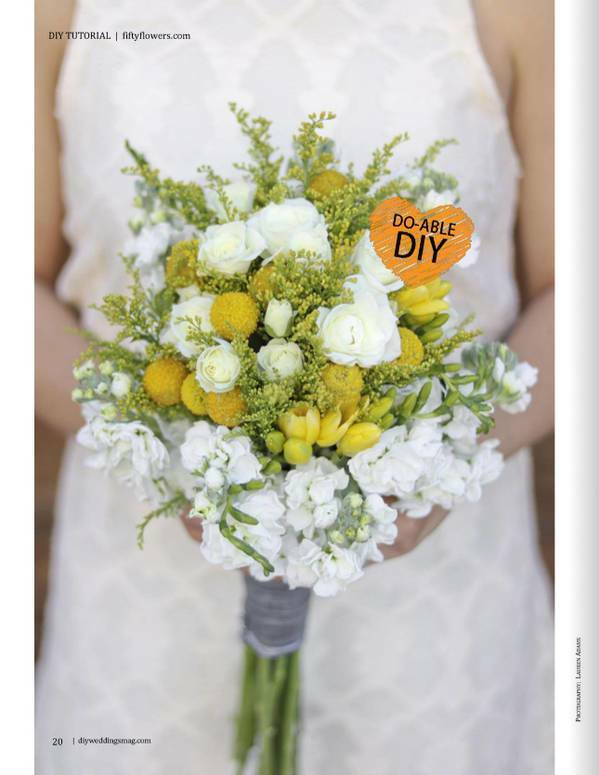 This Fall issue features 3 DIY Wedding Bouquets by FiftyFlowers.com and a wonderful Real DIY Wedding Story! 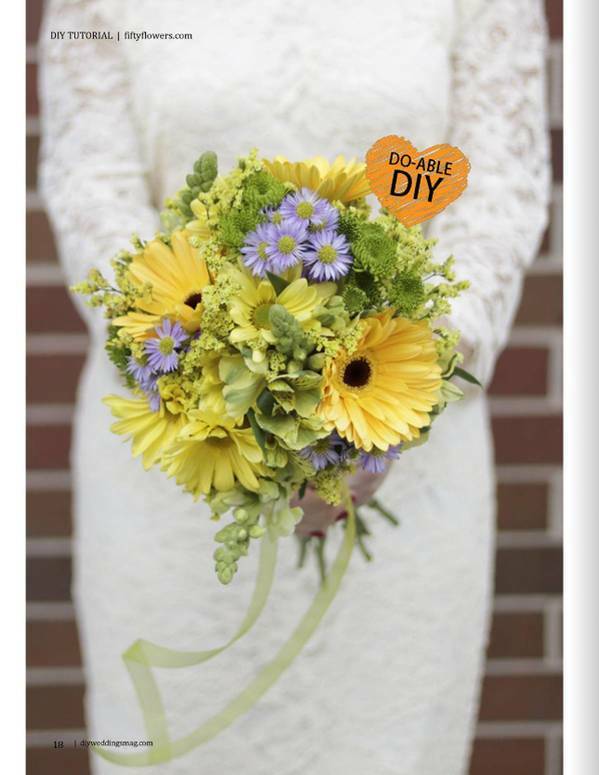 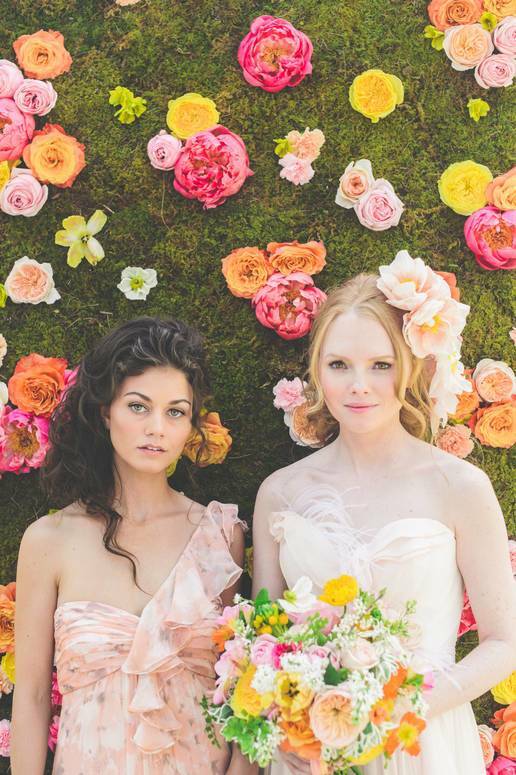 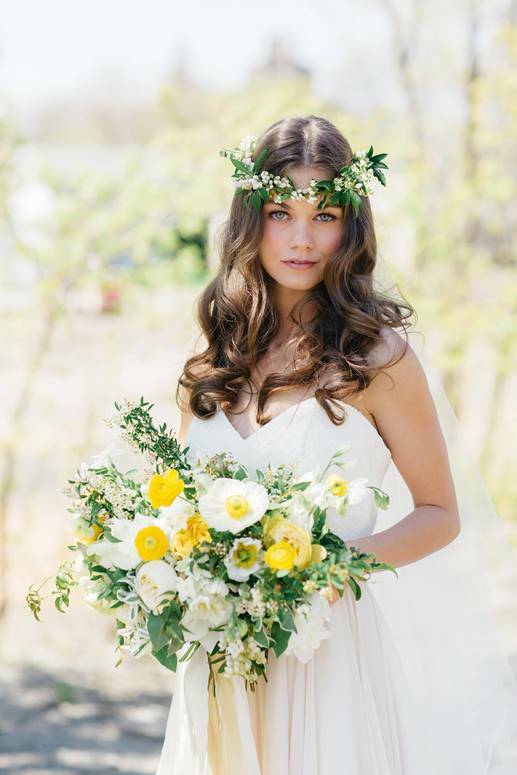 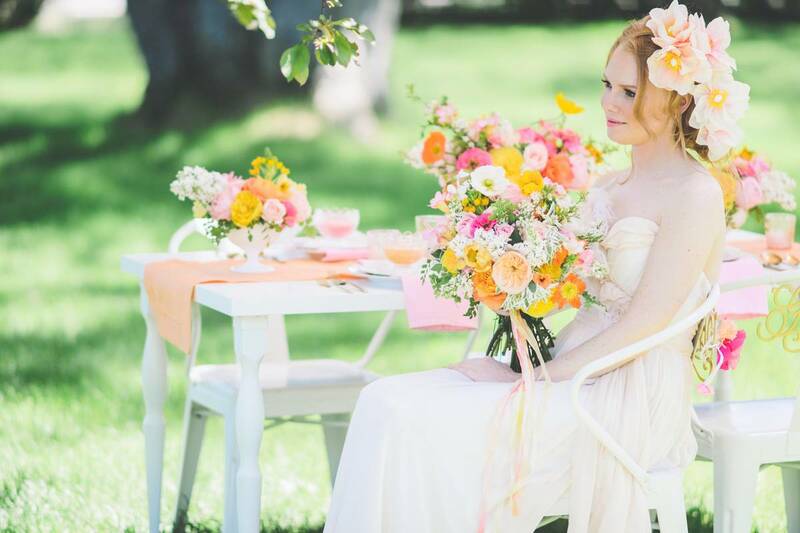 See how a DIY Bride made her flower dreams a reality in this DIY story. 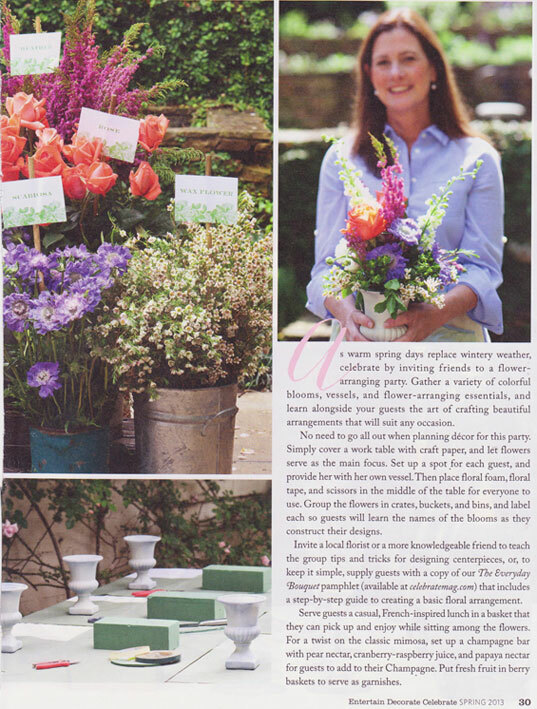 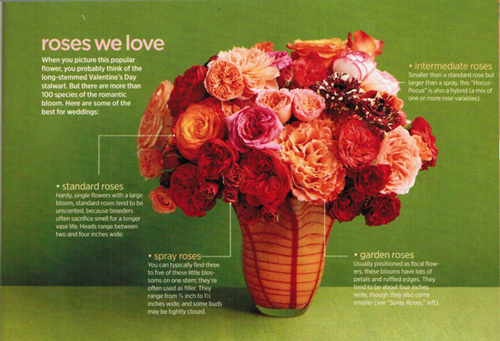 Melanie's World, "A flower addict, she buys piano garden roses from FiftyFlowers.com." 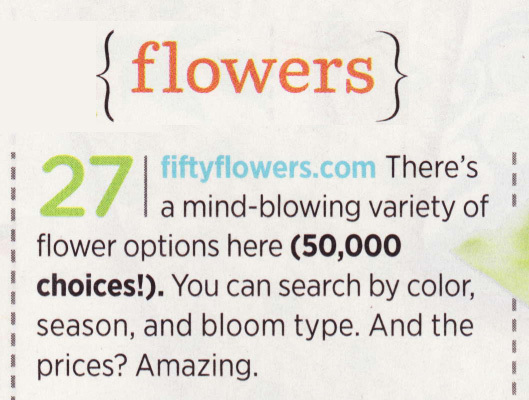 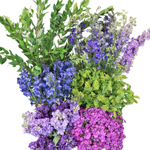 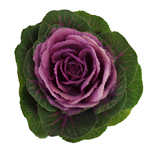 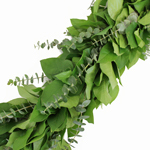 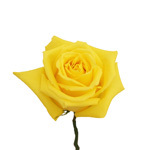 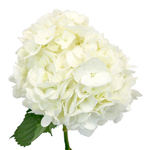 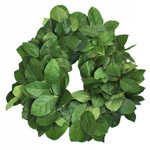 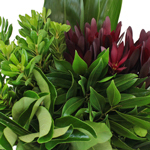 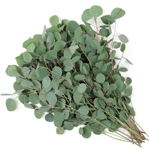 "FiftyFlowers.com - There's a mind-blowing variety of flower options here (50,000 choices). 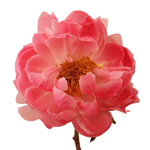 You can search by color, season and bloom type. 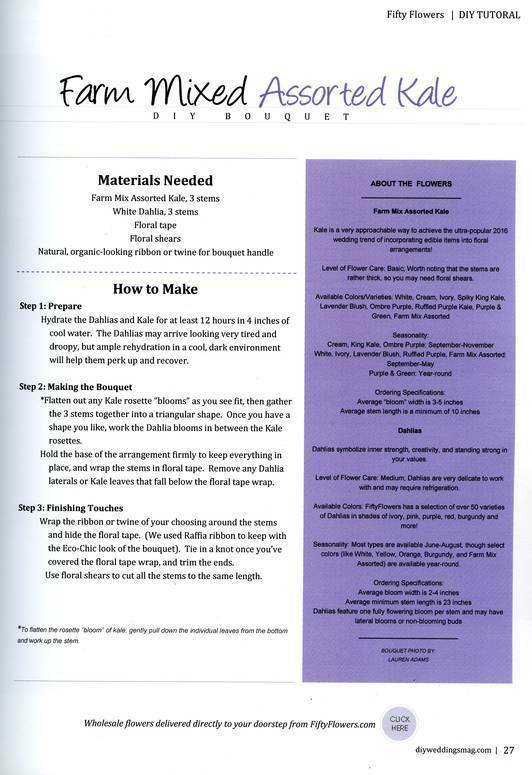 And the prices. 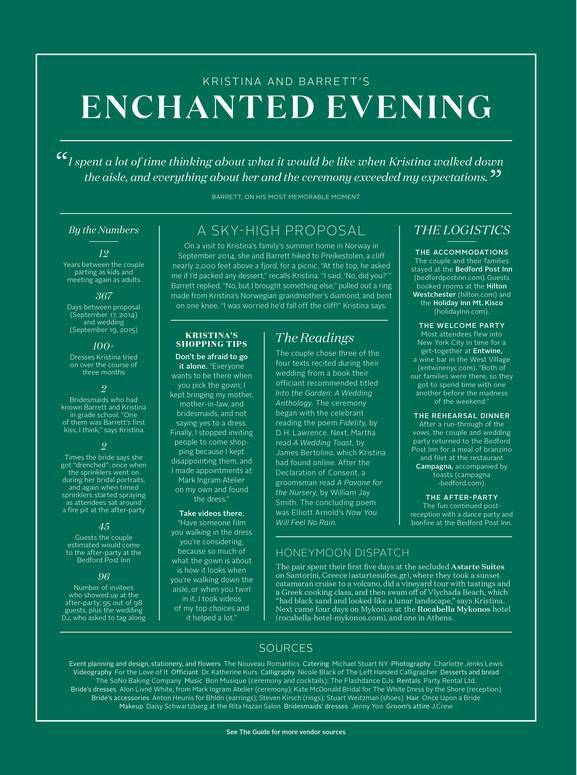 Amazing." 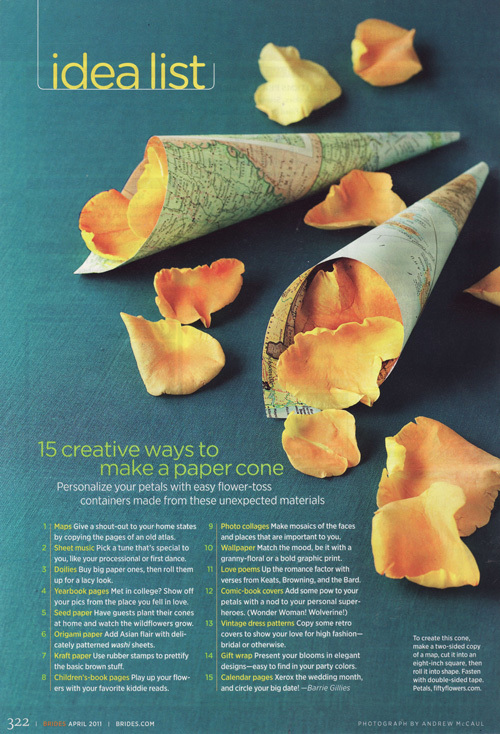 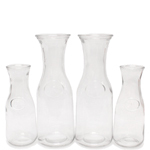 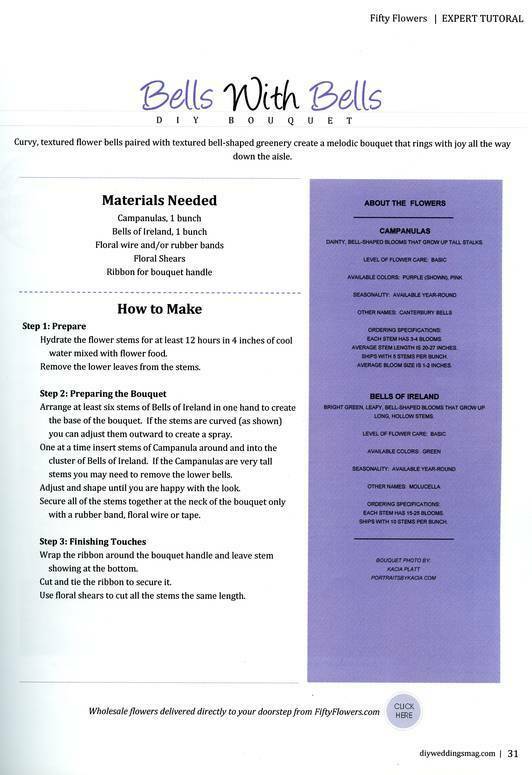 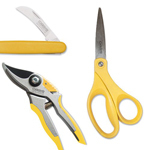 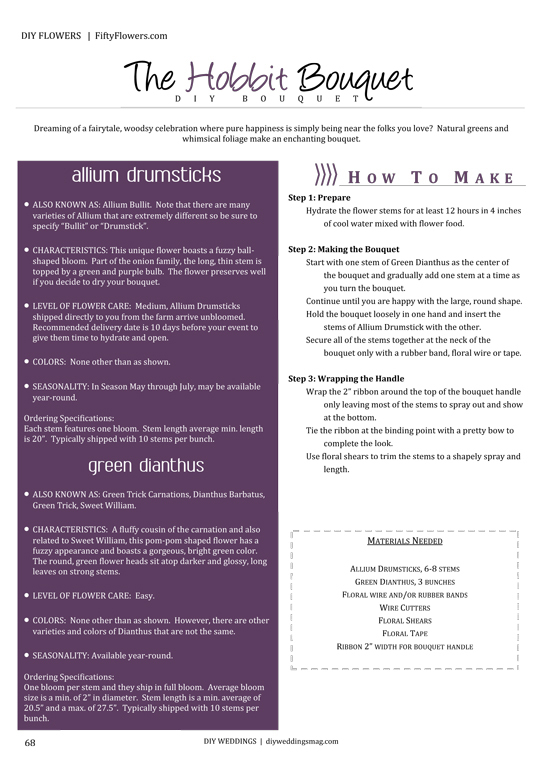 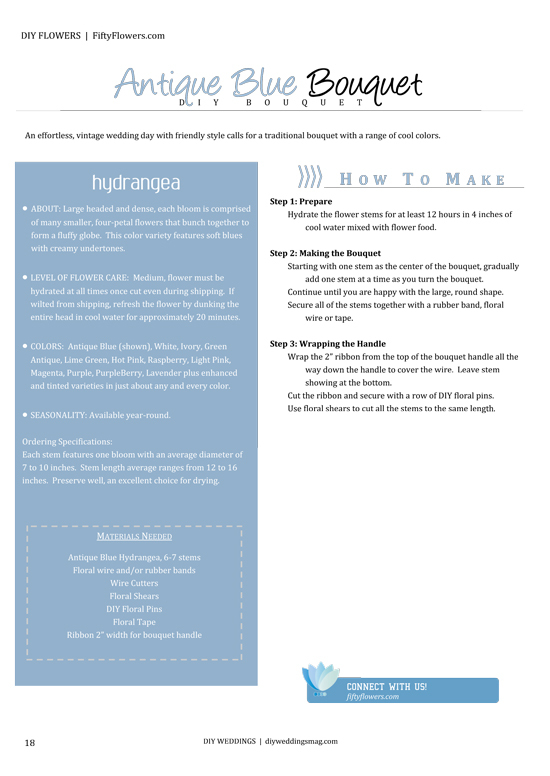 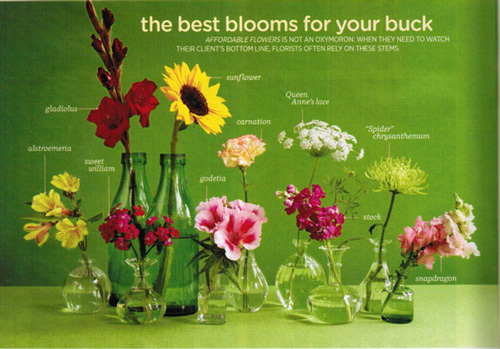 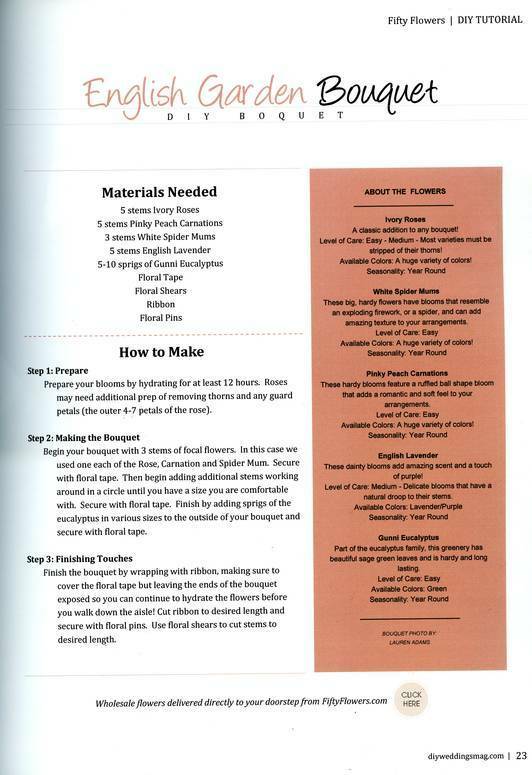 "DESIGN TAKEAWAY- ... arranging flowers yourself can be a great money-saver. 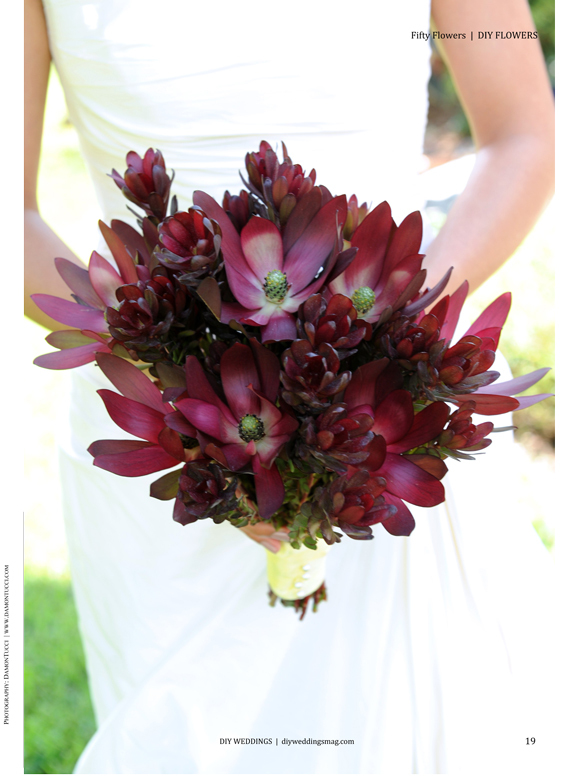 For this shoot, we ordered a variety of monochromatic blooms from the wonderful FiftyFlowers.com. 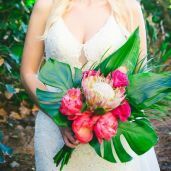 Keep things simple for yourself by ordering just one type of color of flower and make shure to leave plenty of time for processing once the flowers arrive on your doorstep a few days betode the wedding." 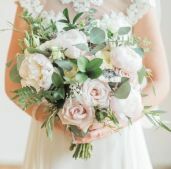 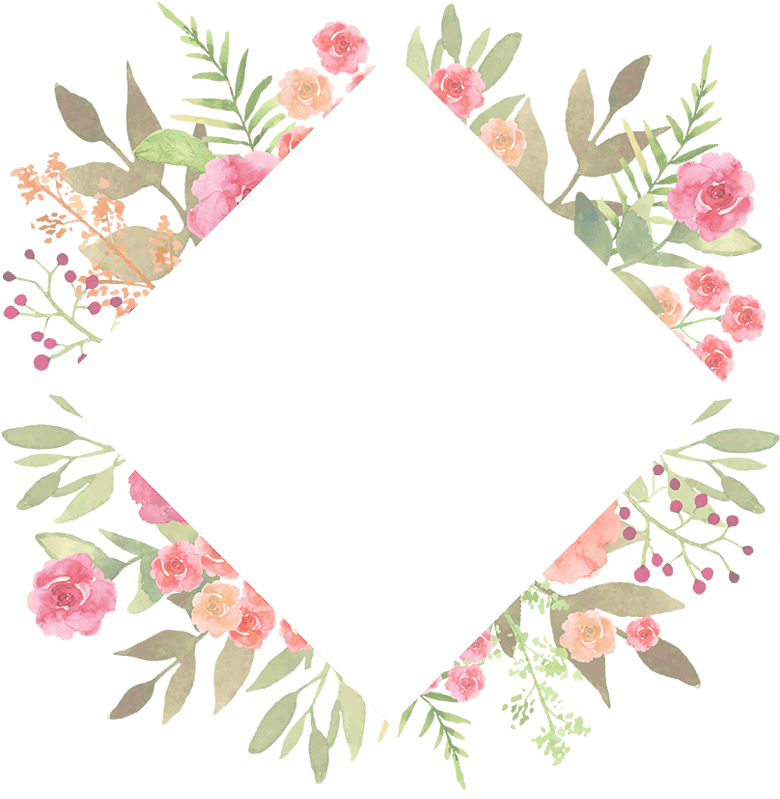 "FiftyFlowers not only offer a vibrant array of loose blooms and fresh garlands, they maintain a vast inventory of the most popular and sought after florals - all at an affordable price! 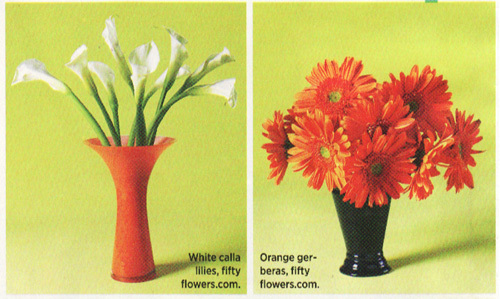 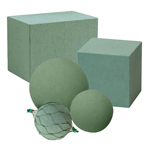 Do not let the "order online" scare you away." 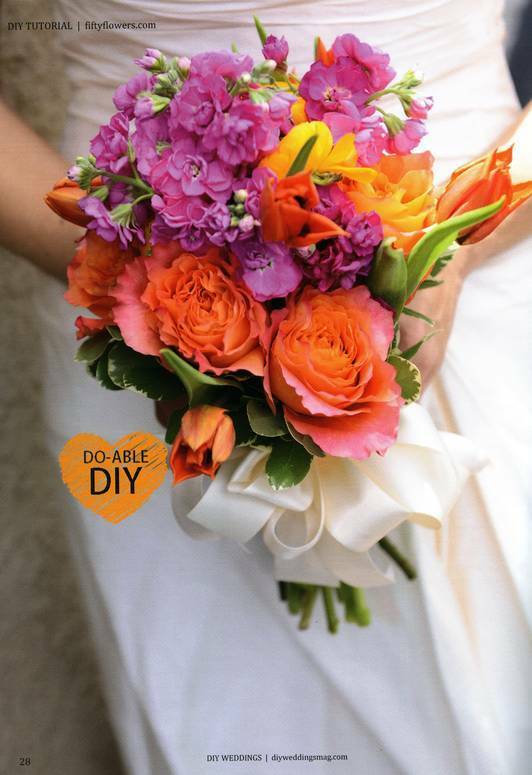 Three beautiful Spring bouquets by FiftyFlowers are DIY-friendly and full of color! 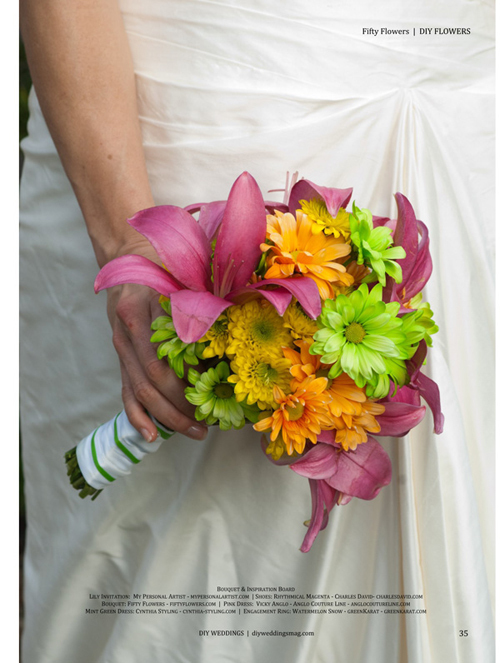 The flowers were purchased at FiftyFlowers.com and the bouquets were created by Lily Greenthumb’s Wedding Event Design. 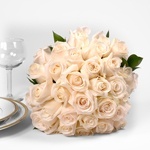 "There have been a lot of companies recently that specialize in shipping flowers directly to brides from Farms. 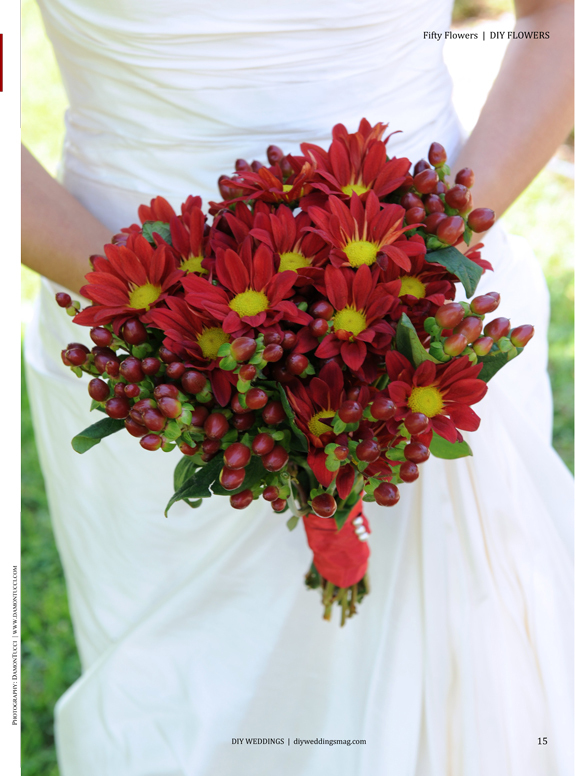 (Our fav? 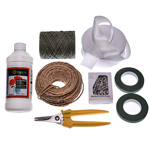 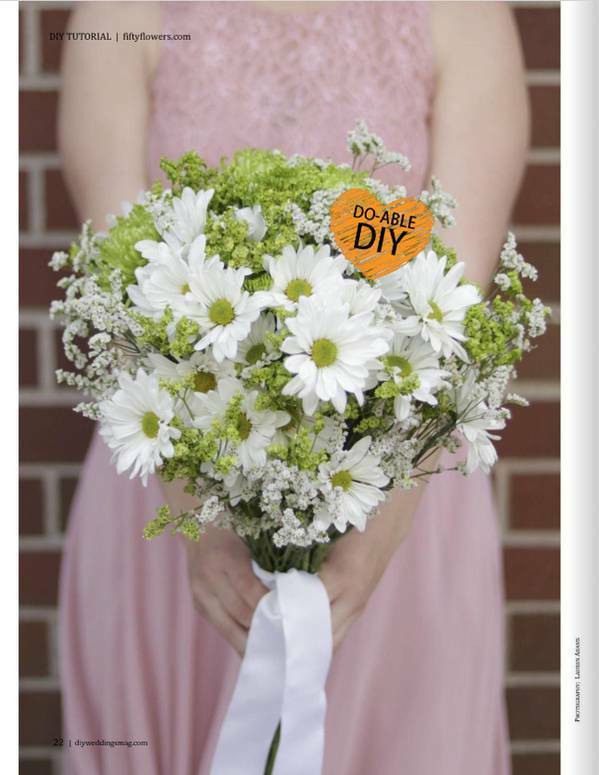 FiftyFlowers.com) Companies like FiftyFlowers.com allow a DIY Bride to successfully accomplish her dream bouquet! 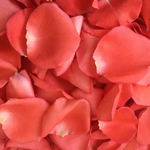 Here's some easy step by step foolproof instructions..."
Flowers from FiftyFlowers are used to decorate a Diwali celebration. 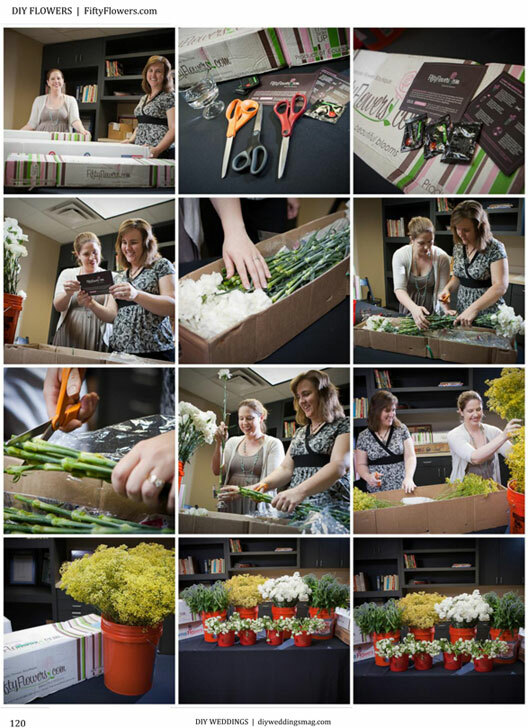 Amy, Kristy, family and friends DIYed bouquets and centerpieces with blooms from FiftyFlowers.com. 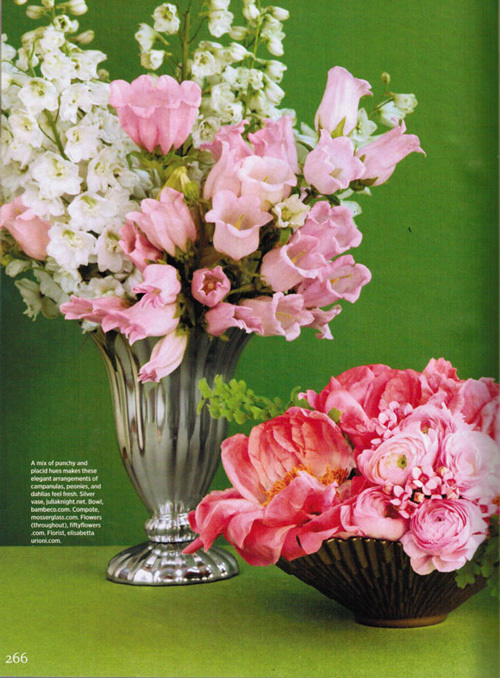 "A mix of punchy and placid hues makes these elegant arrangements of campanulas, peonies, and dahlias feel fresh." 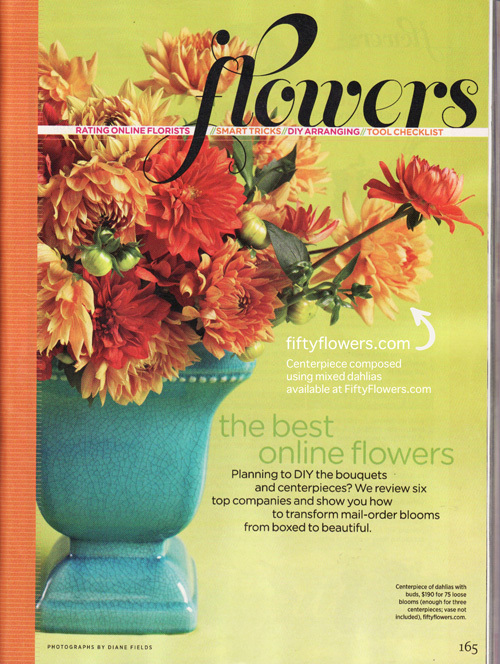 Flowers throughout, FiftyFlowers.com. 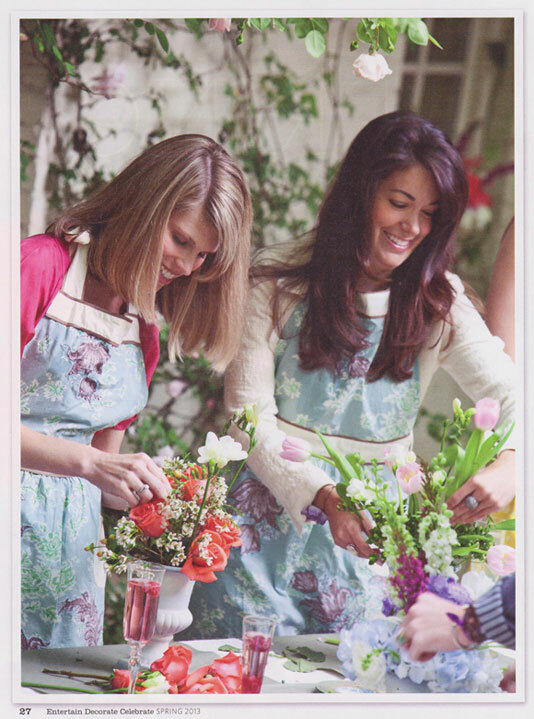 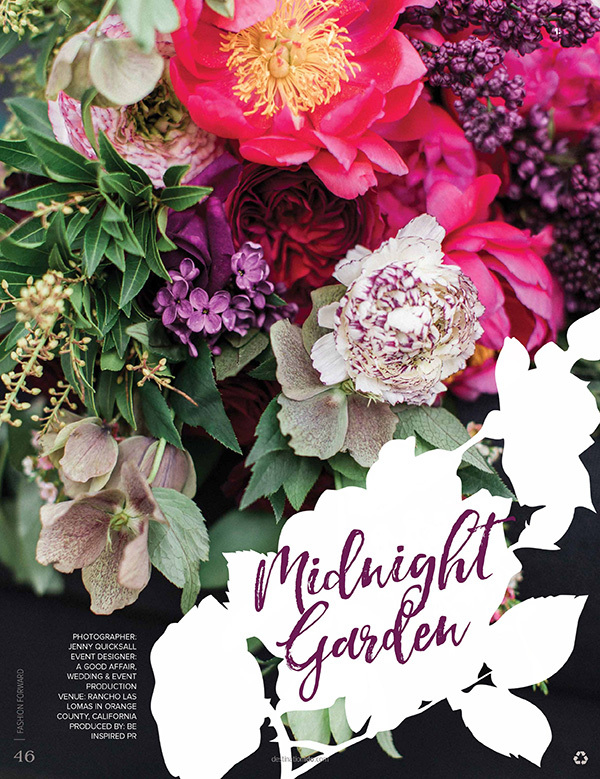 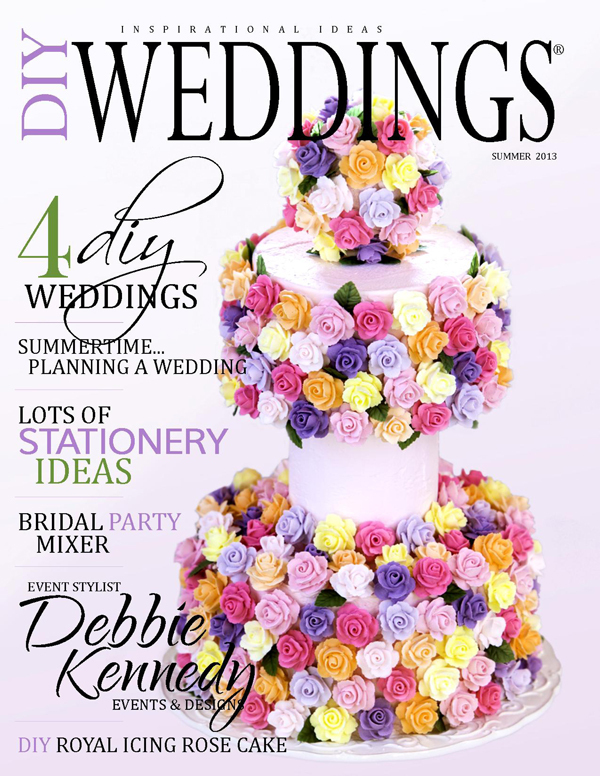 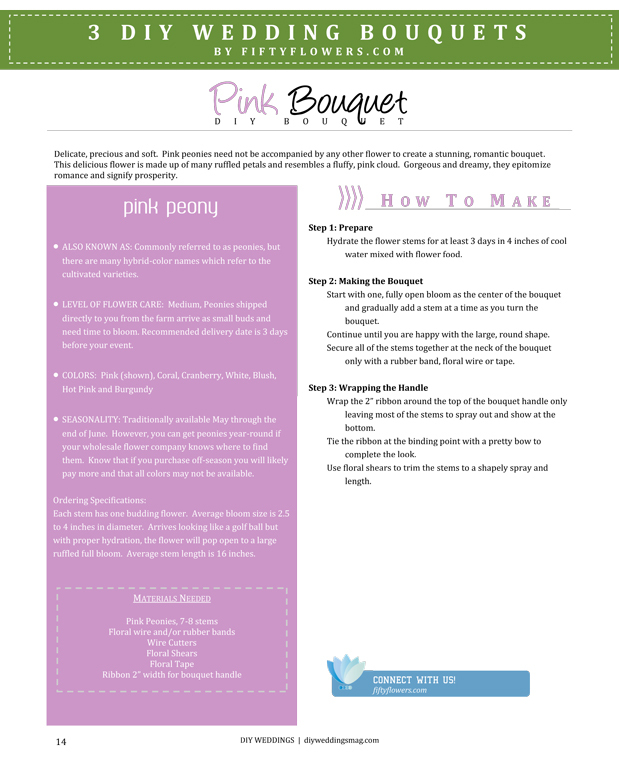 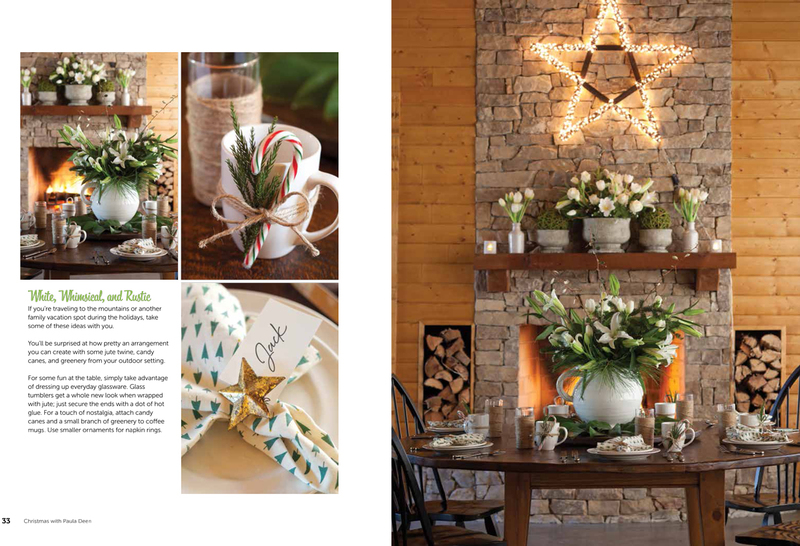 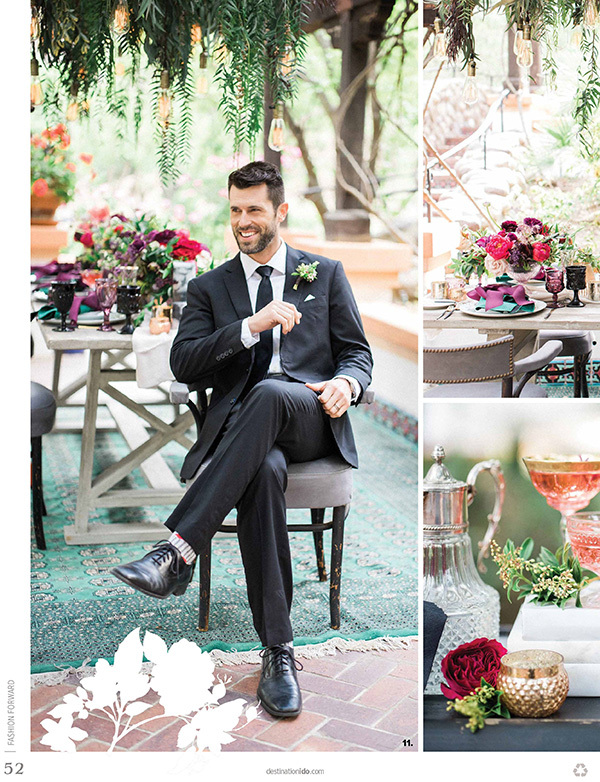 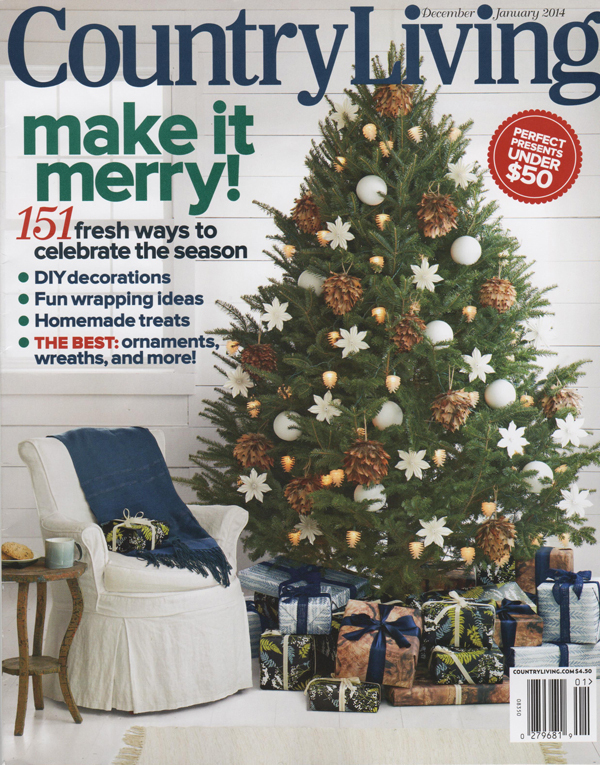 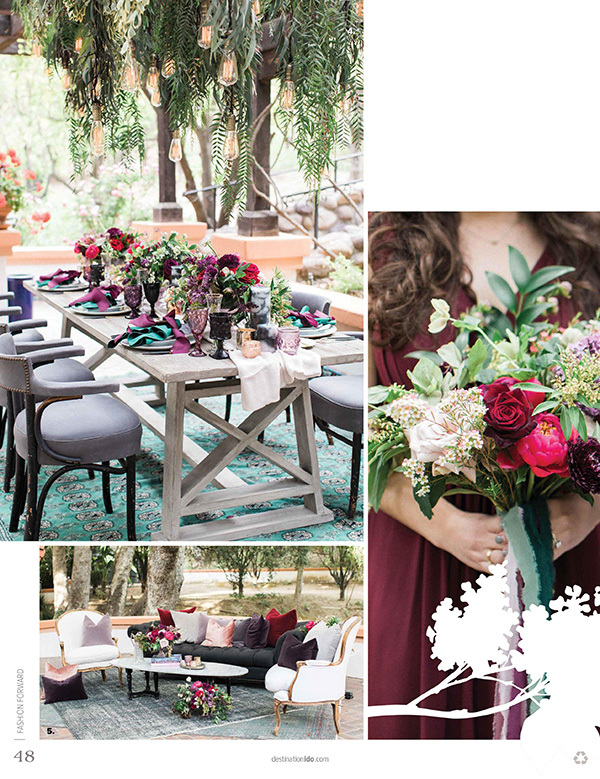 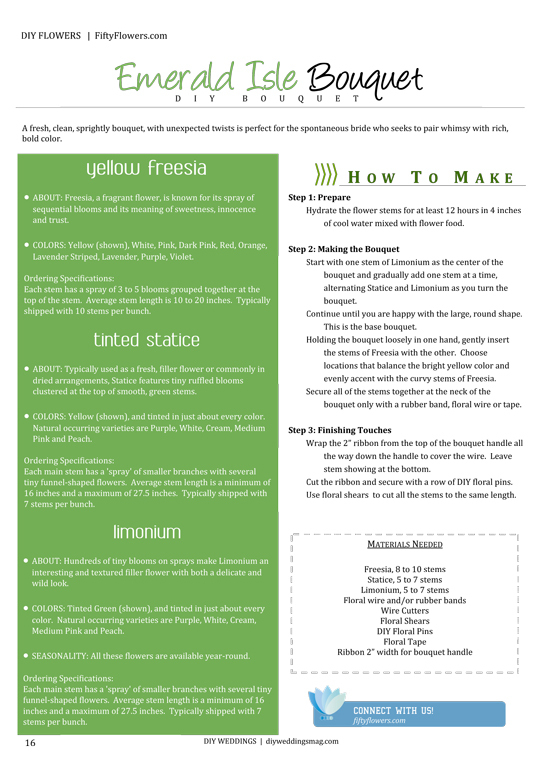 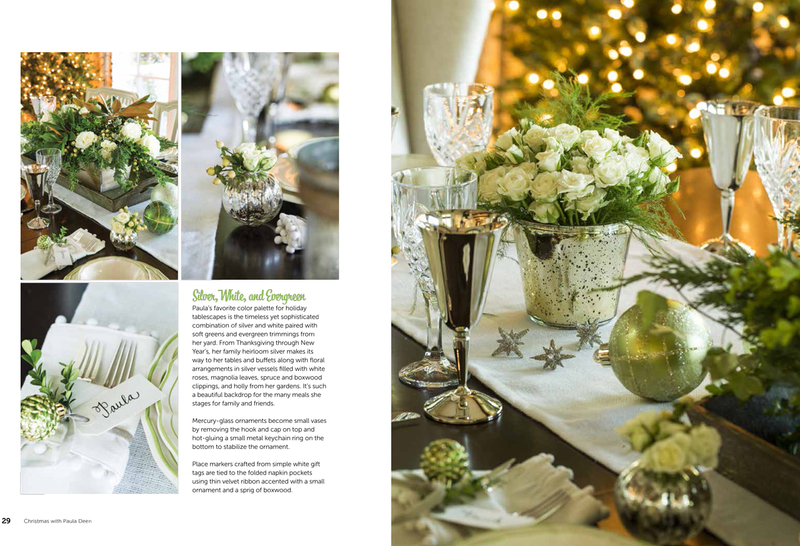 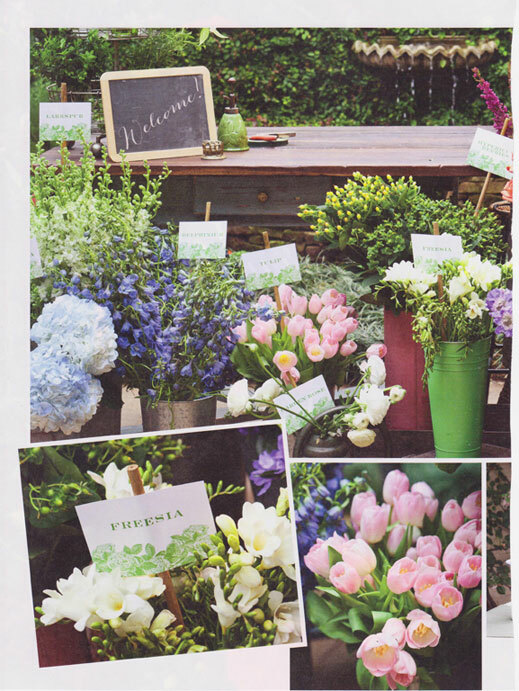 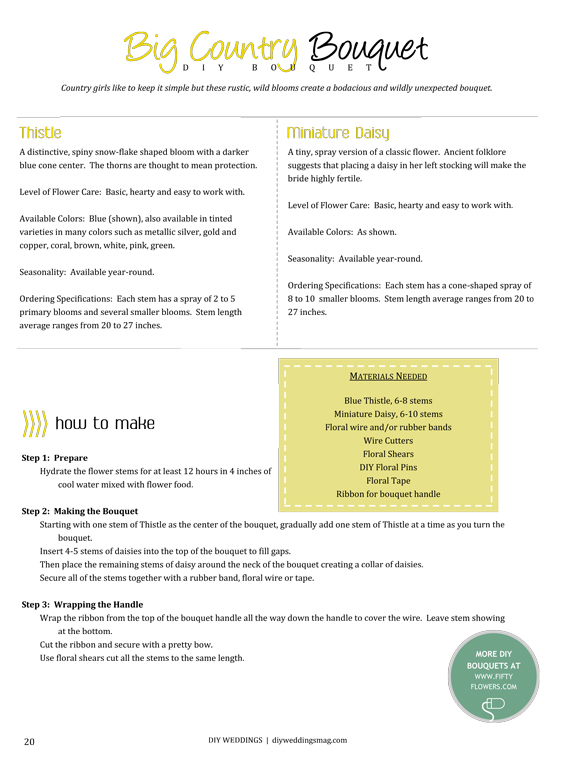 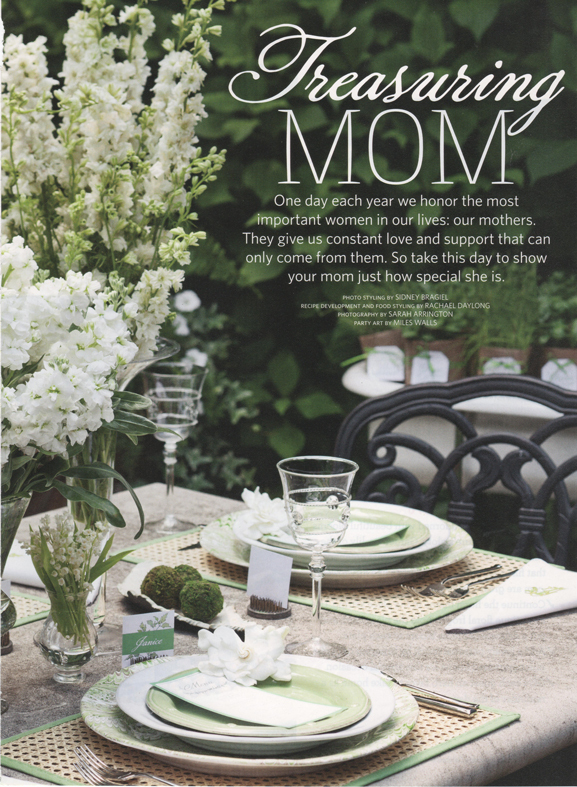 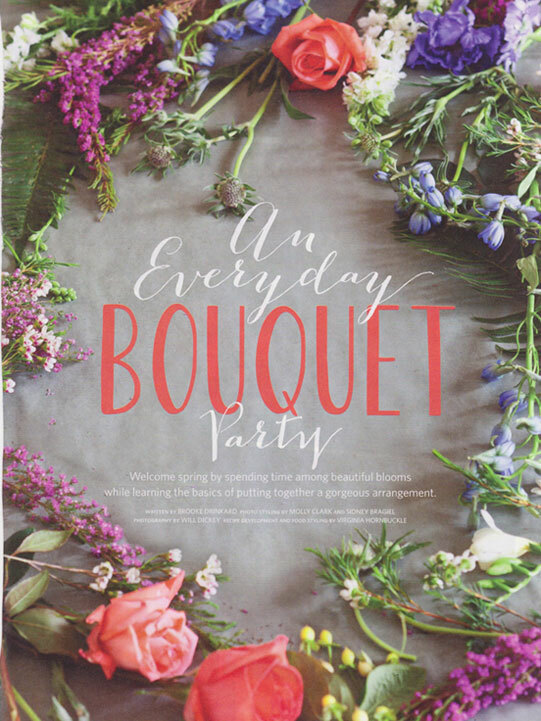 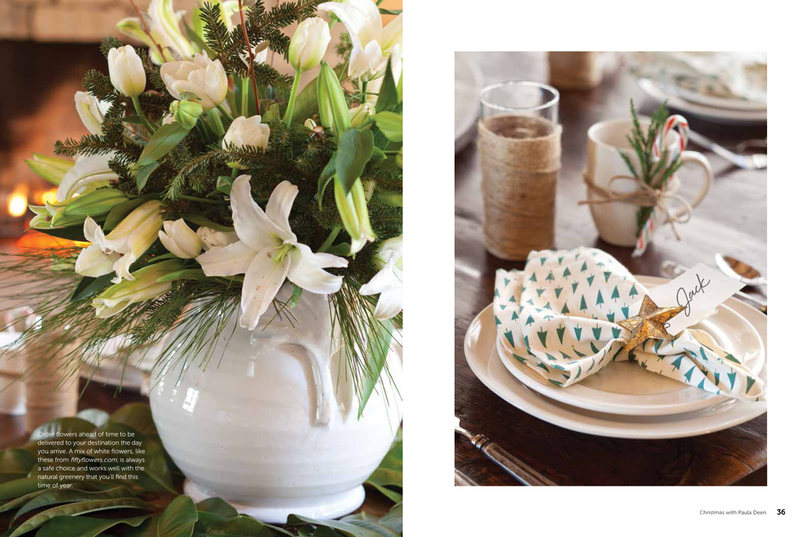 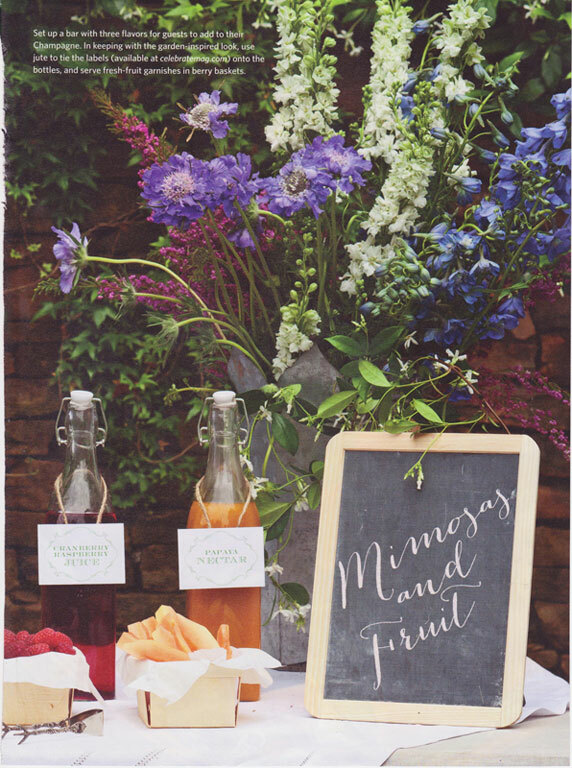 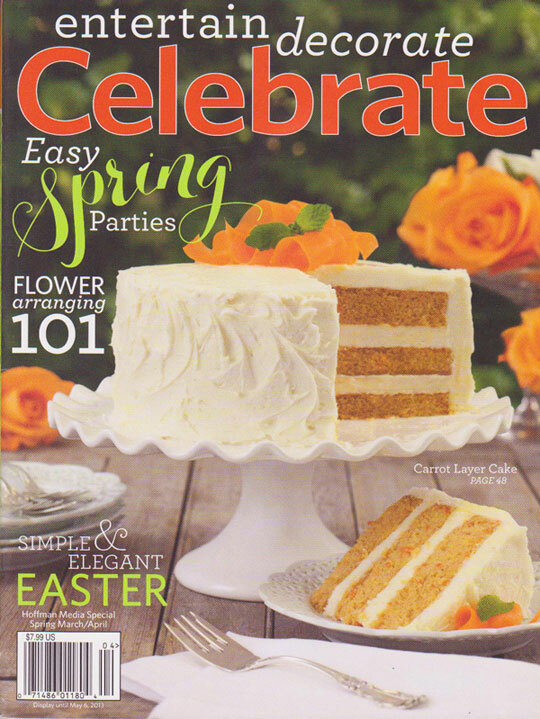 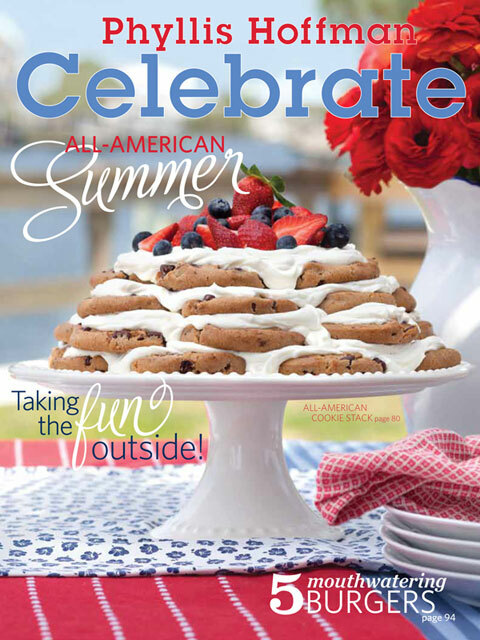 A beautiful 8 page spread filled with DIY strategies, florist know-how, tips and tricks, and gorgeous flowers. 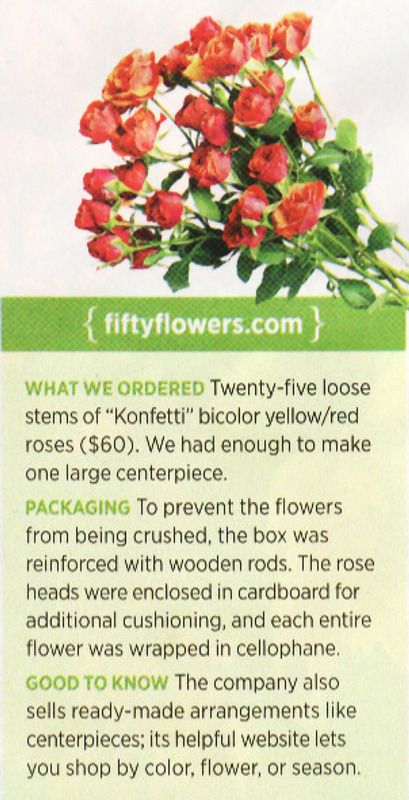 "Packaging - To prevent the flowers from being crushed, the box was reinforced with wooden rods. 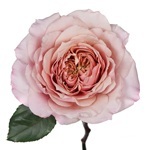 The rose heads were enclosed in cardboard for additional cushioning, and each entire flower was wrapped in cellophane." 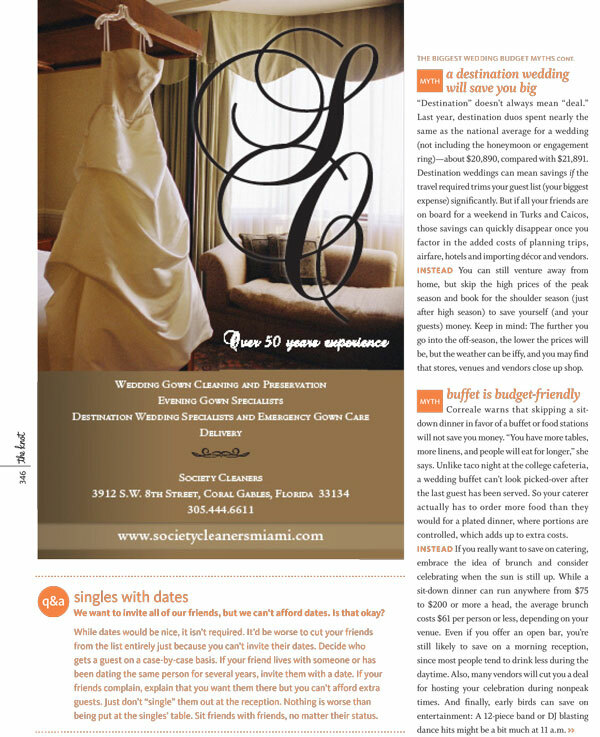 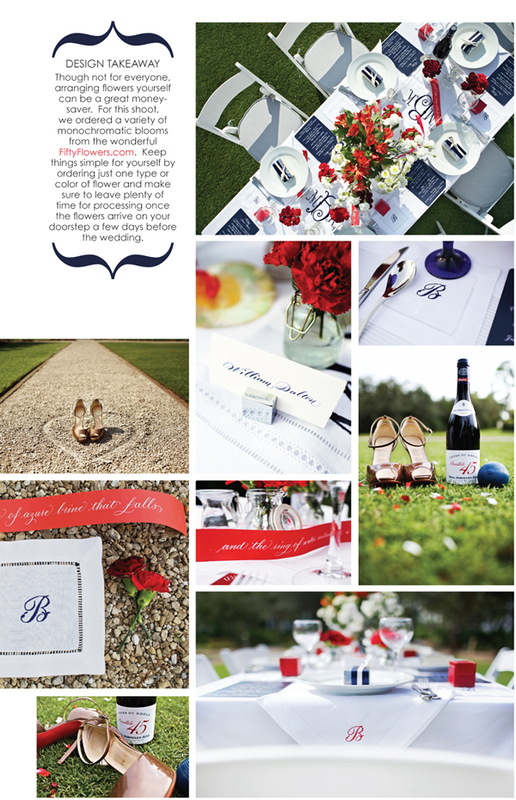 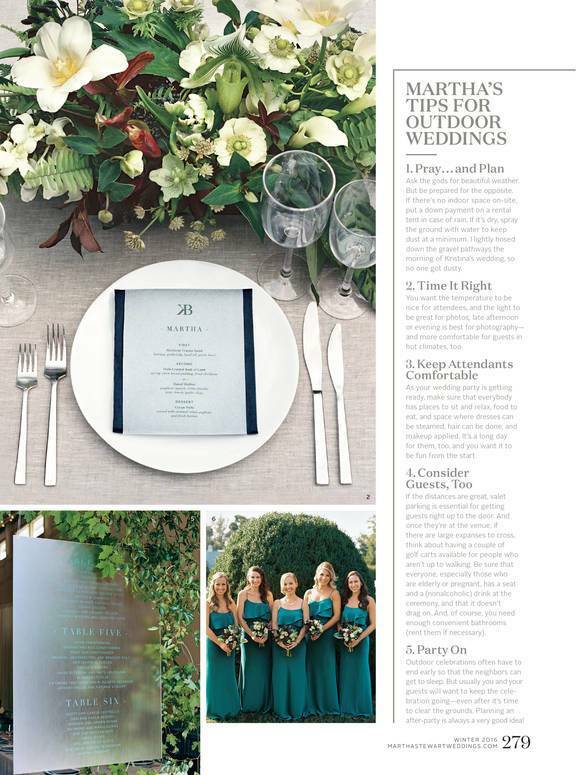 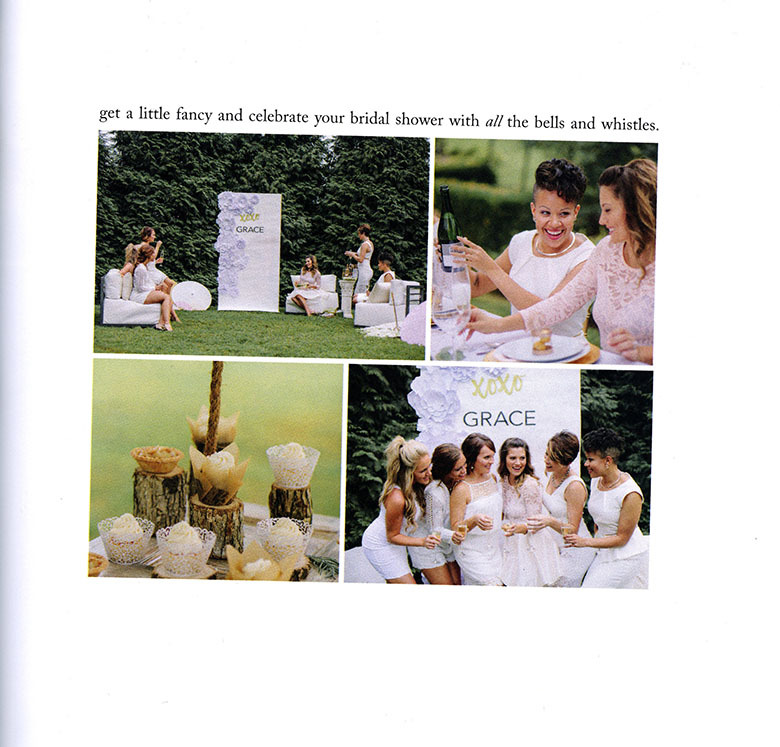 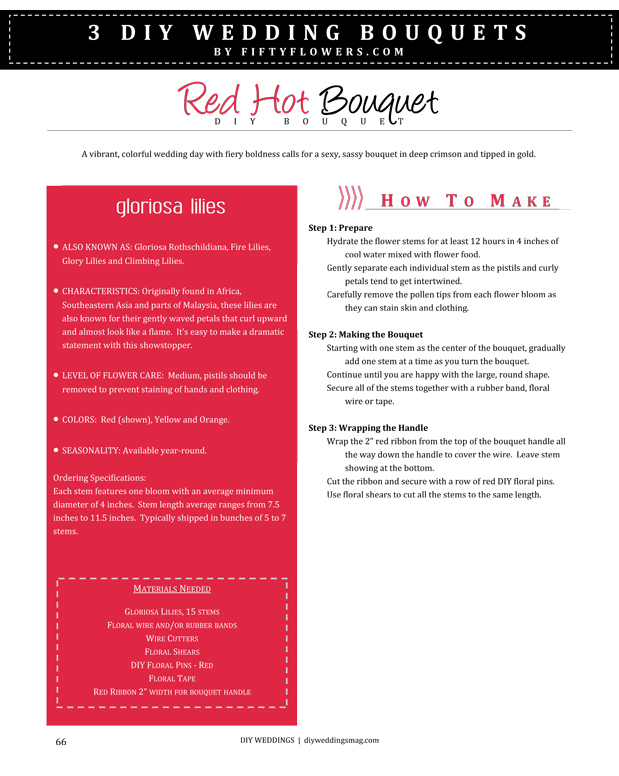 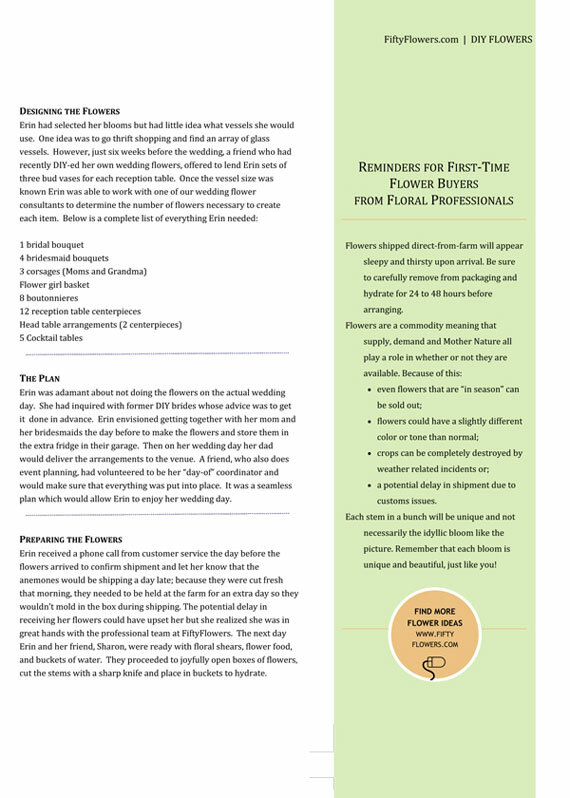 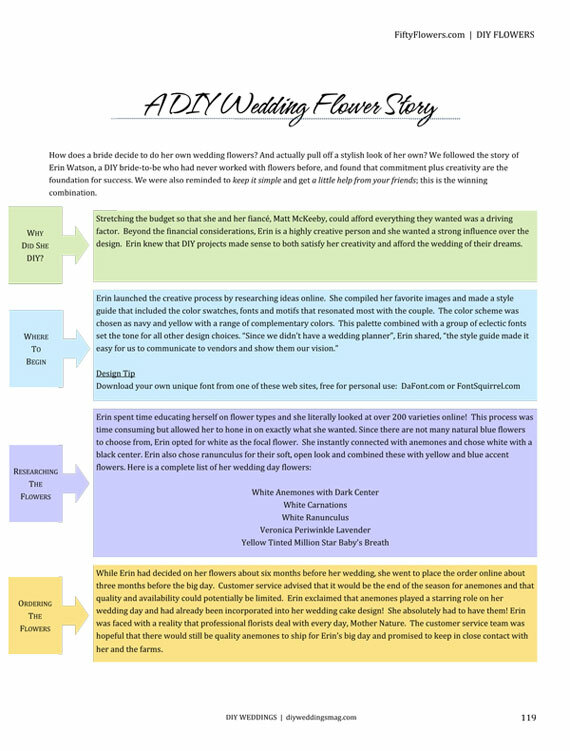 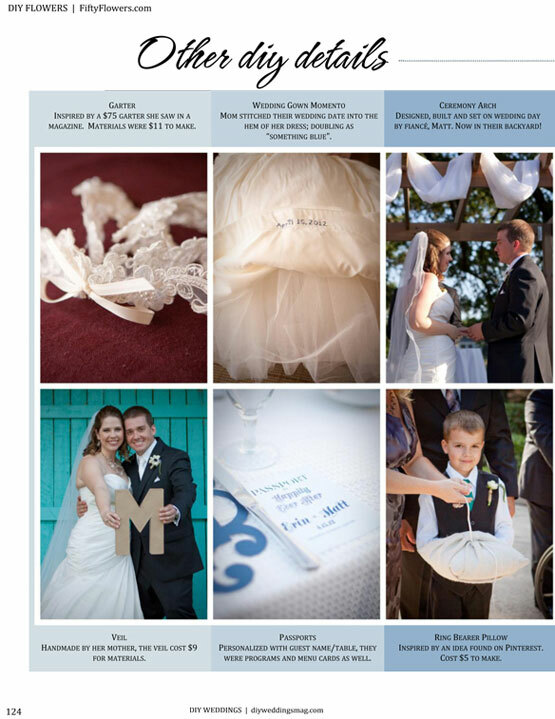 "SITES FOR STEMS – FiftyFlowers.com Wedding coordinators (and brides!) 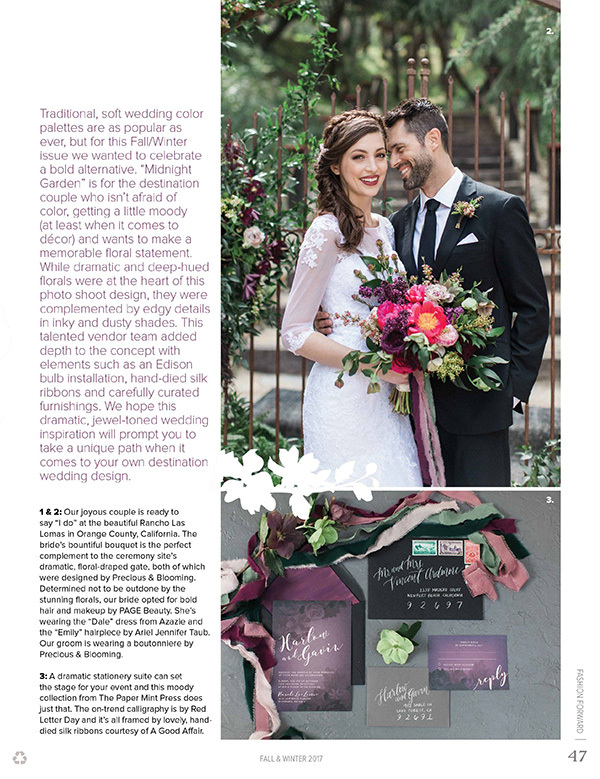 use this site for bulk flowers shipped directly from the growers by overnight express; you can order "Made for You" packages of arrangements and bouquets in your colors"
"While dramatic and deep-hued florals were at the heart of this photo shoot design, they were complemented by edgy details in inky and dusty shades." 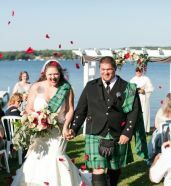 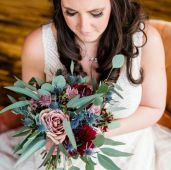 "The bride's bouquet was made up of garden roses, anemones, ranunculus, parrot tulips, hellebores, and orchids from FiftyFlowers." 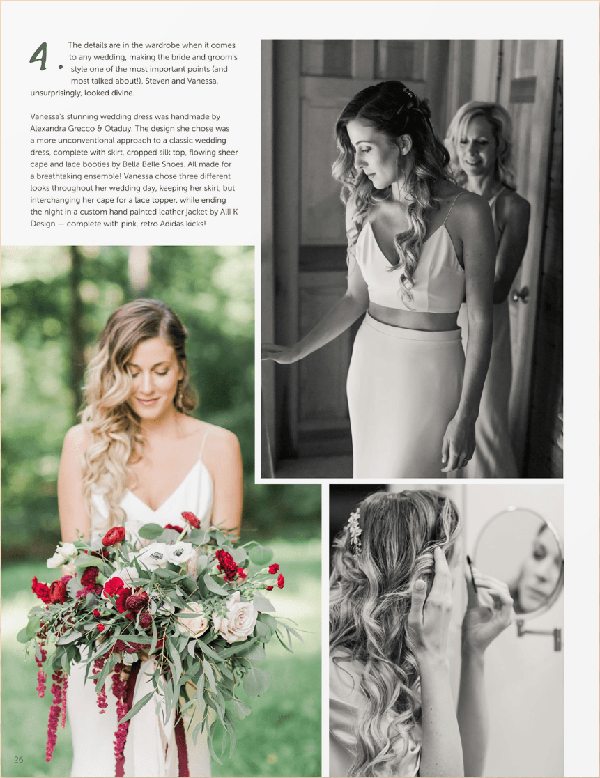 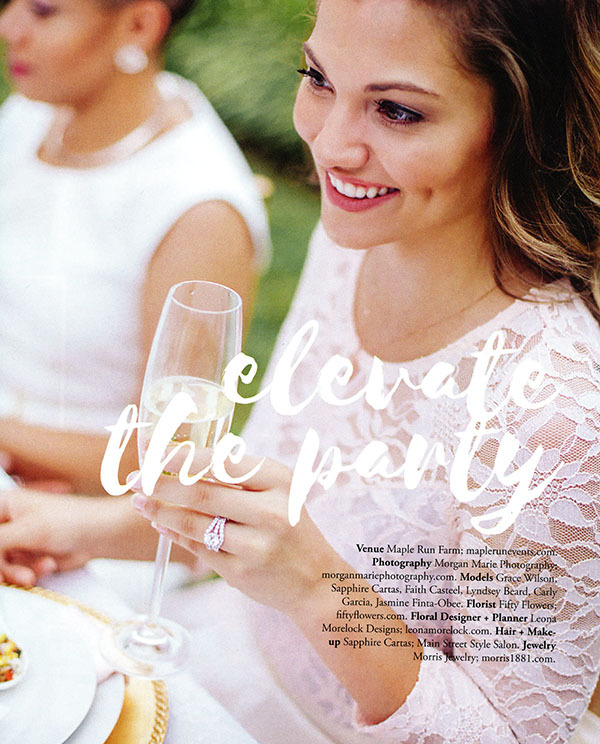 "The overall shoot style leans modern, with lots of bright white to keep it fresh and hints of gold for a celebratory feel." 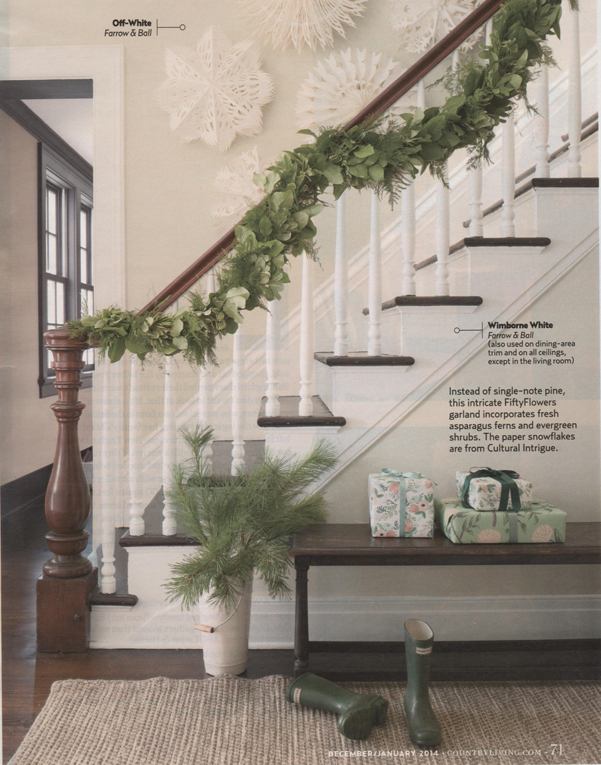 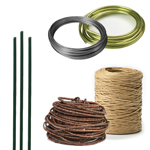 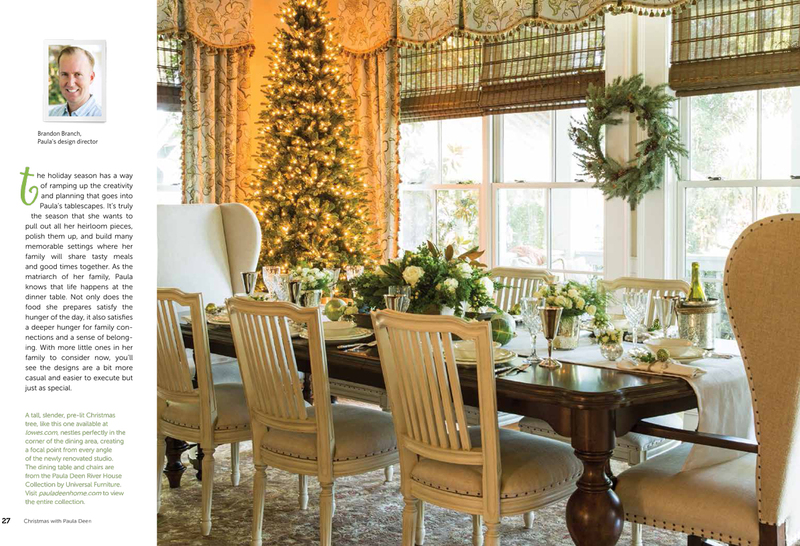 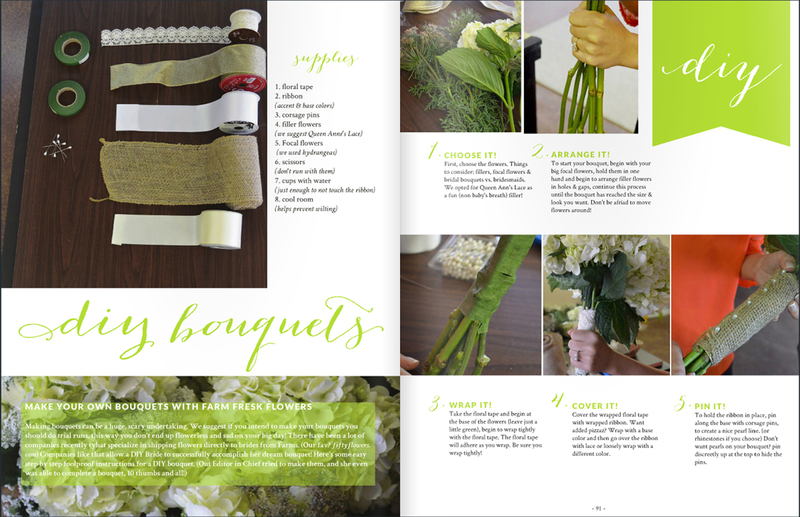 "Instead of single-note pine, this intricate FiftyFlowers garland incorporates fresh asparagus ferns and evergreen shrubs." 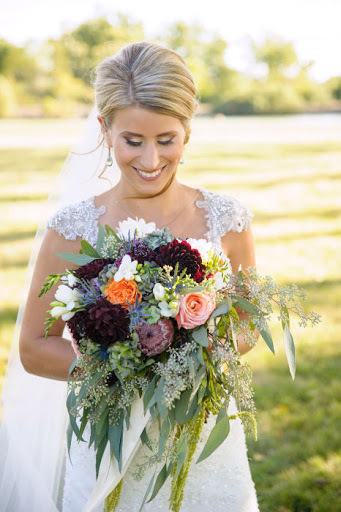 Feast your eyes on 3 DIY wedding bouquets for Fall by FiftyFlowers.com. 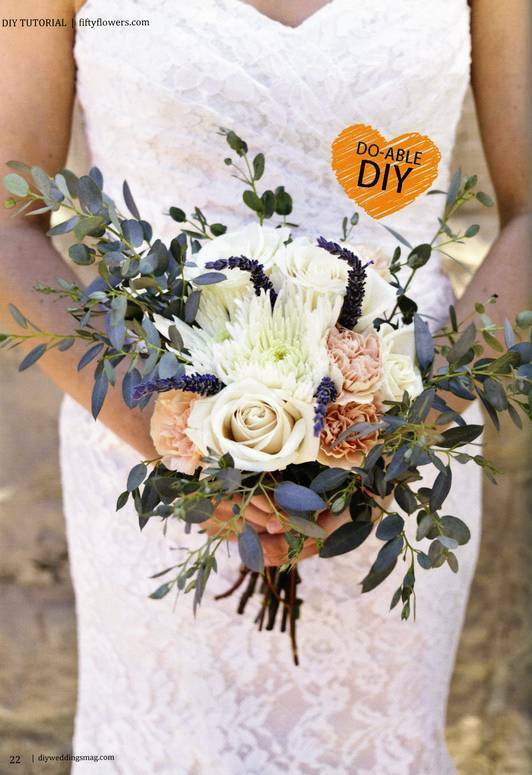 It's all about texture with these 3 DIY wedding bouquets from FiftyFlowers.com. 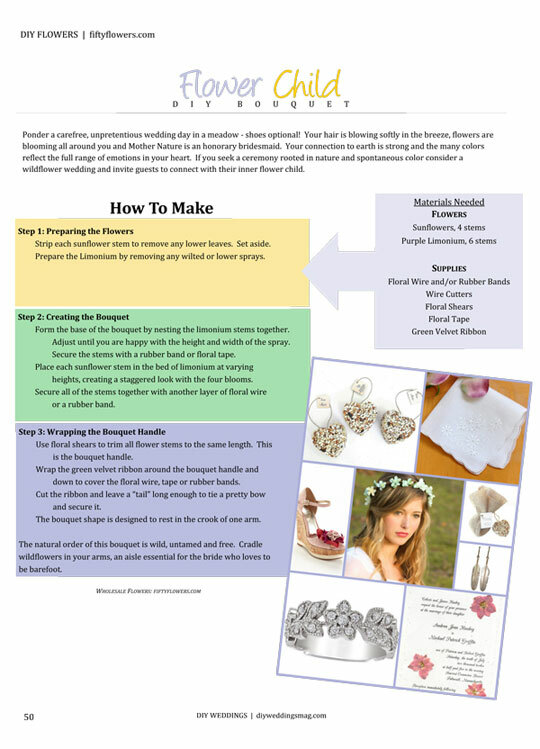 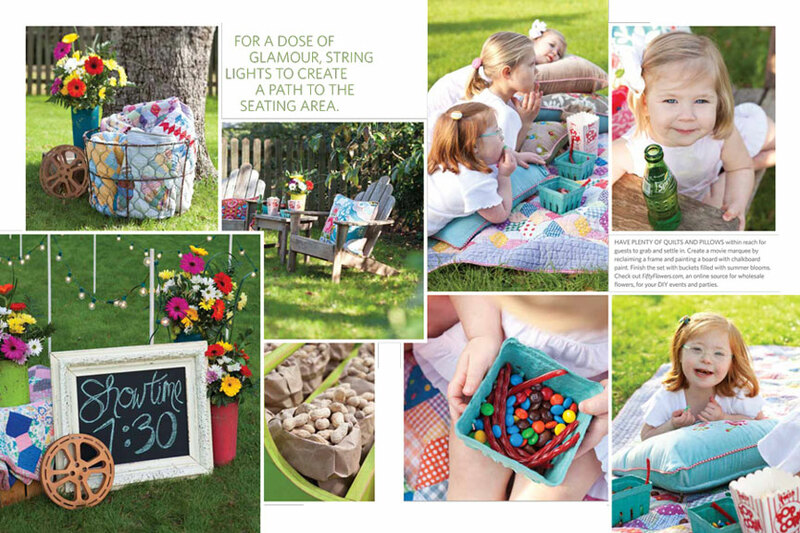 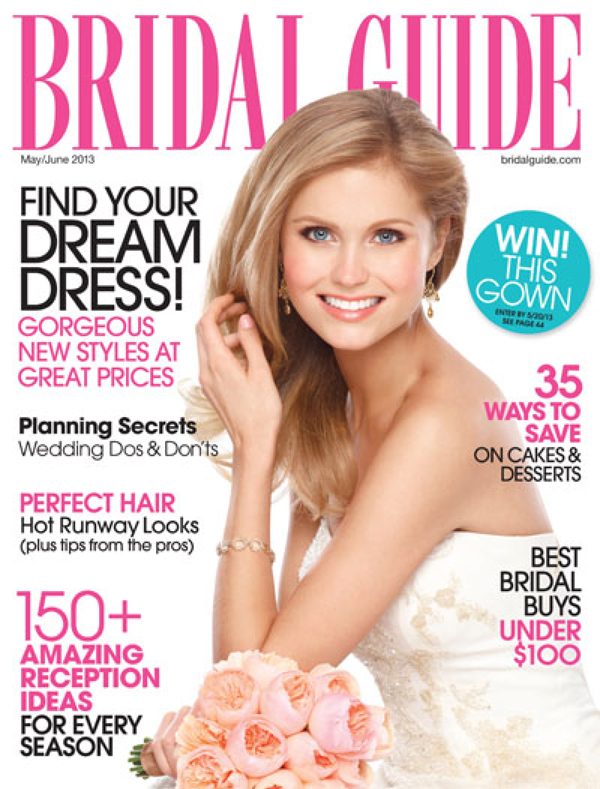 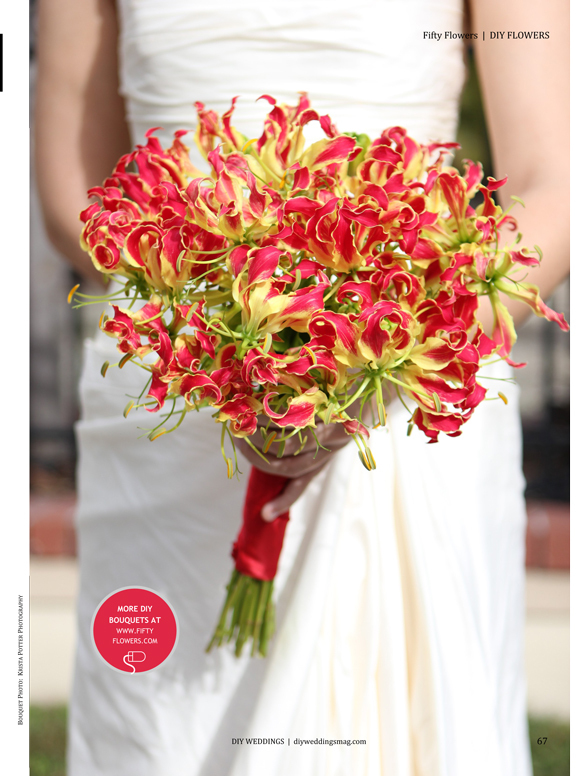 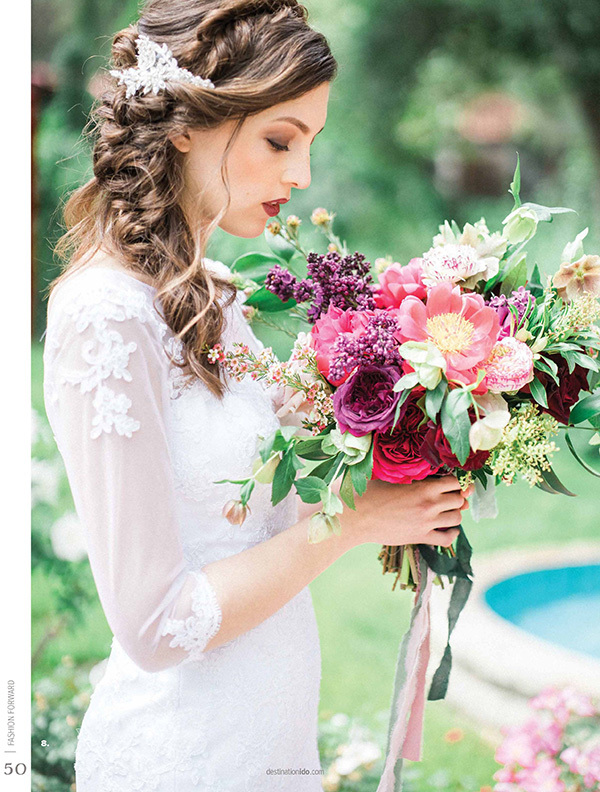 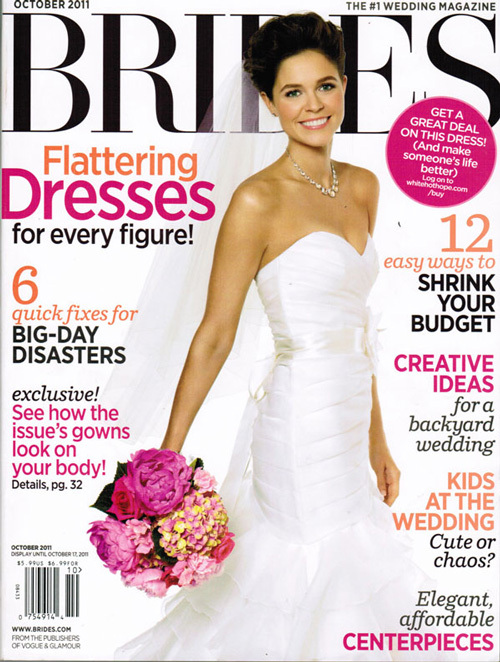 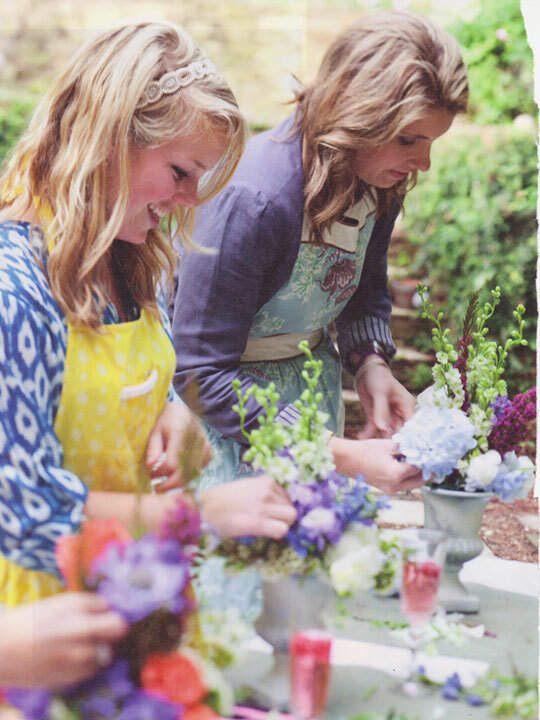 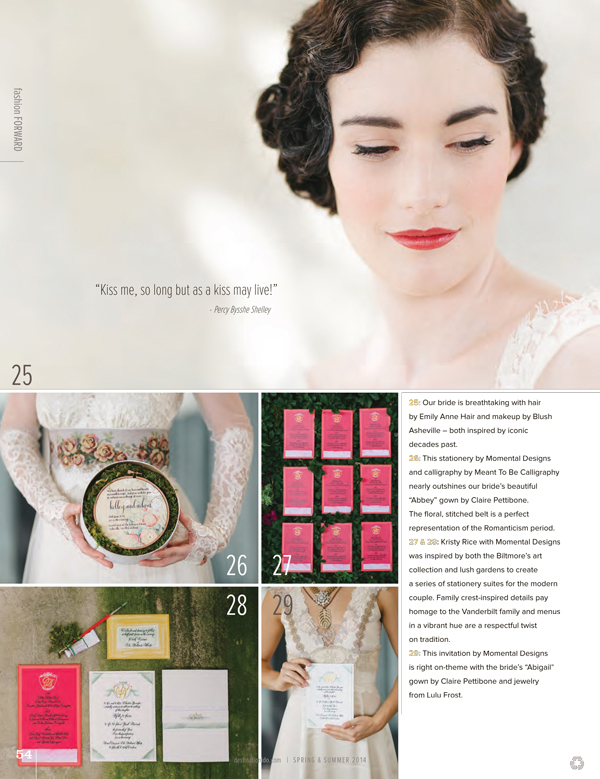 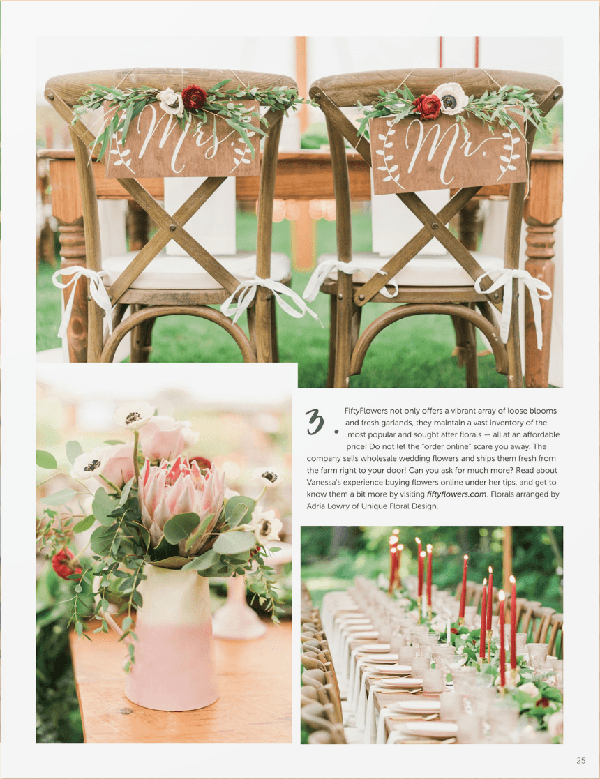 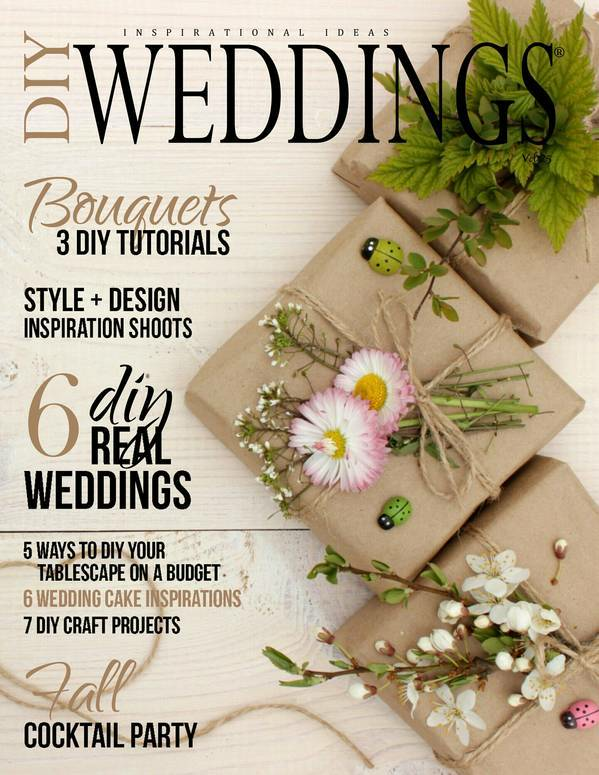 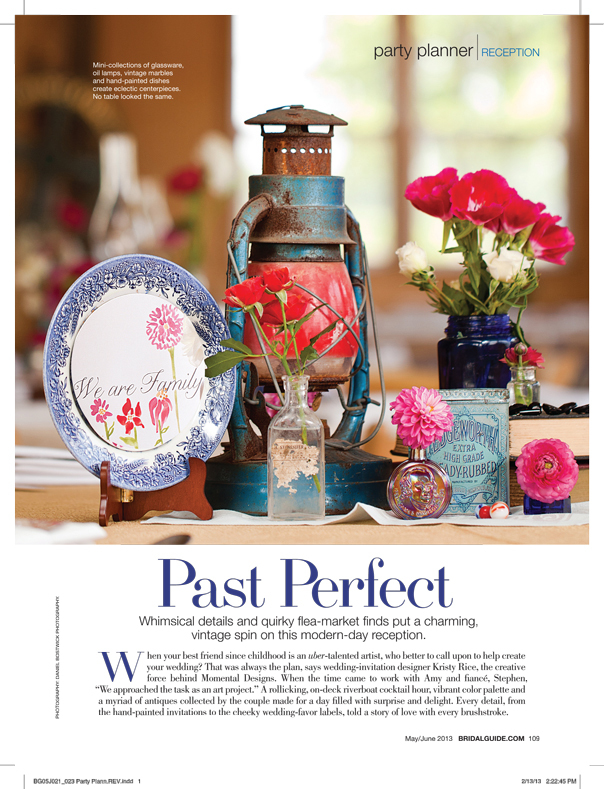 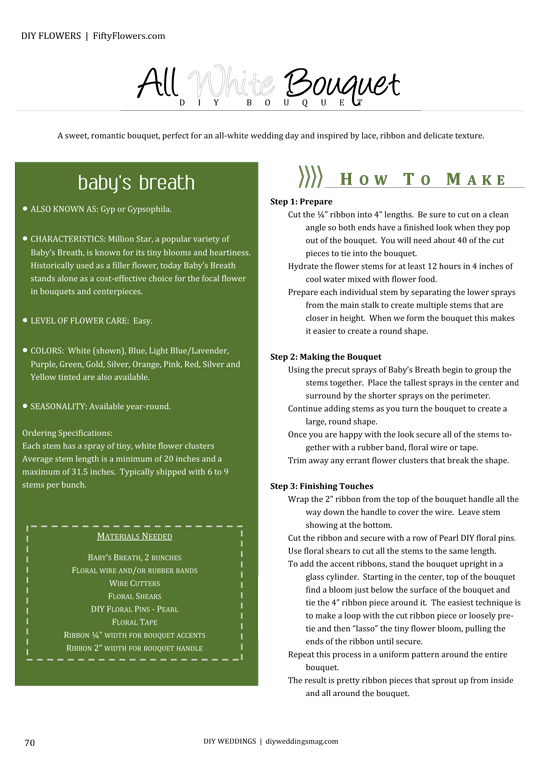 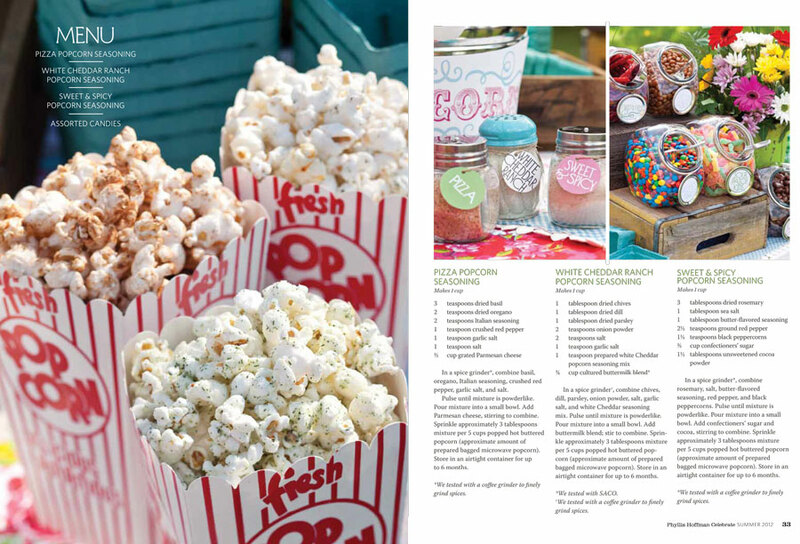 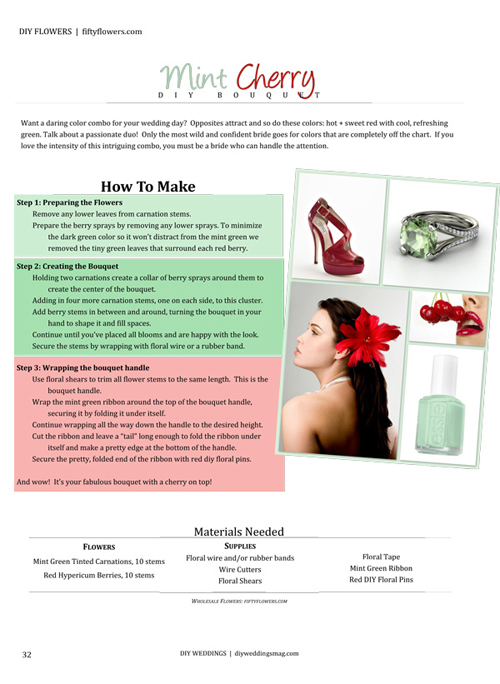 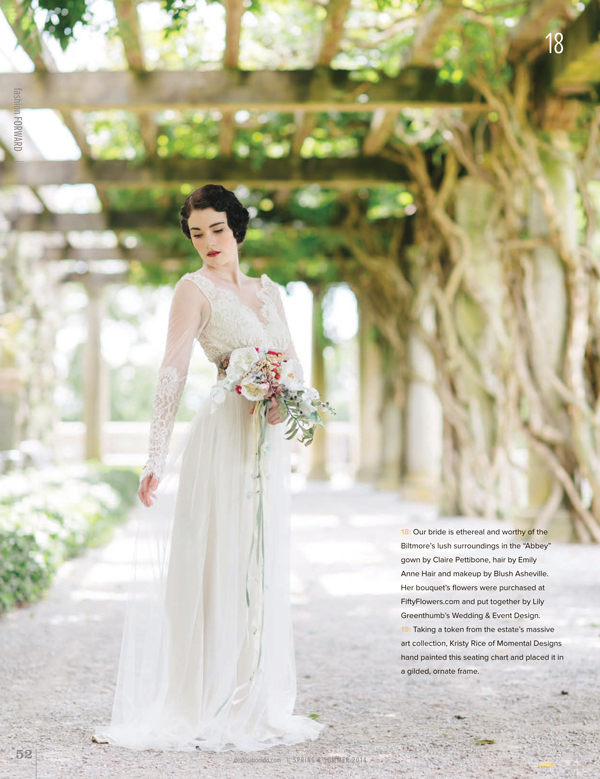 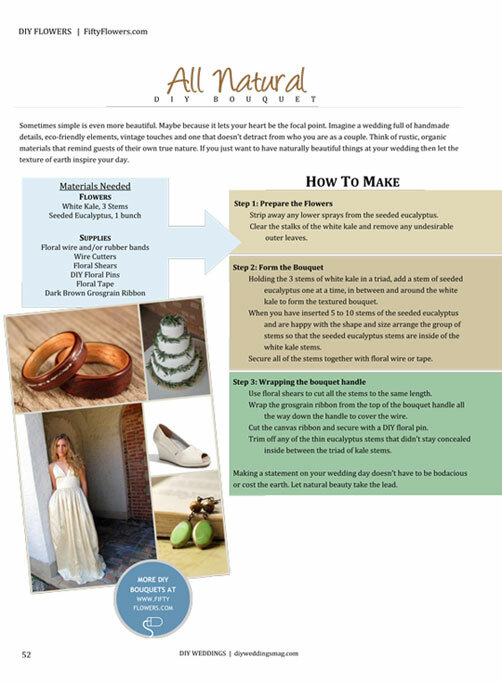 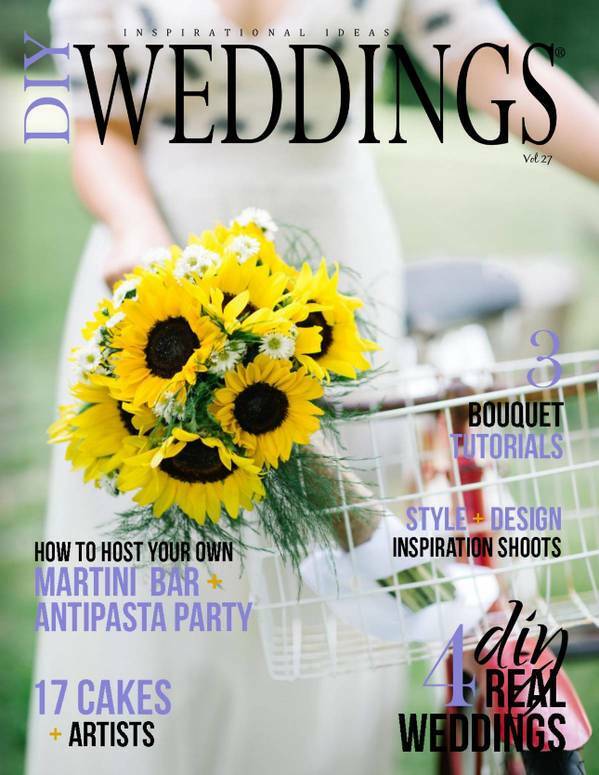 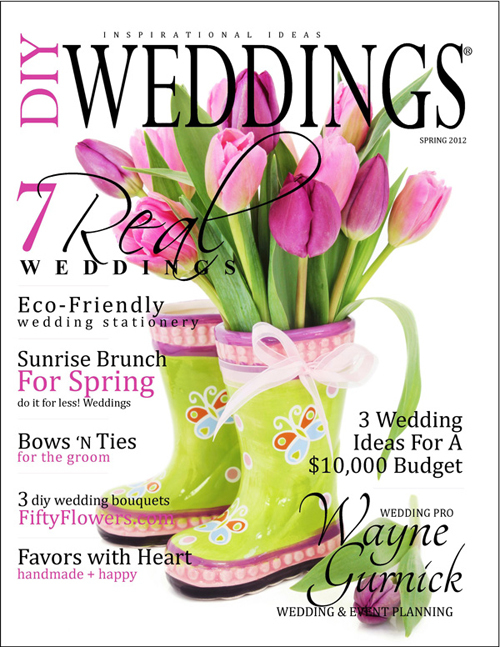 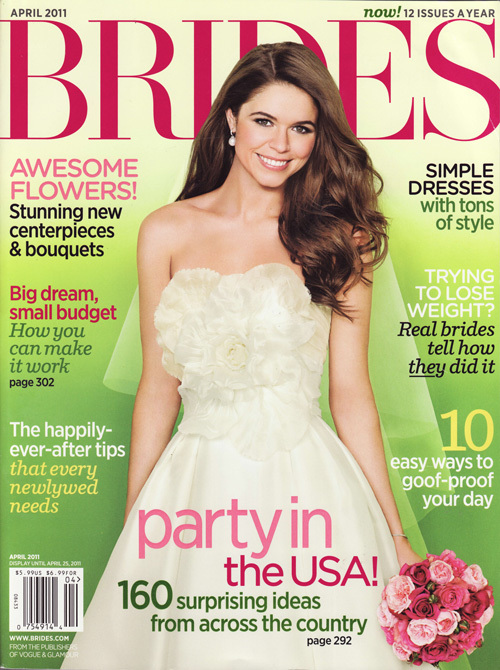 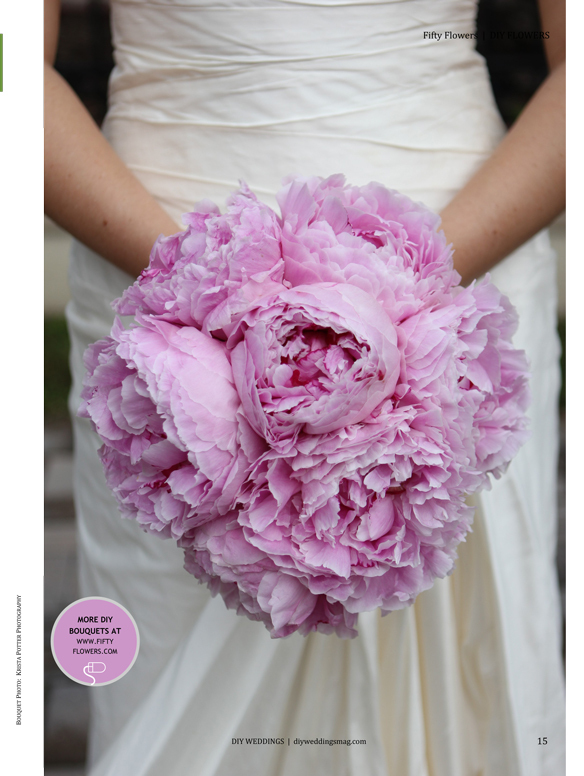 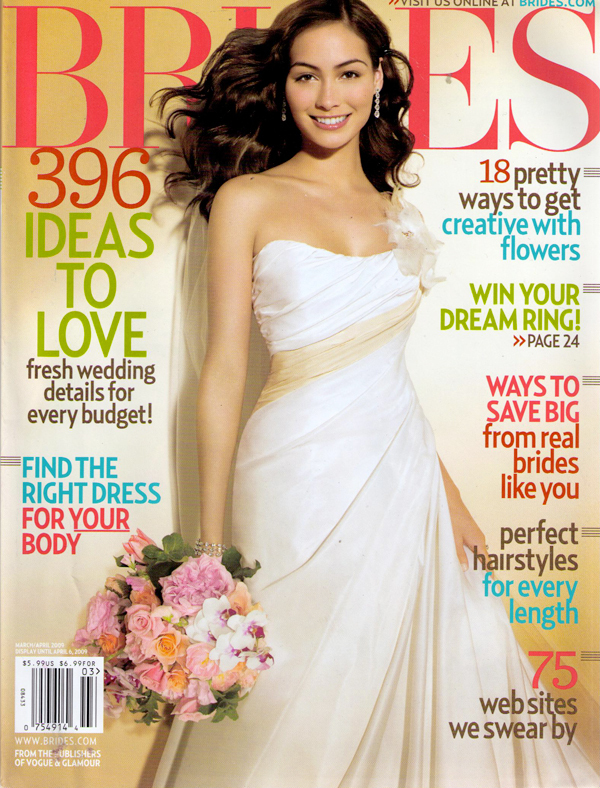 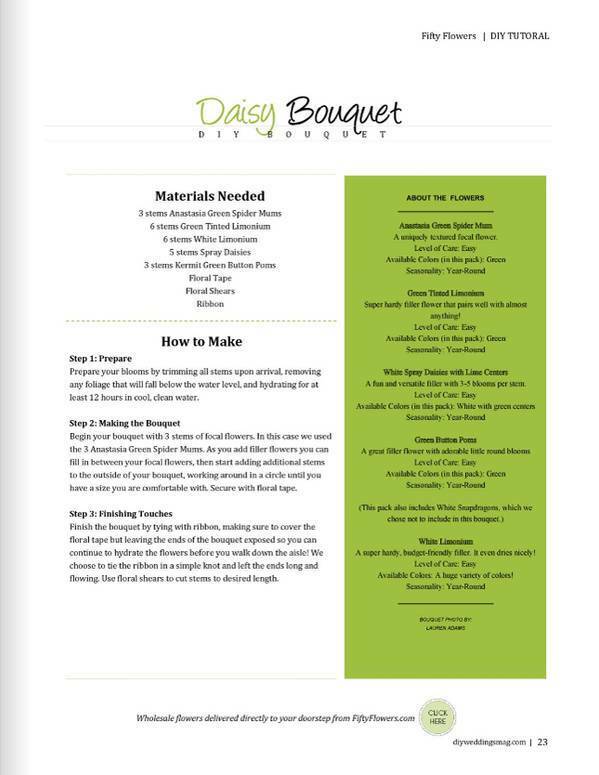 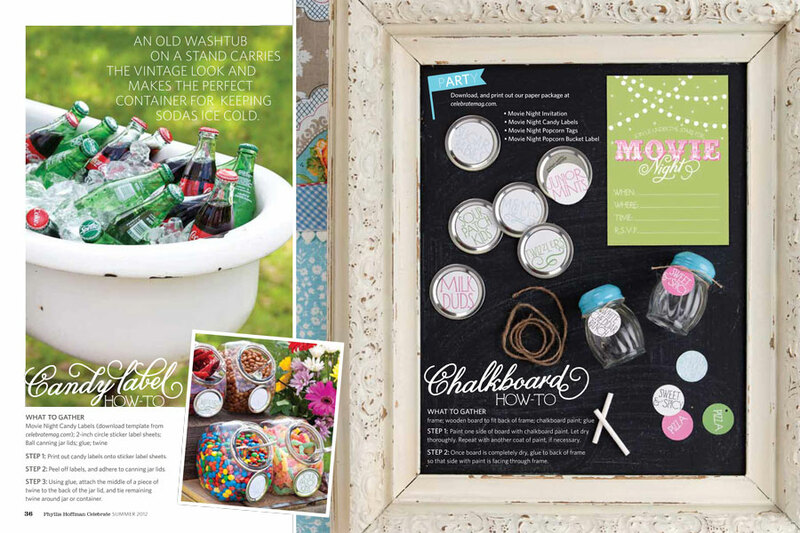 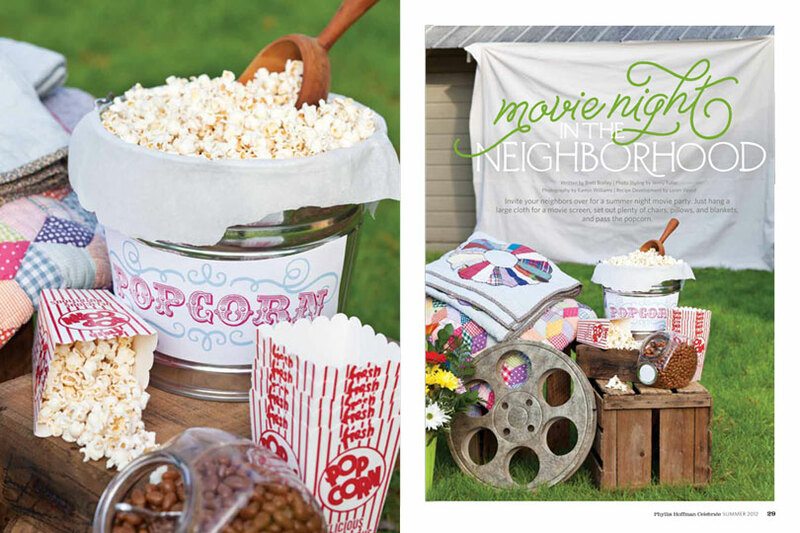 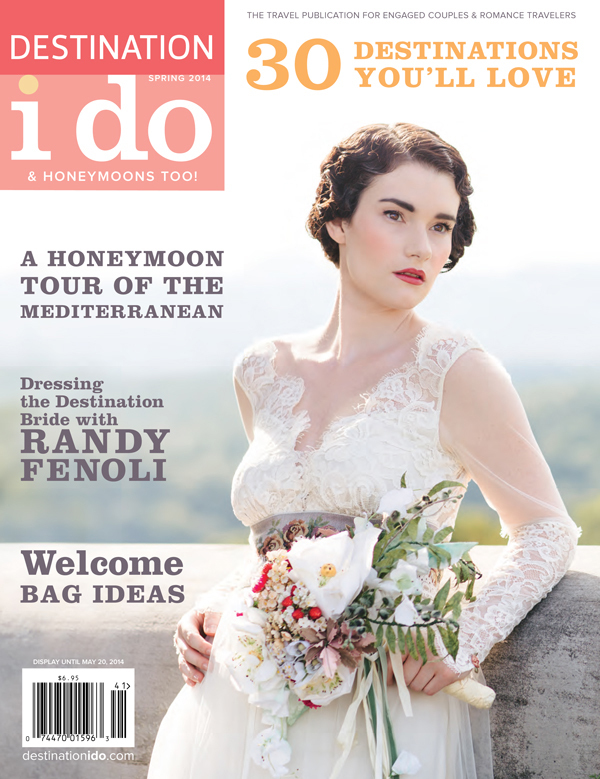 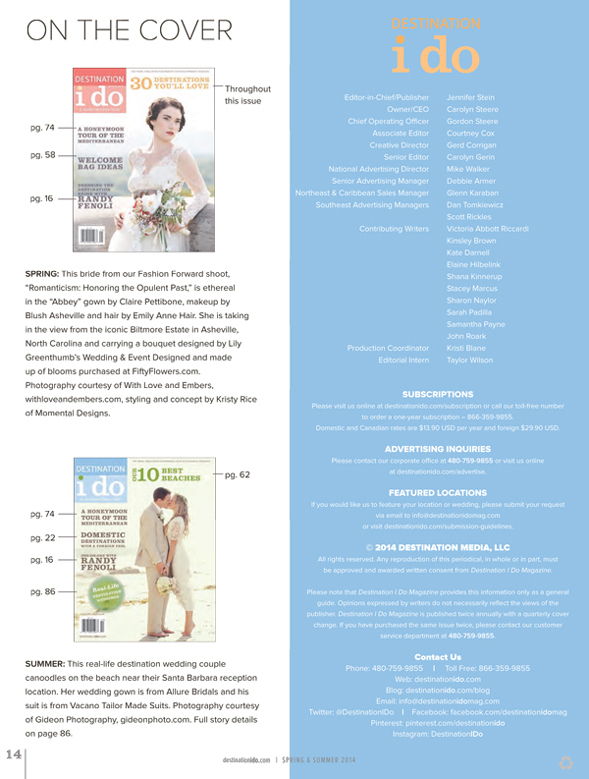 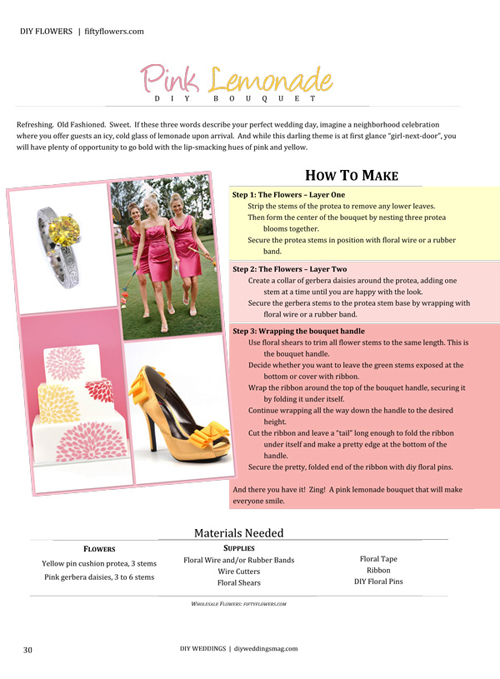 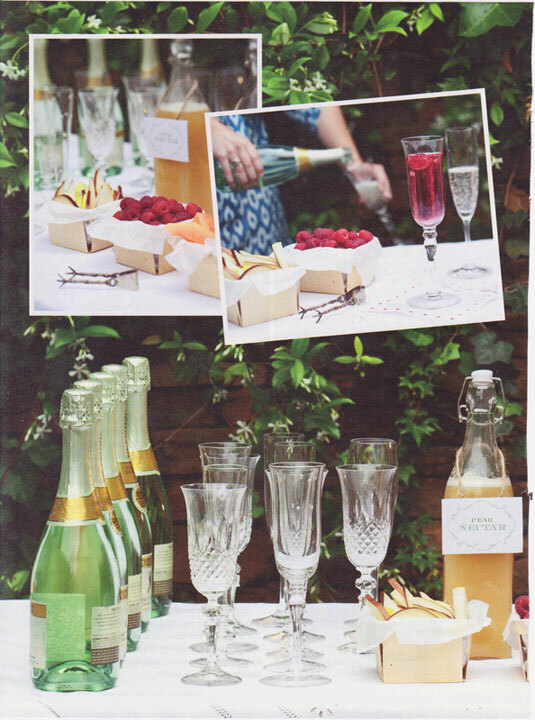 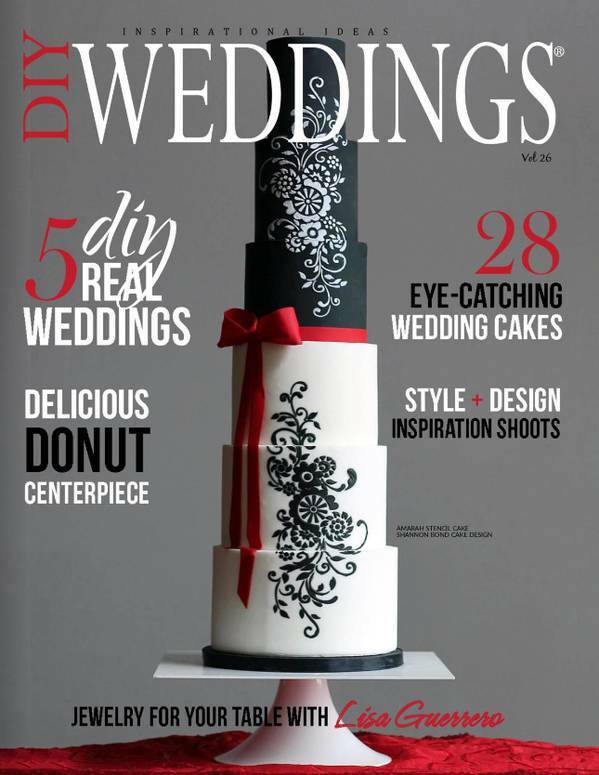 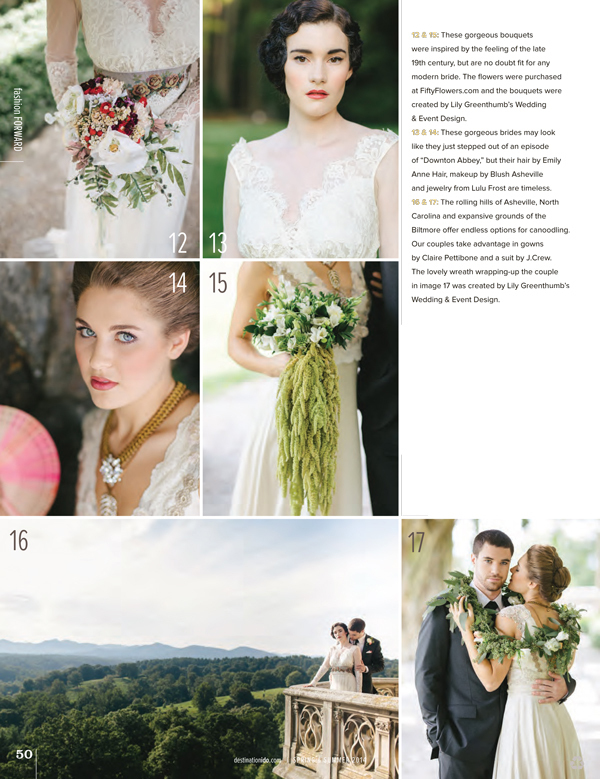 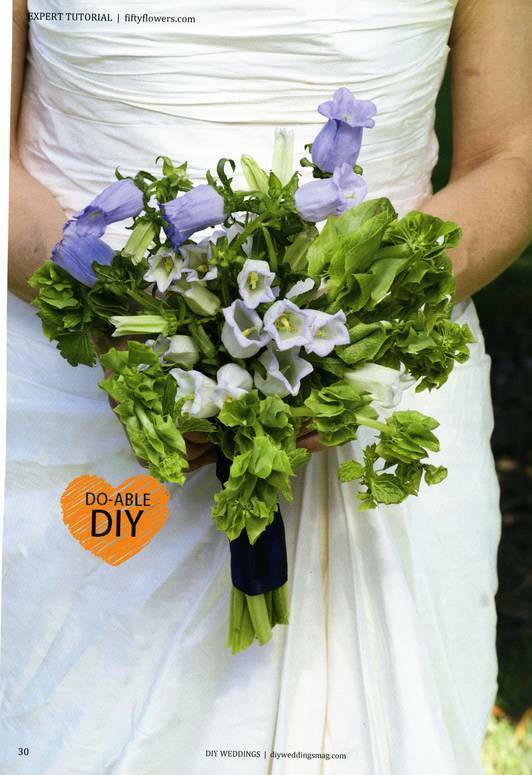 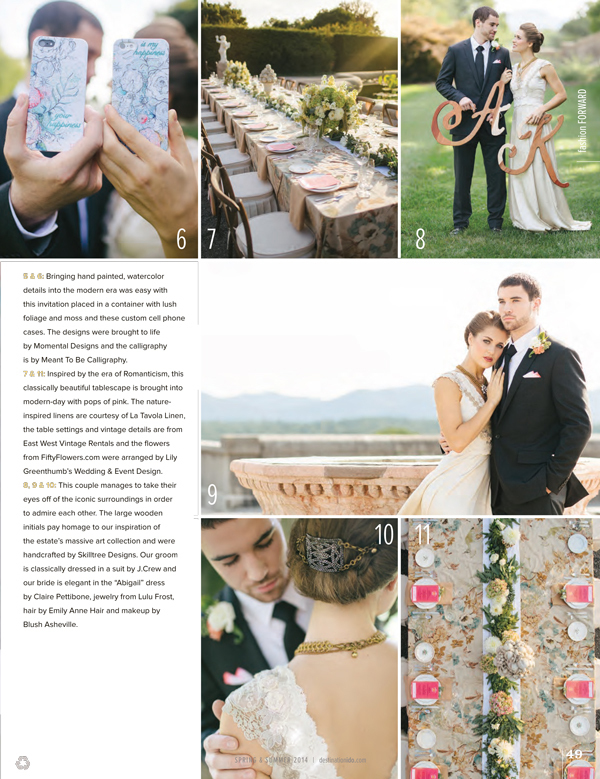 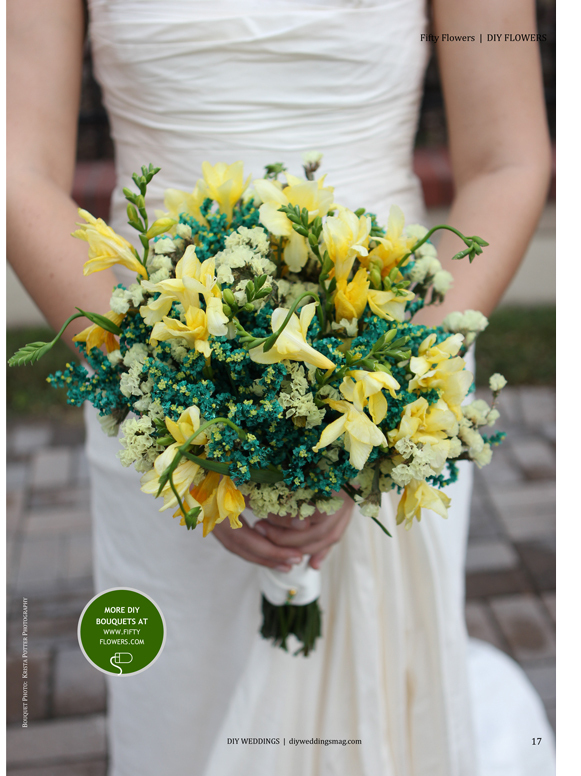 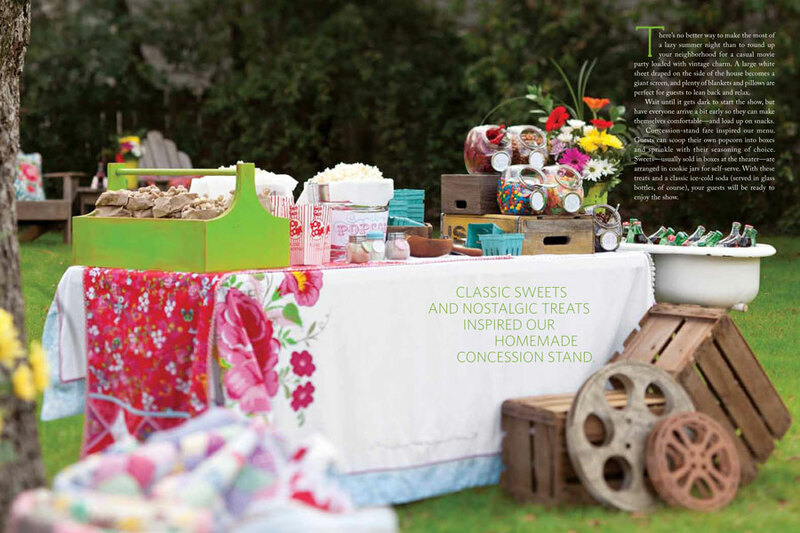 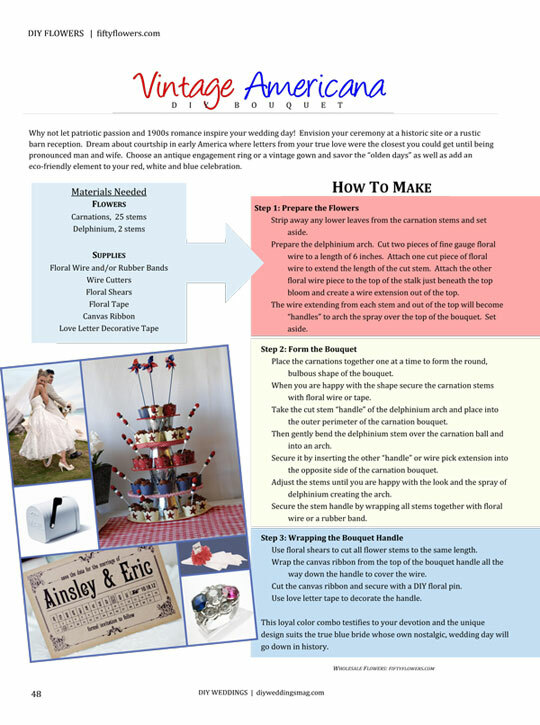 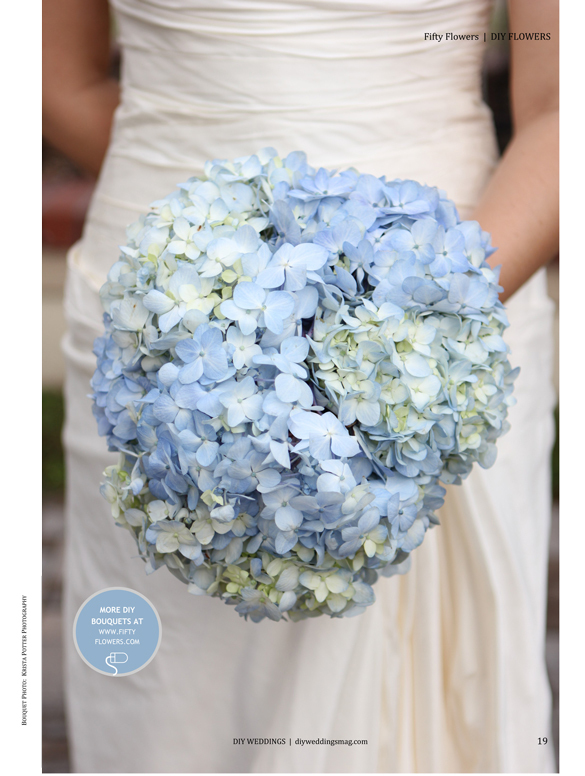 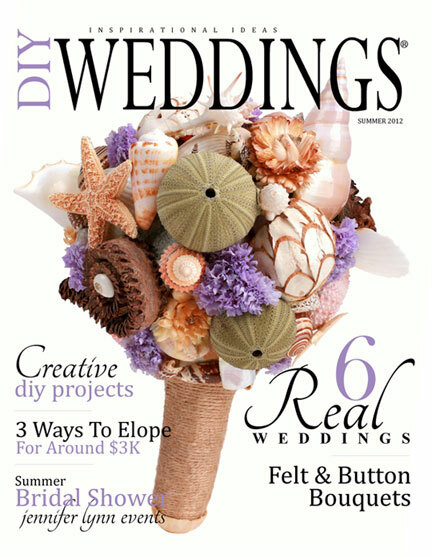 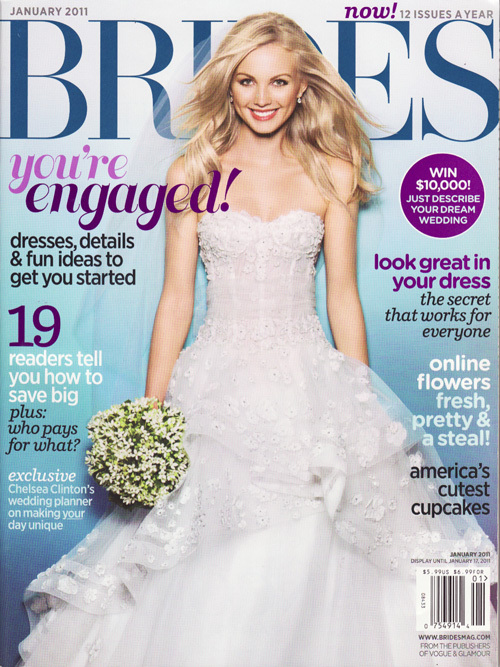 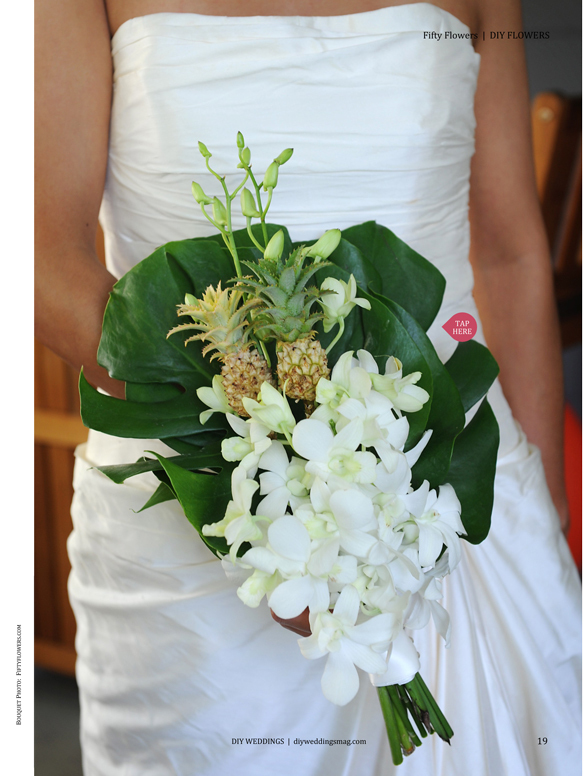 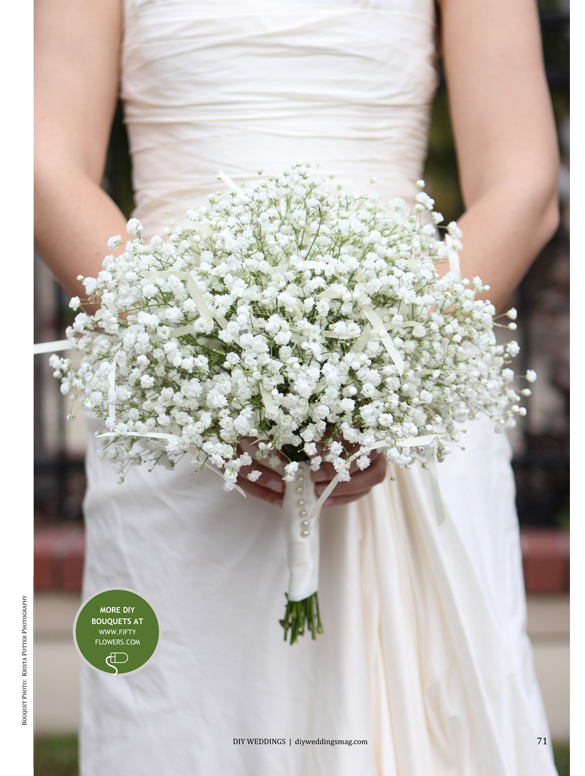 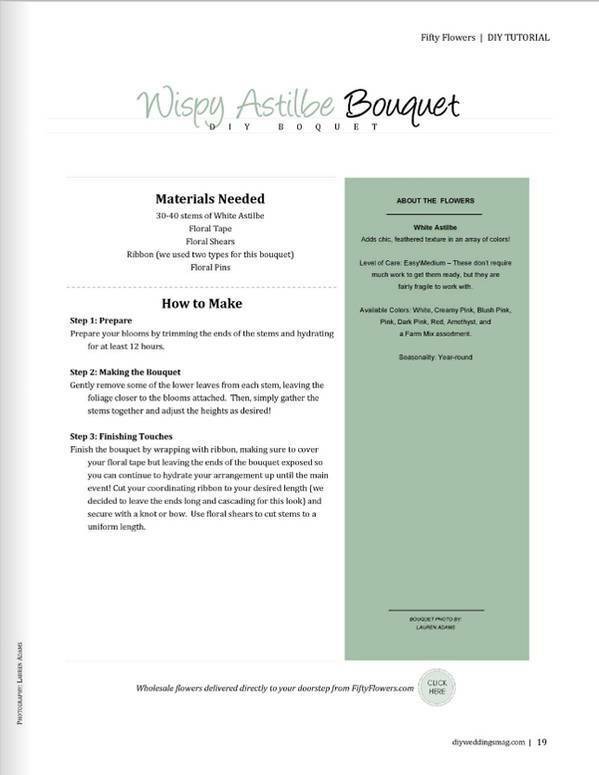 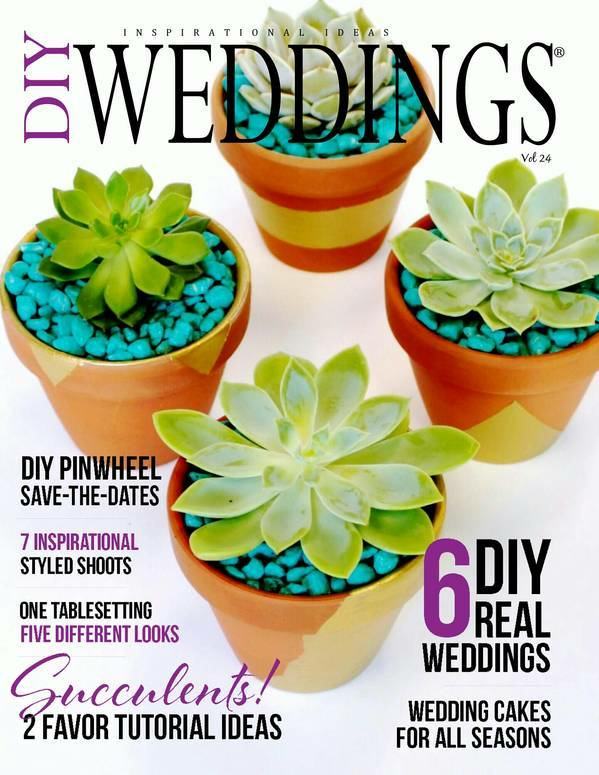 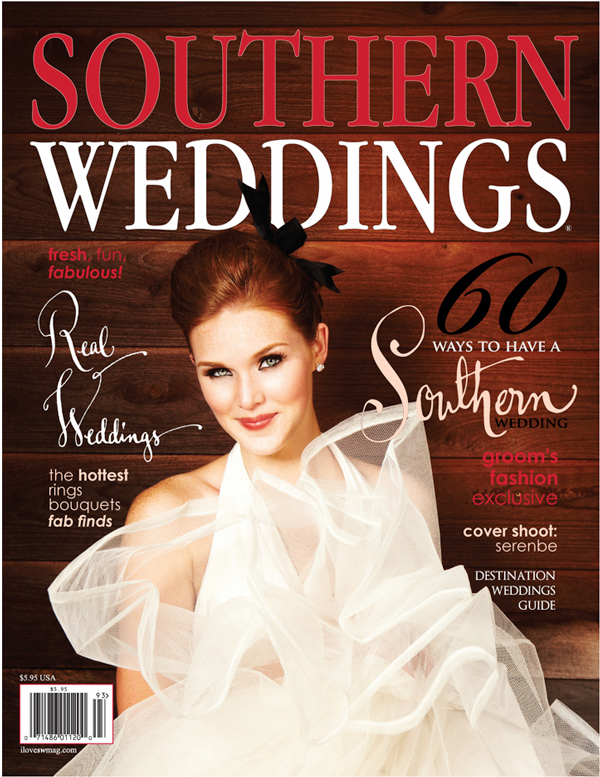 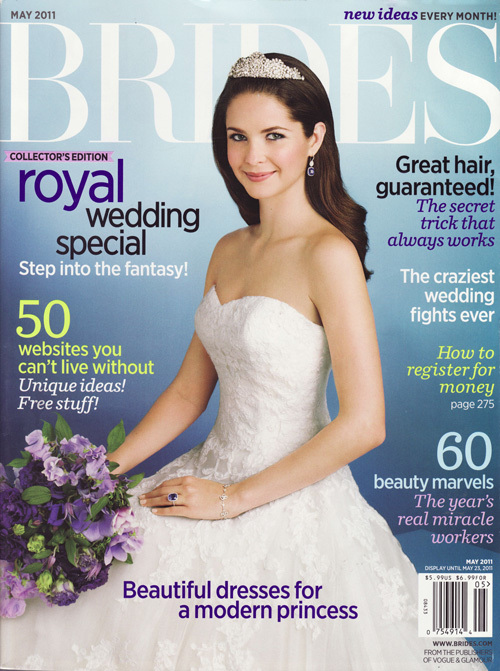 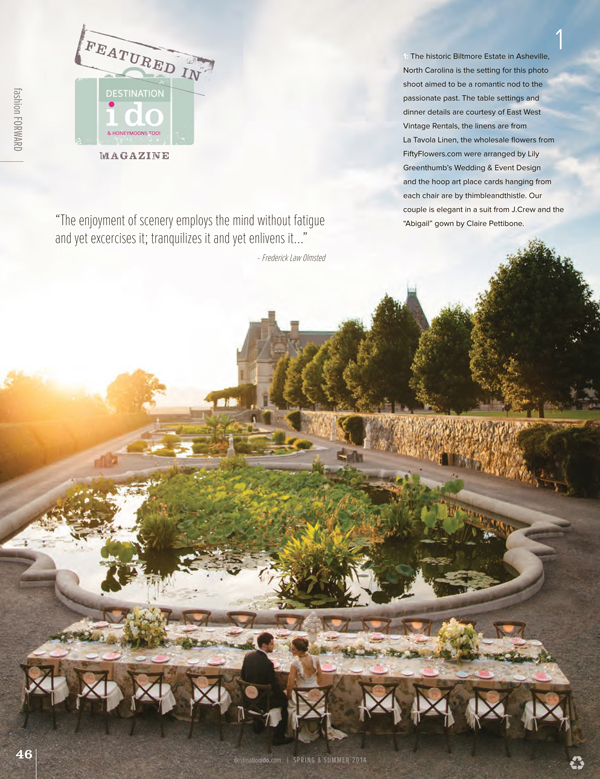 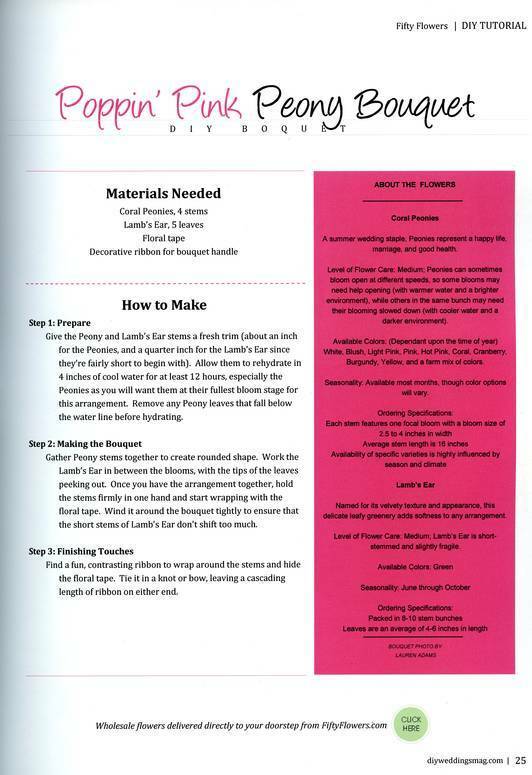 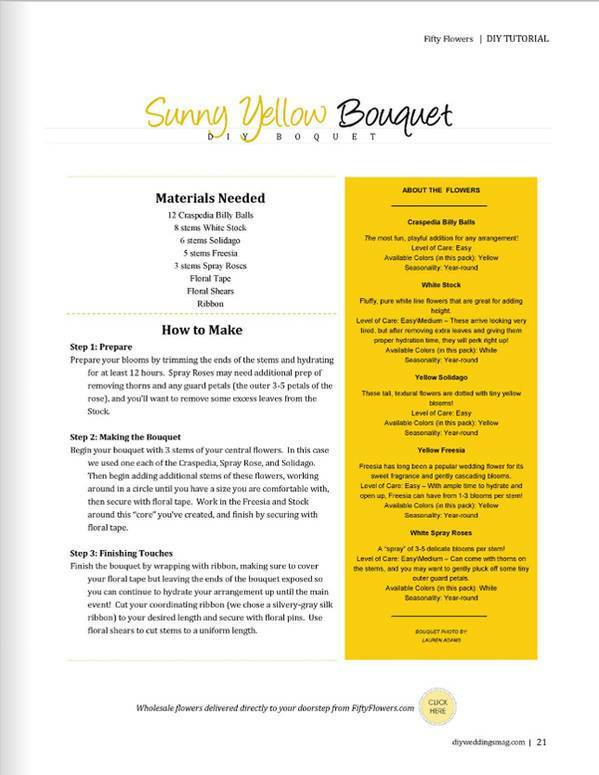 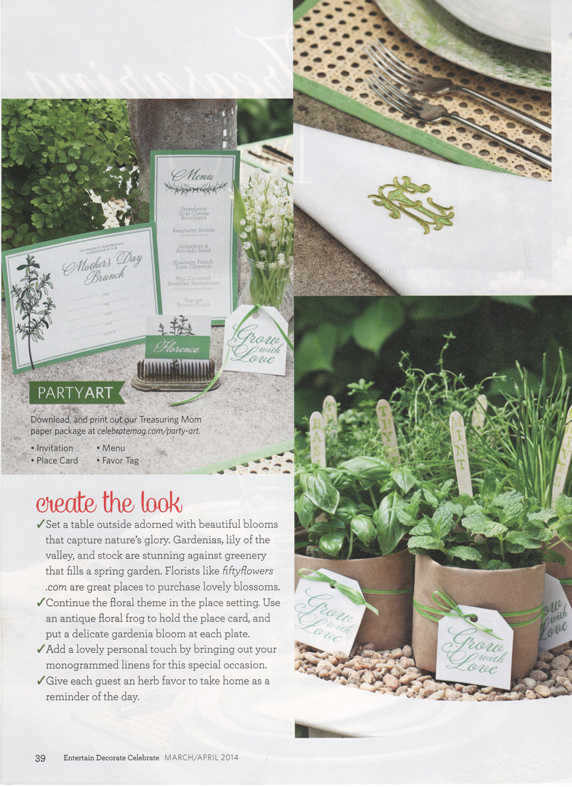 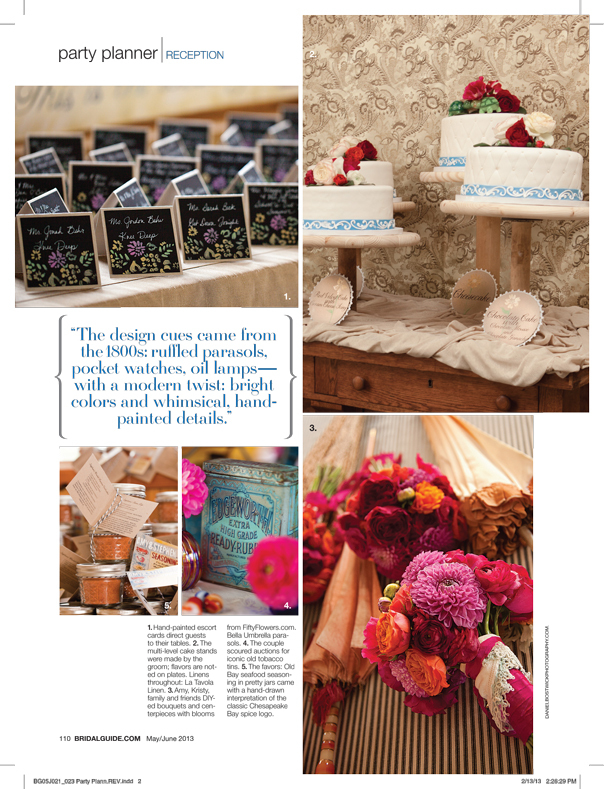 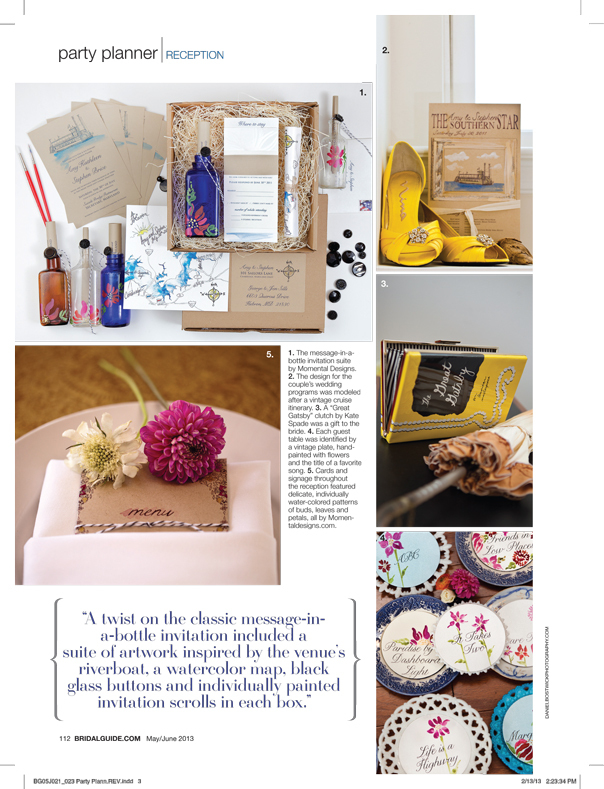 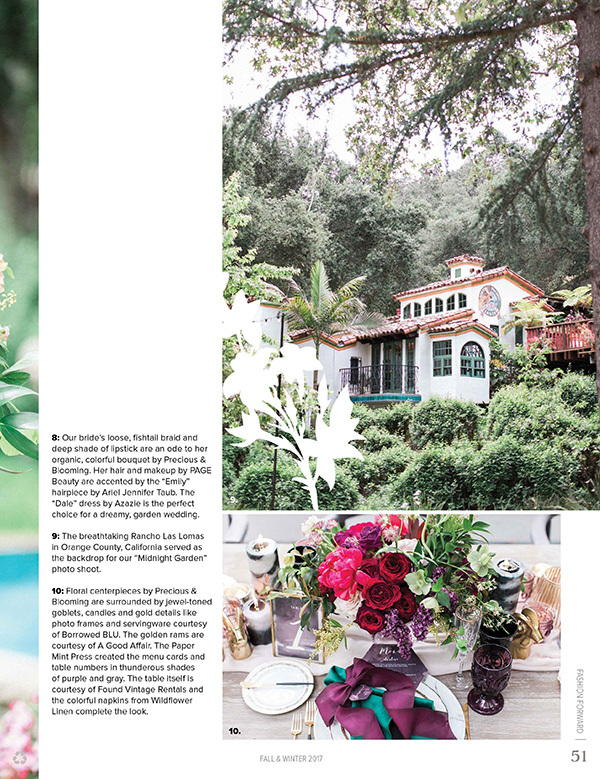 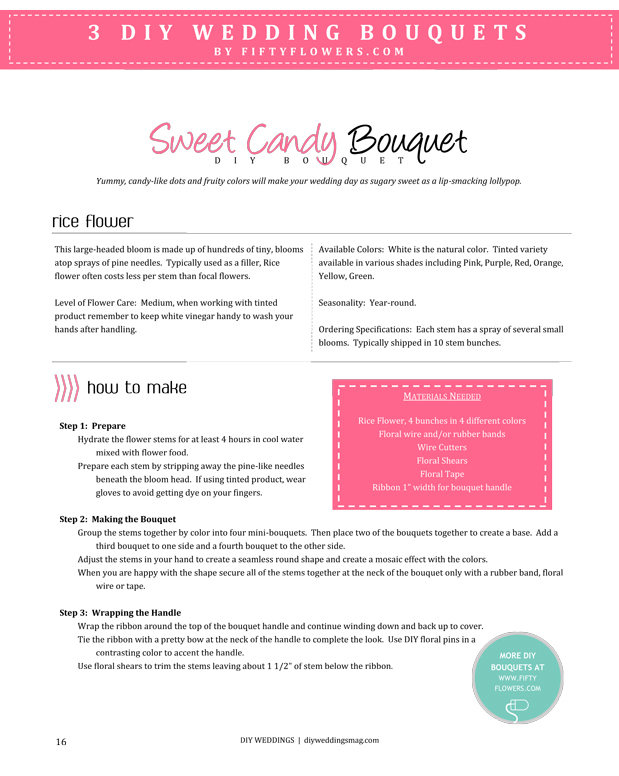 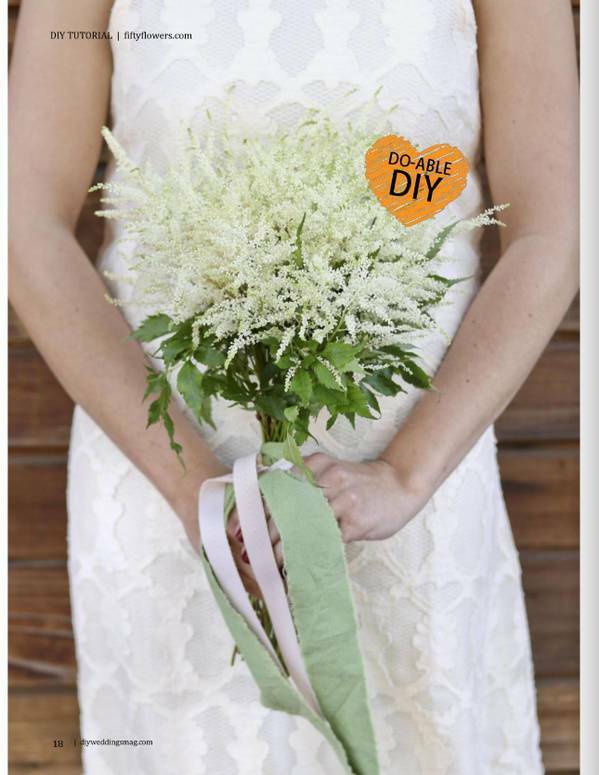 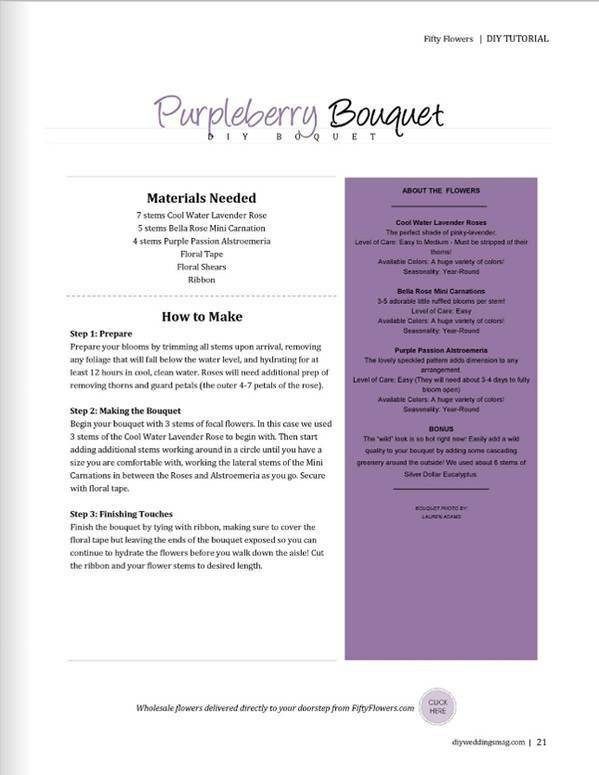 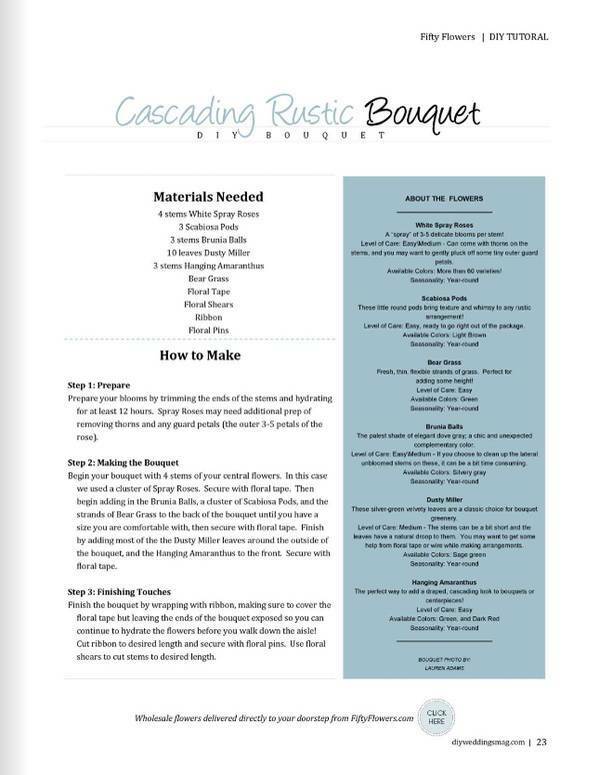 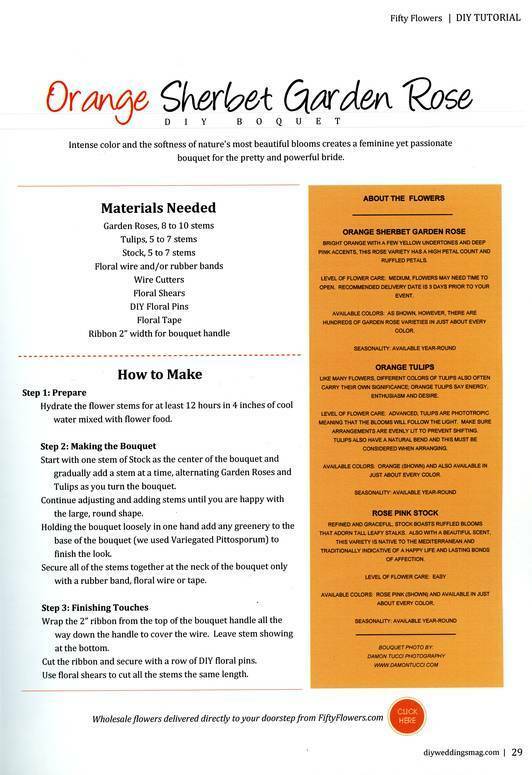 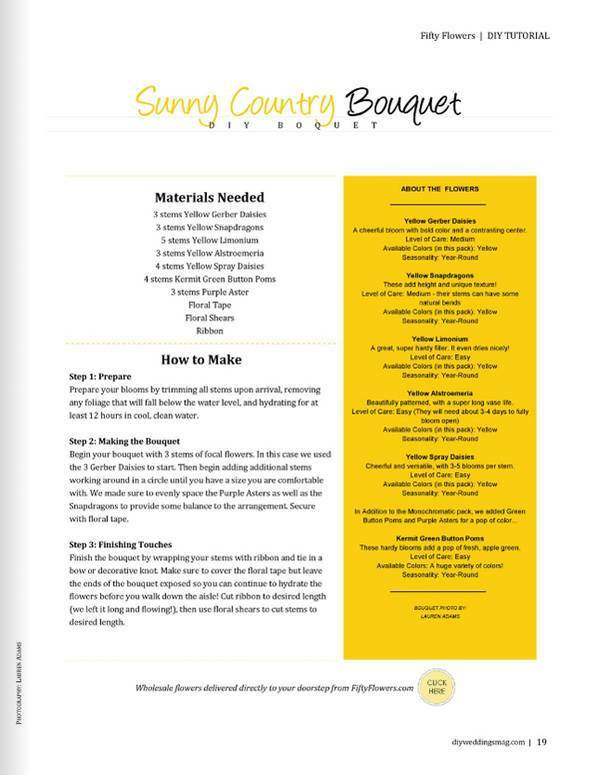 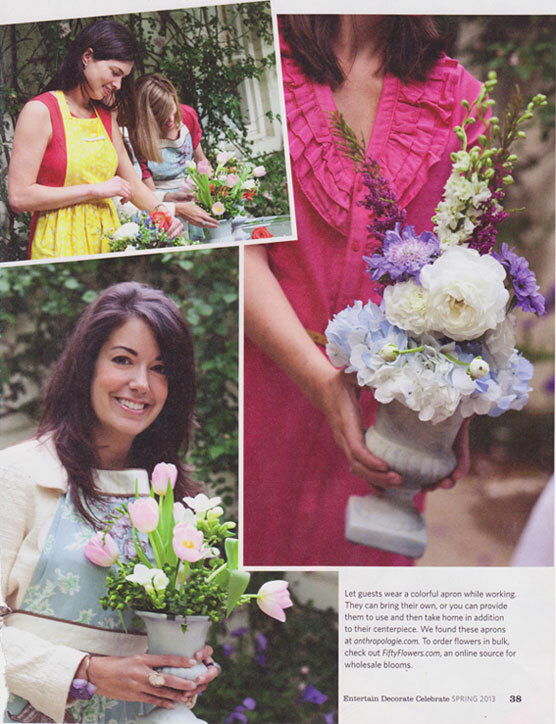 This Summer issue features 3 DIY Wedding Bouquets by FiftyFlowers.com! 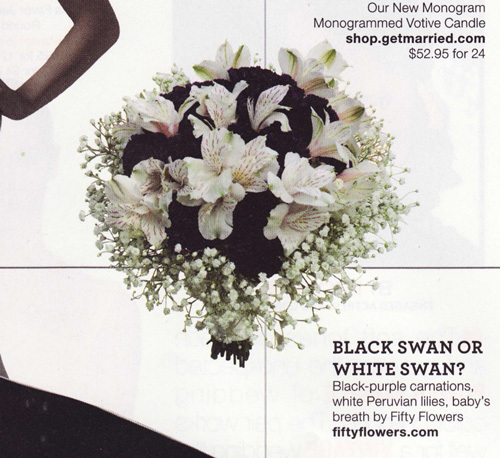 Black Swan or White Swan? 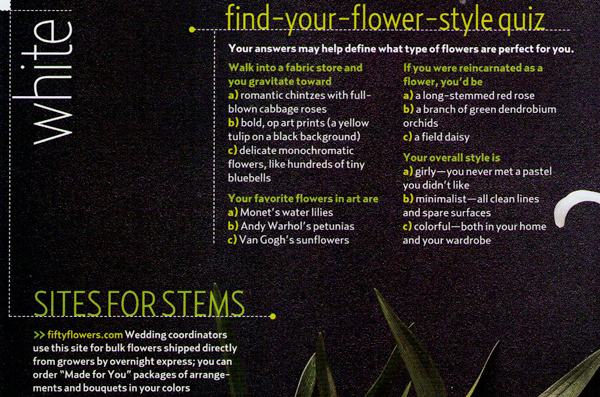 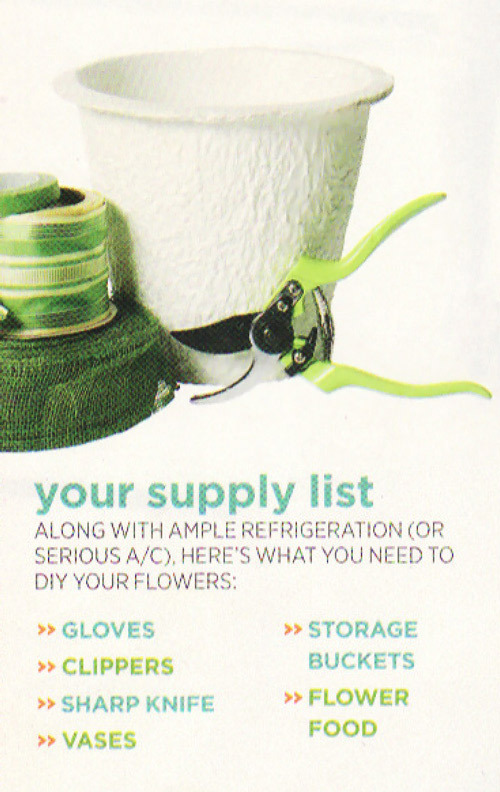 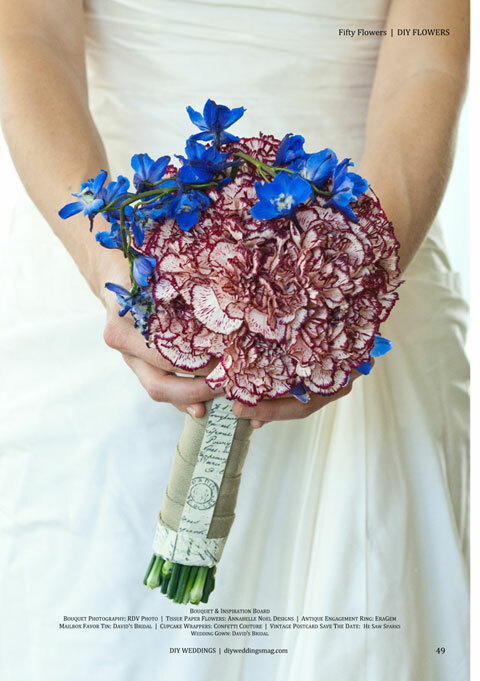 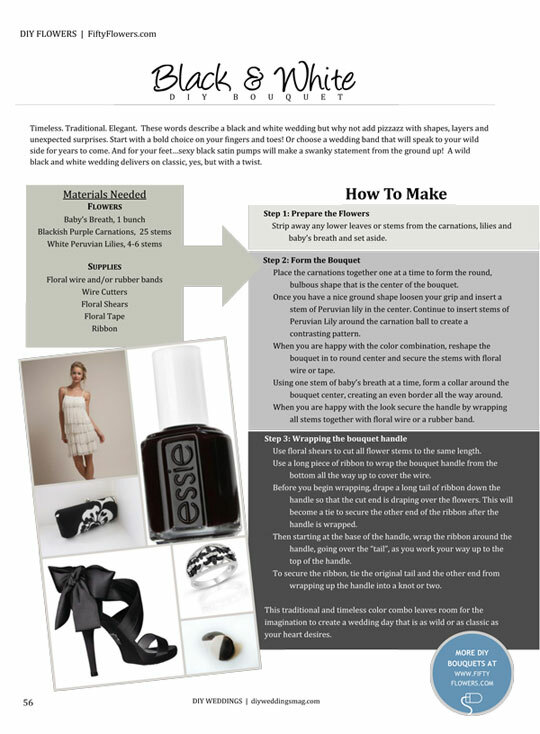 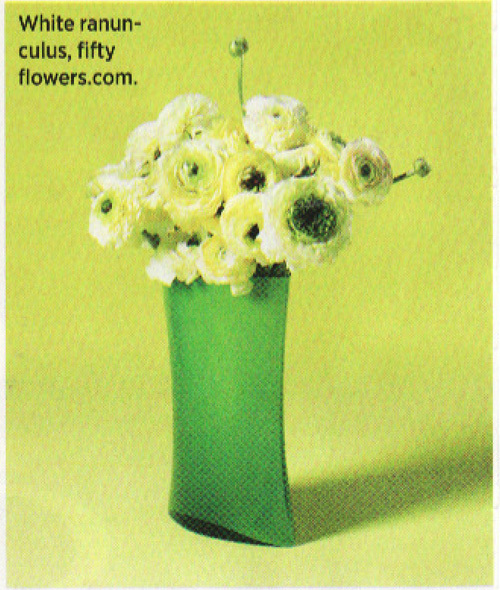 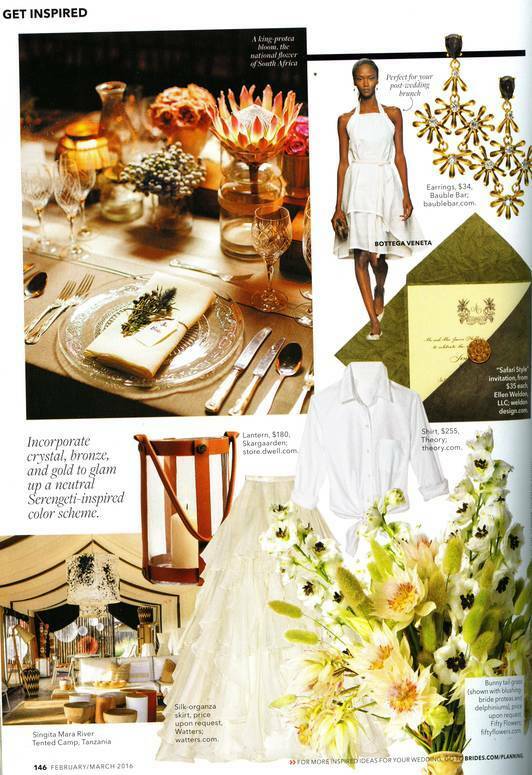 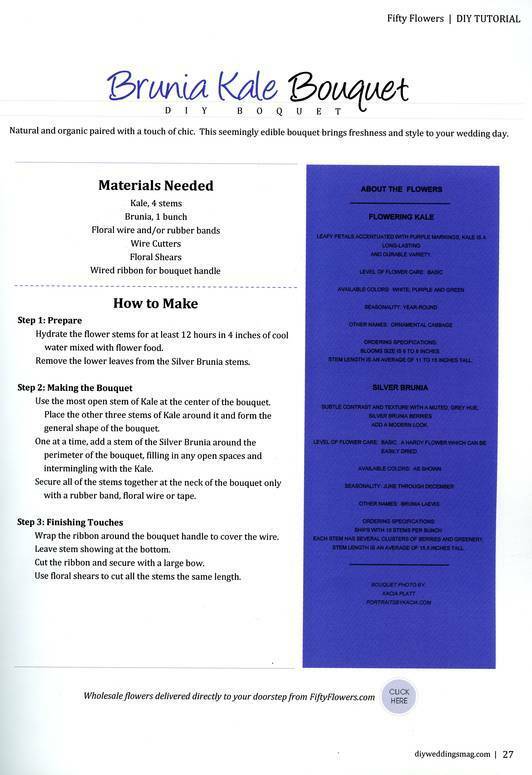 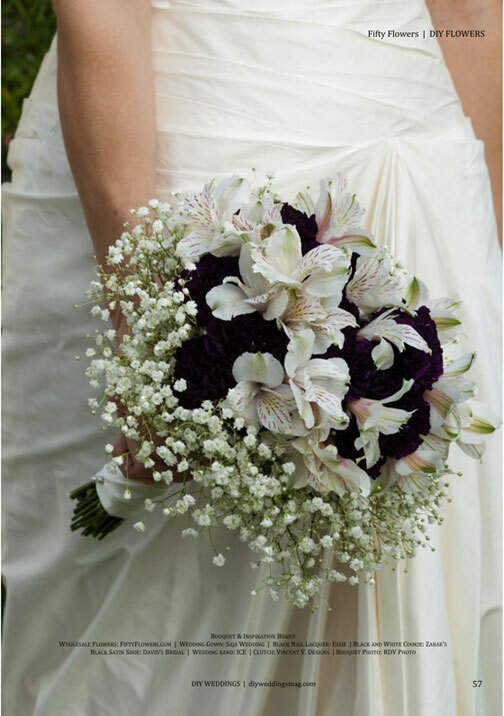 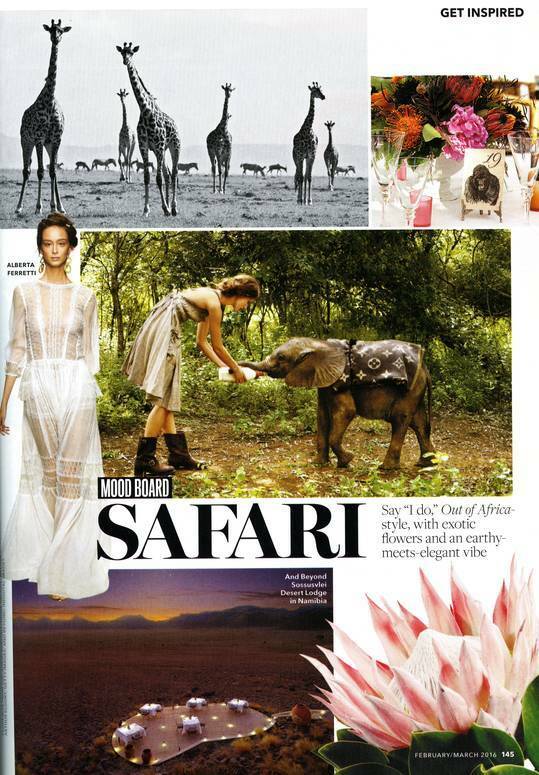 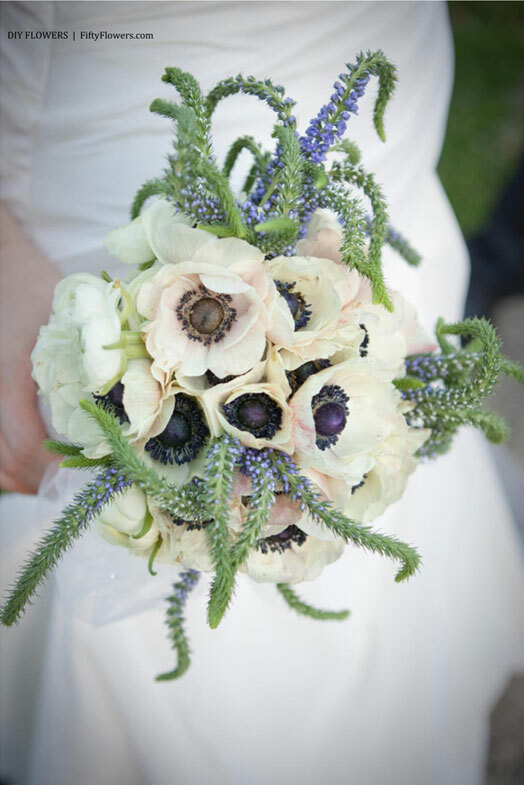 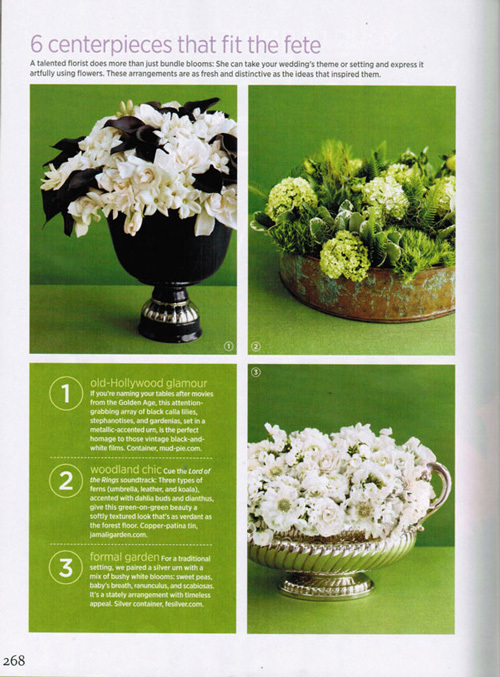 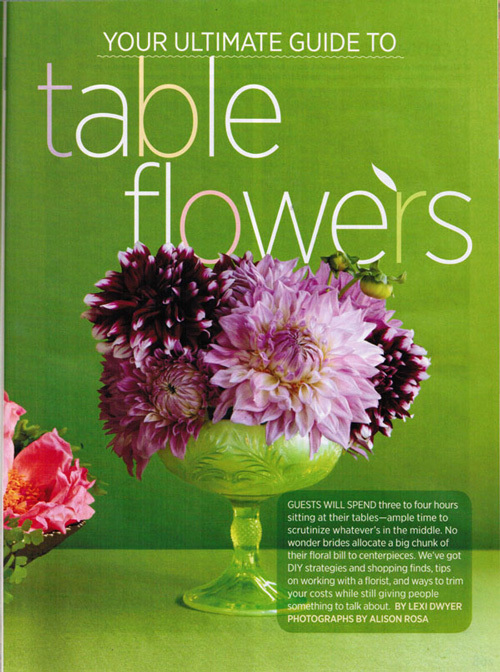 "Black-purple Carnations, white Peruvian lilies, baby's breath by FiftyFlowers.com"
Listed as the top "Sites For Stems"